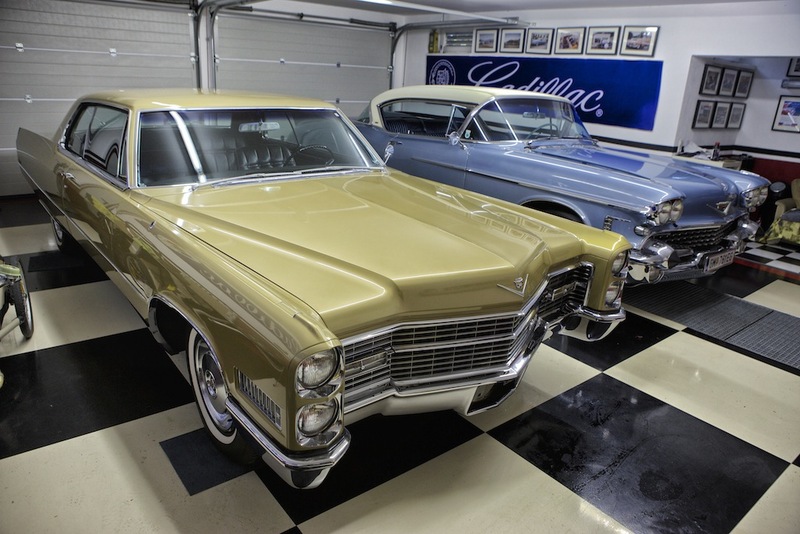 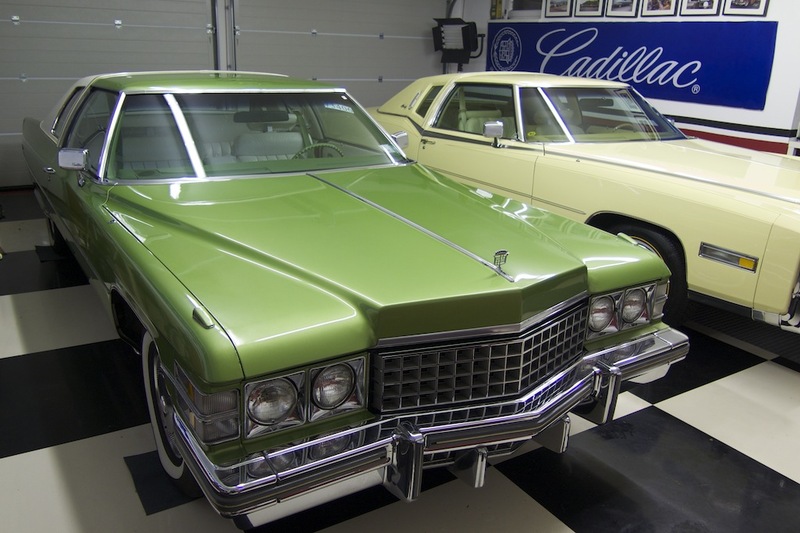 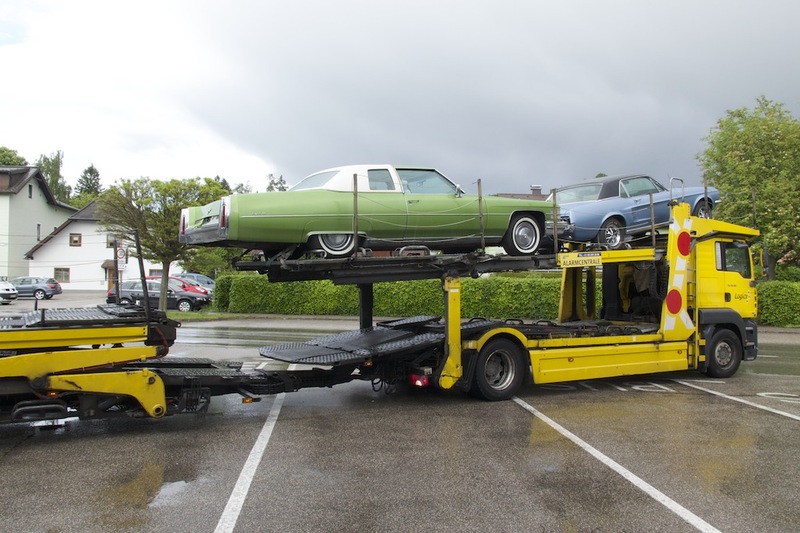 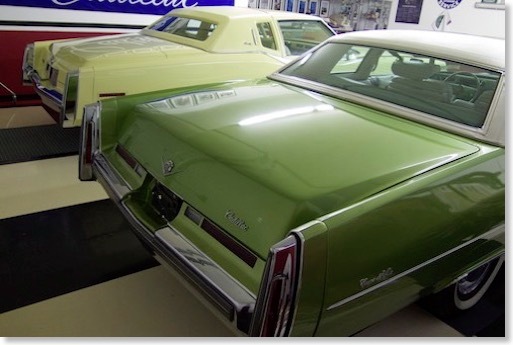 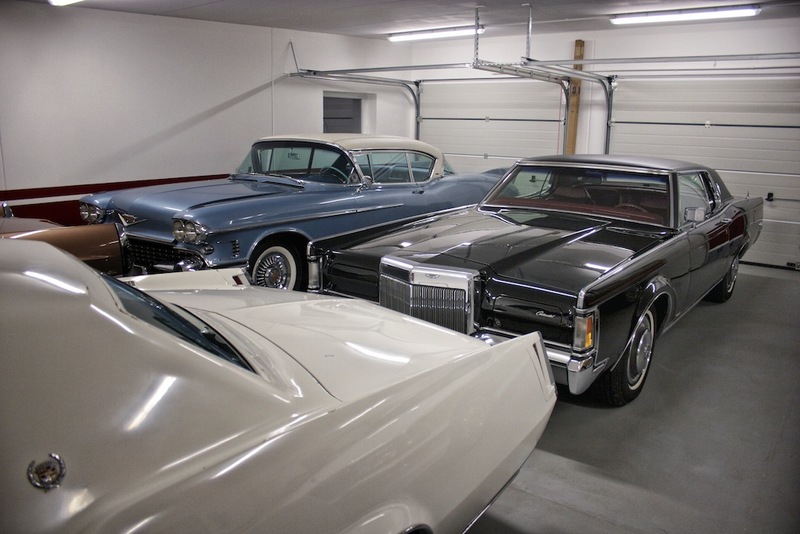 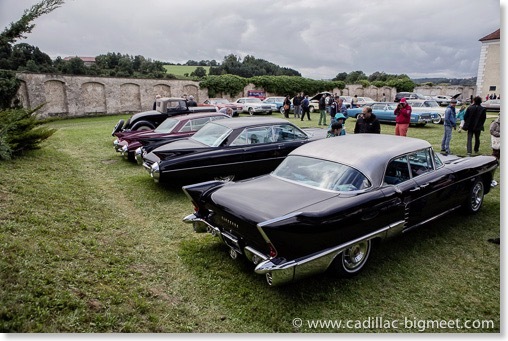 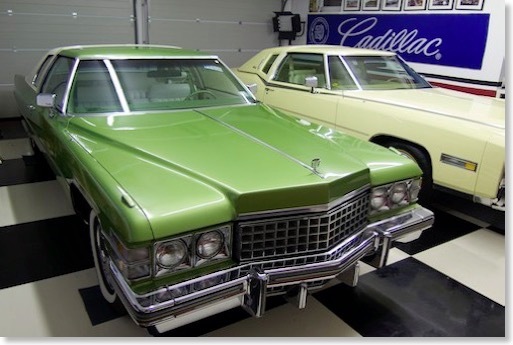 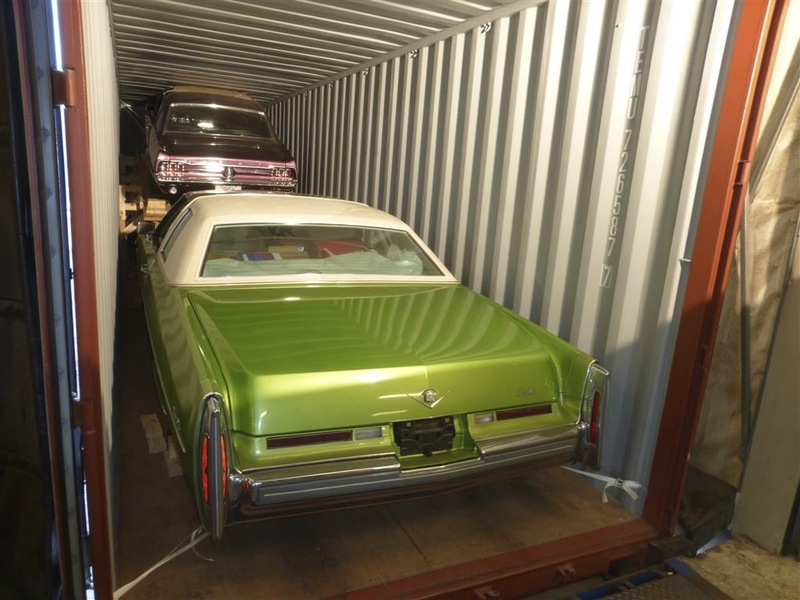 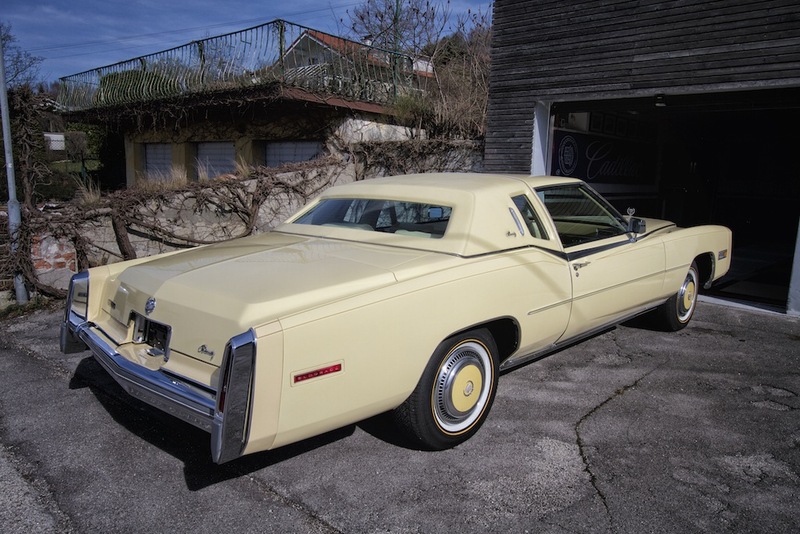 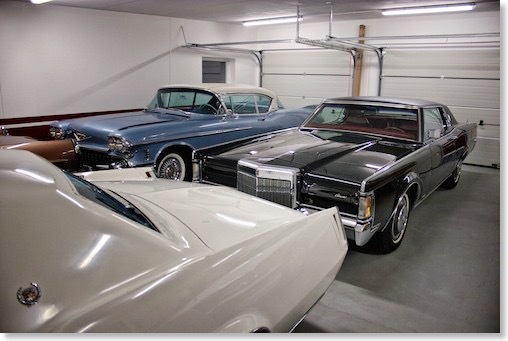 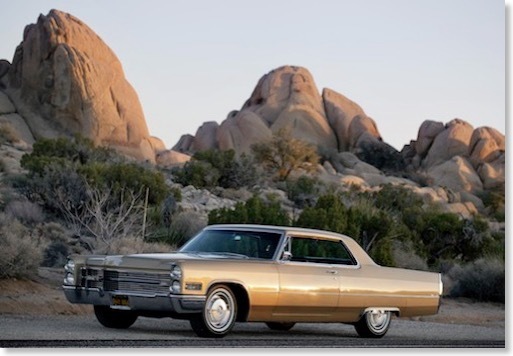 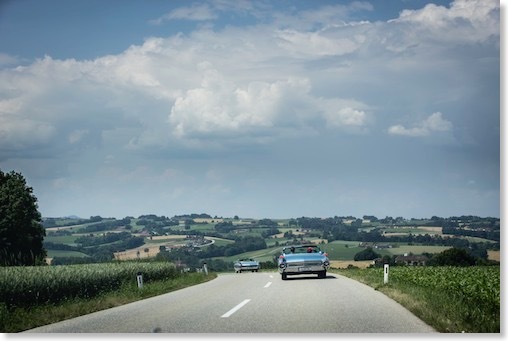 Archives for 2014 | Geralds 1958 Cadillac Eldorado Seville, 1967 Cadillac Deville,1967 Cadillac Eldorado, 1971 Lincoln Continental Mark III and 1978 Cadillac Eldorado Biarritz. 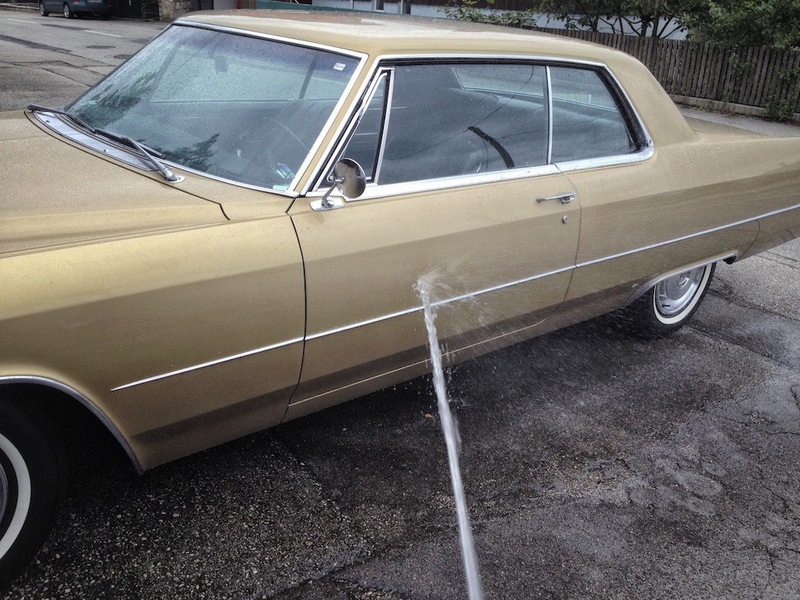 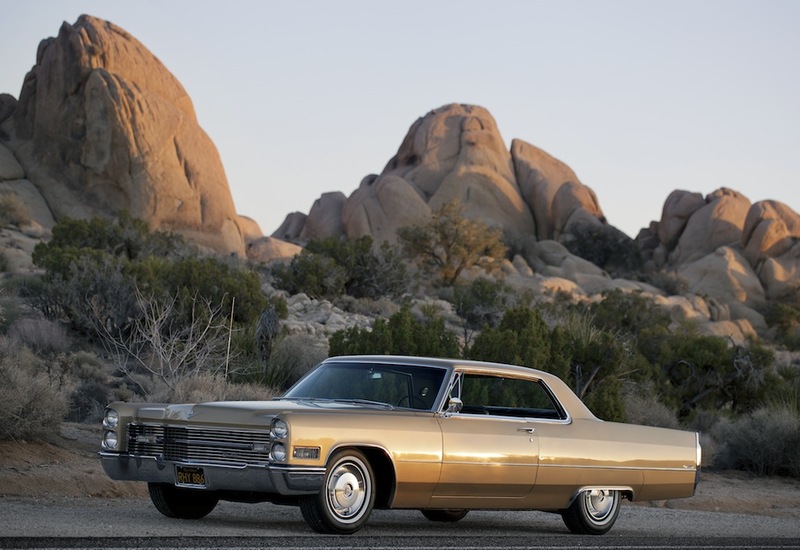 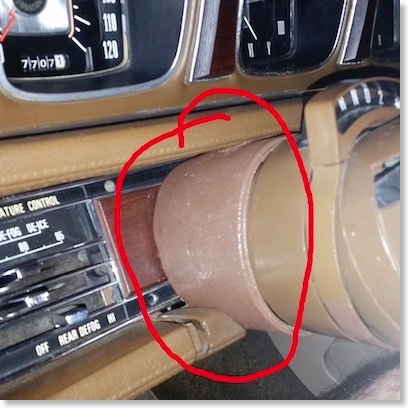 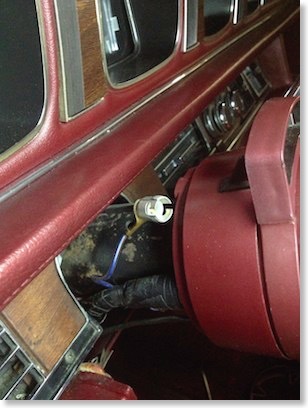 The 1974 Coupe deVille is equipped with automatic seat back release locks. 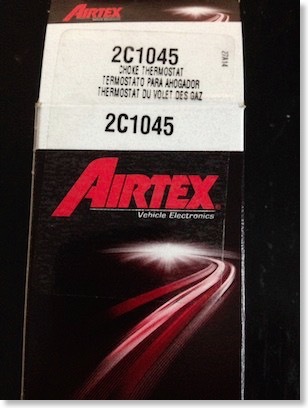 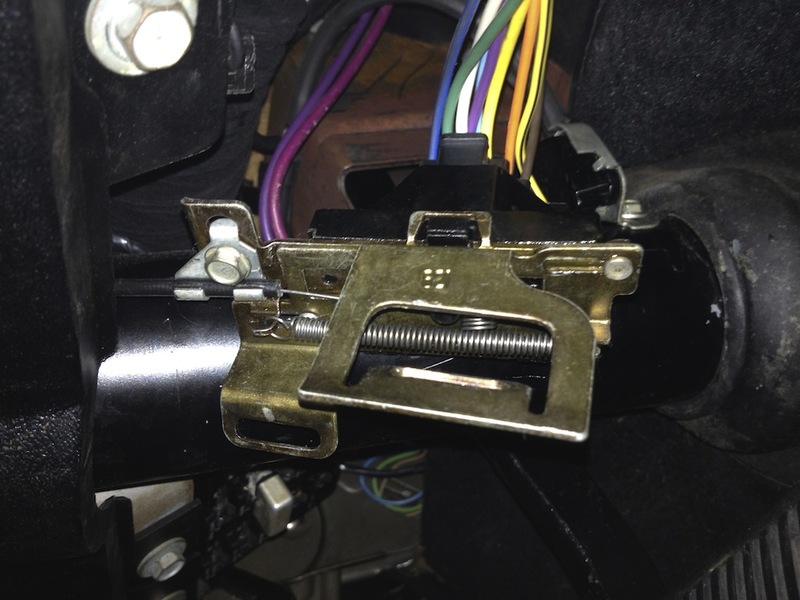 They are actuated by big solenoids which are mounted in the back rest of each front seat. 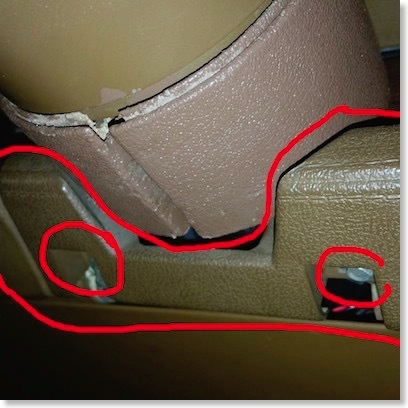 When you open the door they are actuated, and the seat backs can be folded forwards to allow access to the backseats without having to manually unlock the seat. 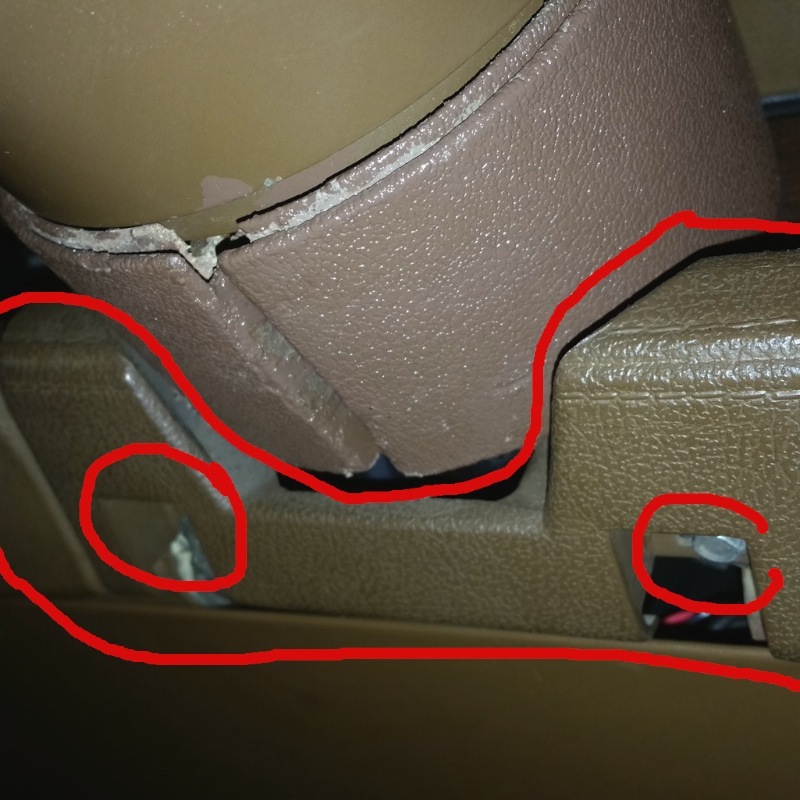 You can hear this "Automatic Seat Back Release" working when you open or close the according door. 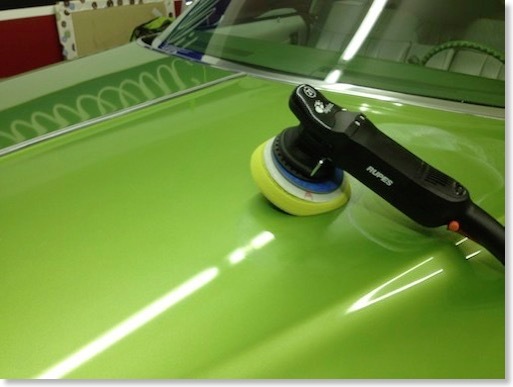 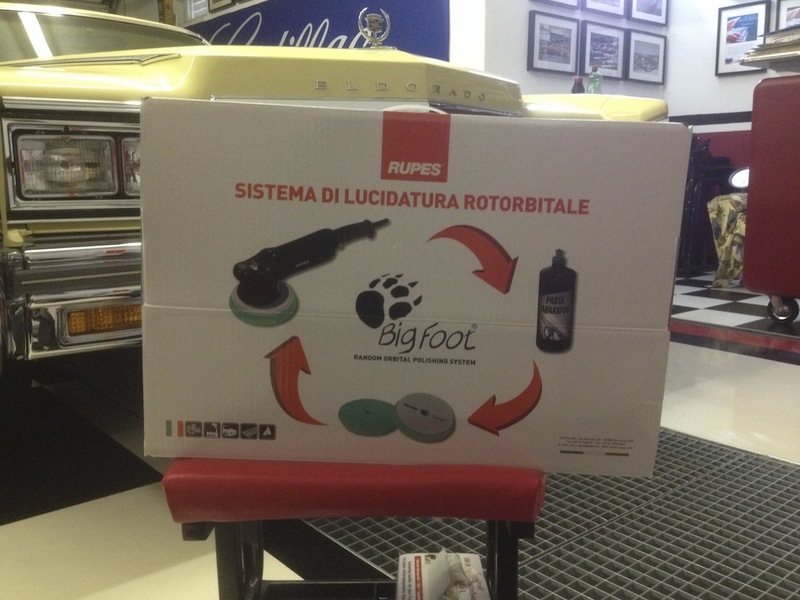 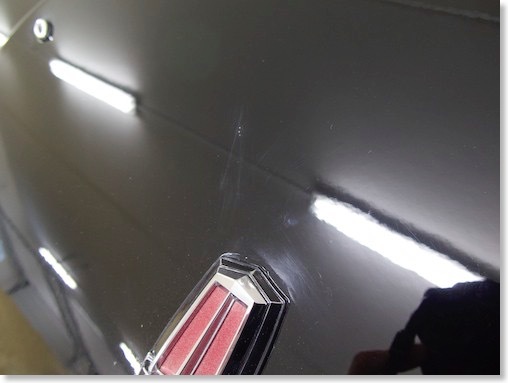 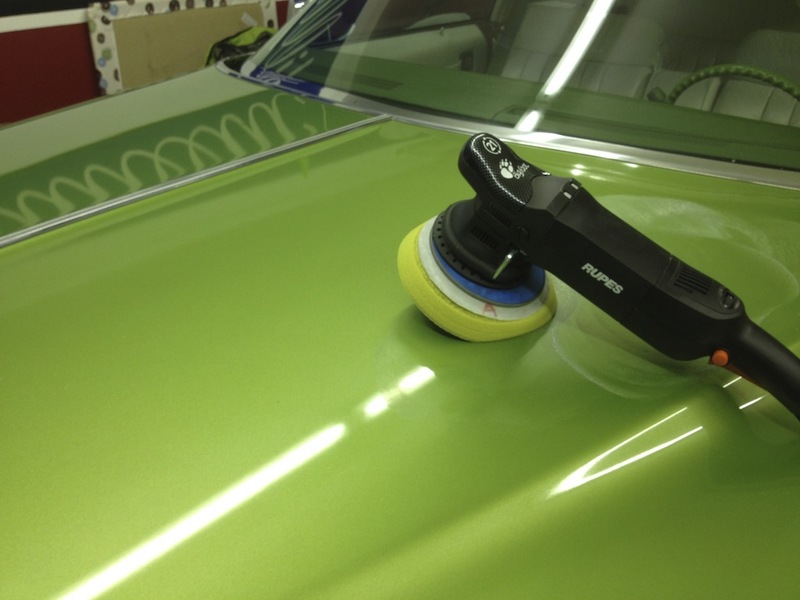 It worked perfectly on the passenger side, and most of the time on the driver side. When the door was open though you could sometimes hear a rattling sound from the solenoid as it did not make good contact. 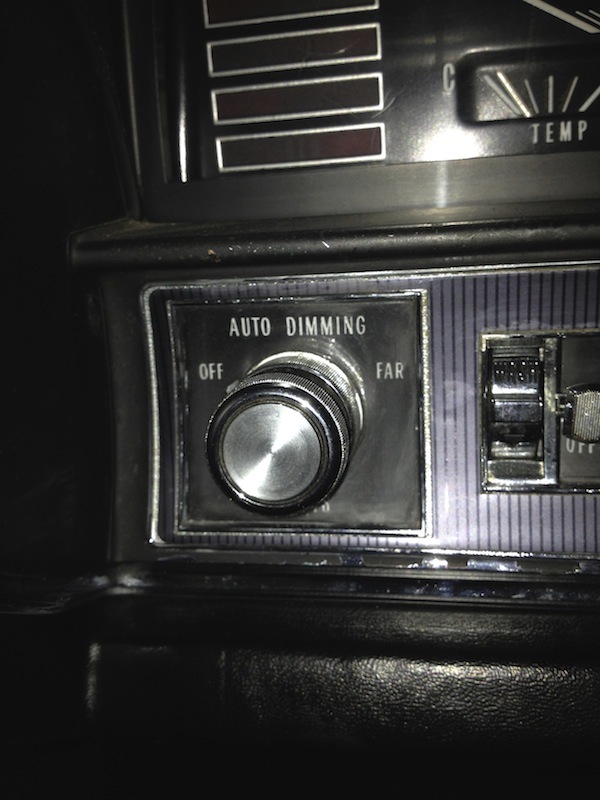 That was not acceptable for my standards of course. 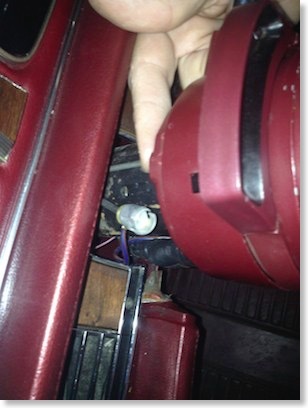 You have to remove most of the back seat material to get to the solenoid unfortunately. 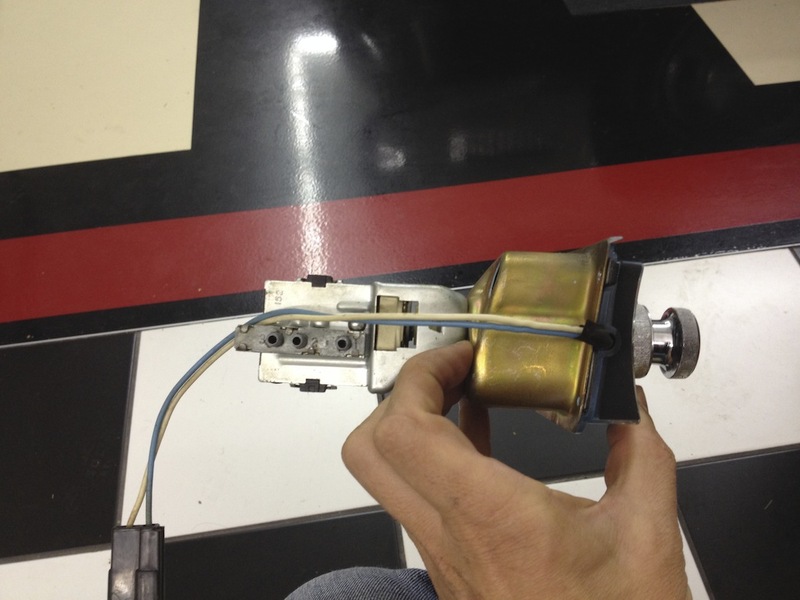 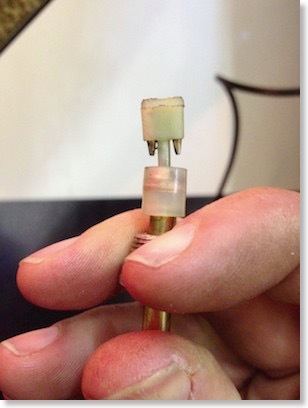 Once we got it out, we took the solenoid apart. 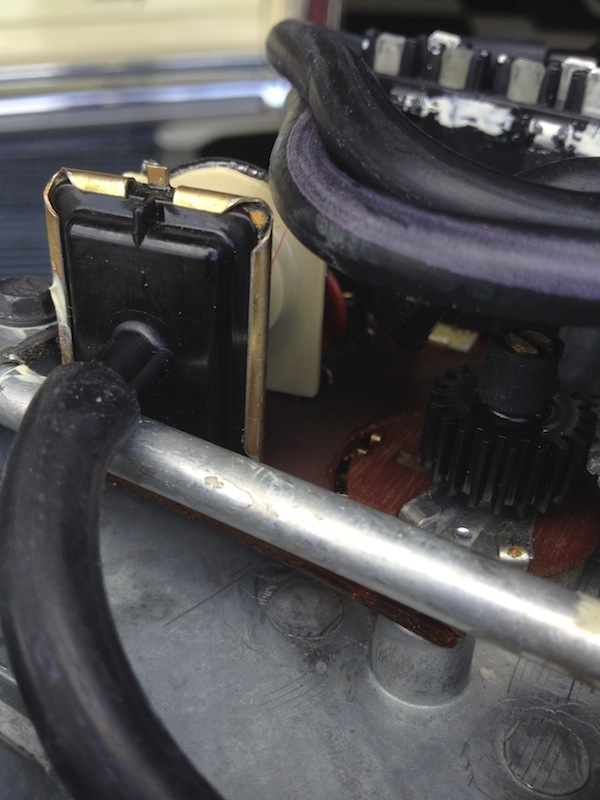 Some of the actuators insulation foam had crumbled inside the end stop of the solenoid - so we replaced that, cleaned and lubricated everything, and put it back together. 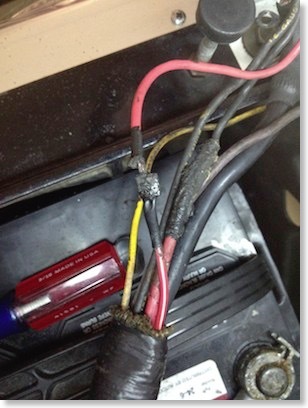 Unfortunately the problem was still there after this. 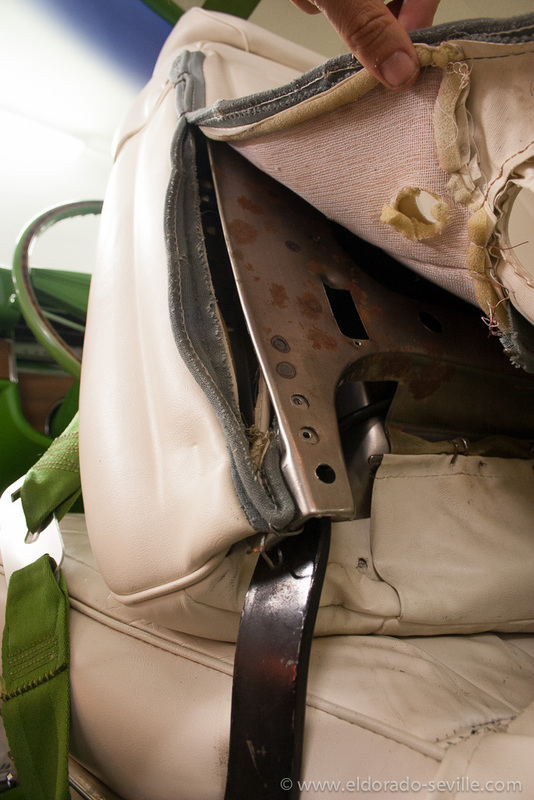 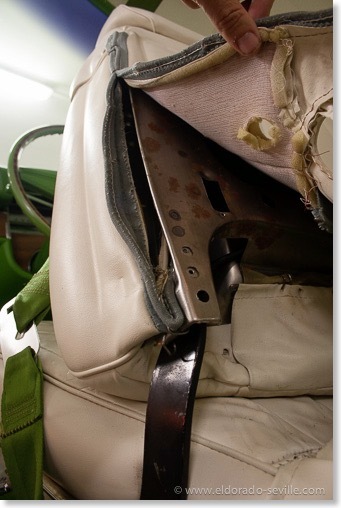 So we eventually found out that the striker where the seat latches, was not adjusted correctly. 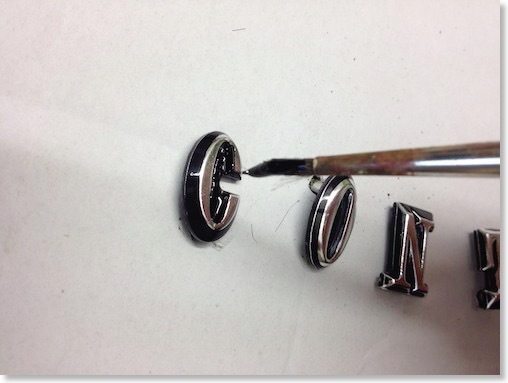 Something must have gone wrong at the factory already. 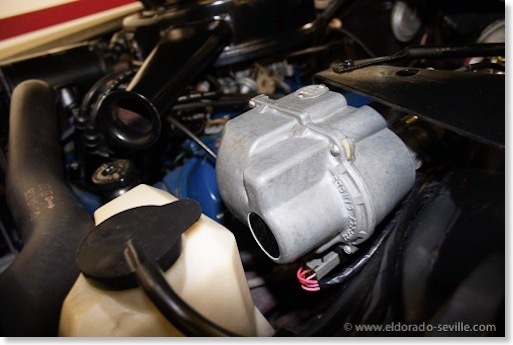 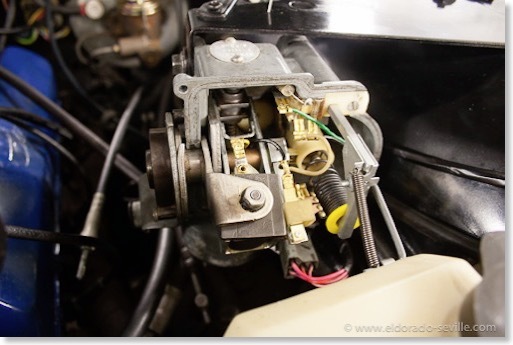 We had to modify it slightly to make it perfect again, so that the solenoid could disengage itself properly when the seat back was in the back position. 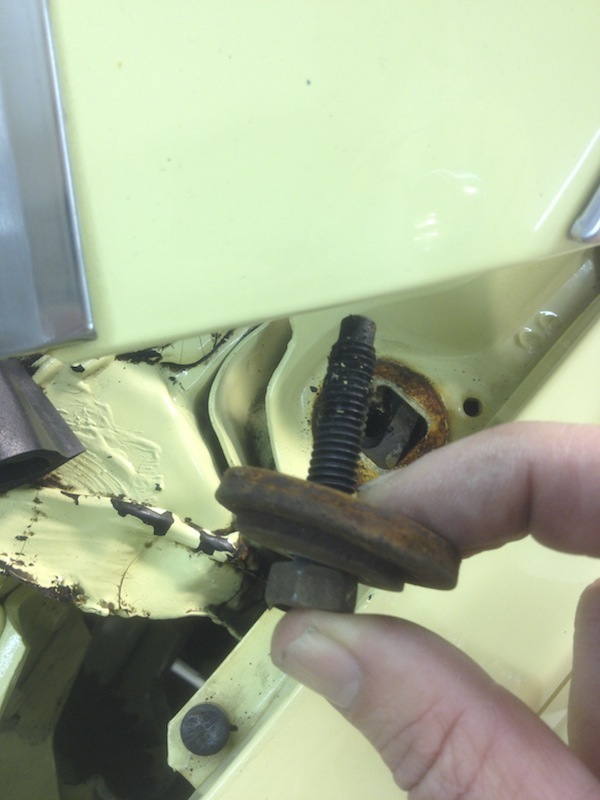 When everything was back together it worked for a while before it broke again. 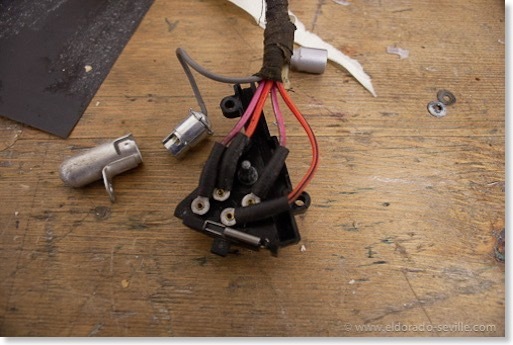 I will have to find a good working solenoid now and replace it once again. 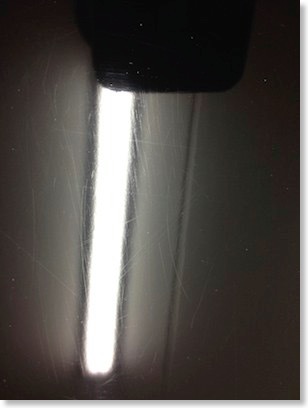 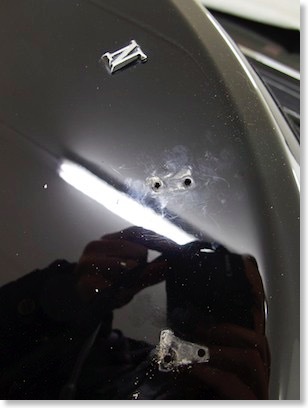 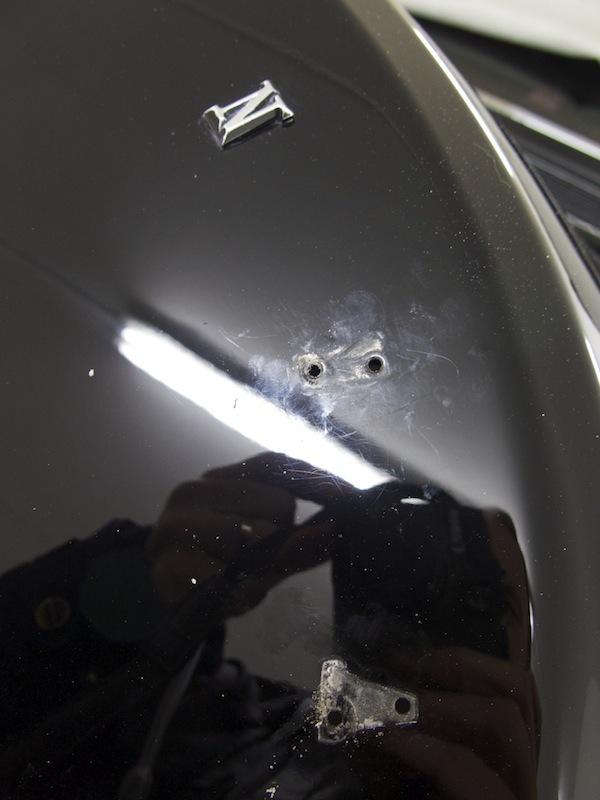 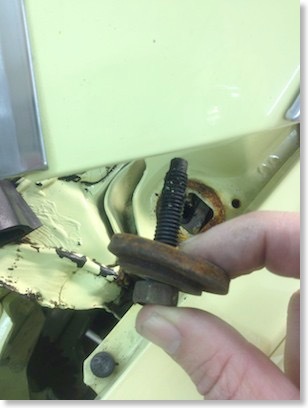 UPDATE: You can read about the final repair here! 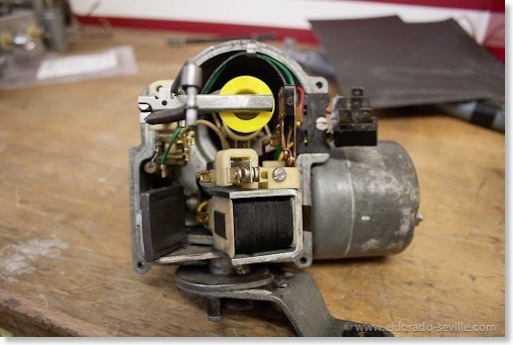 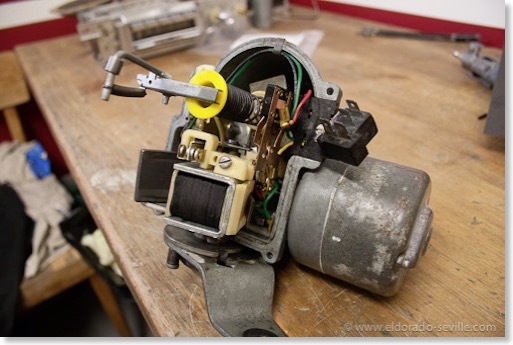 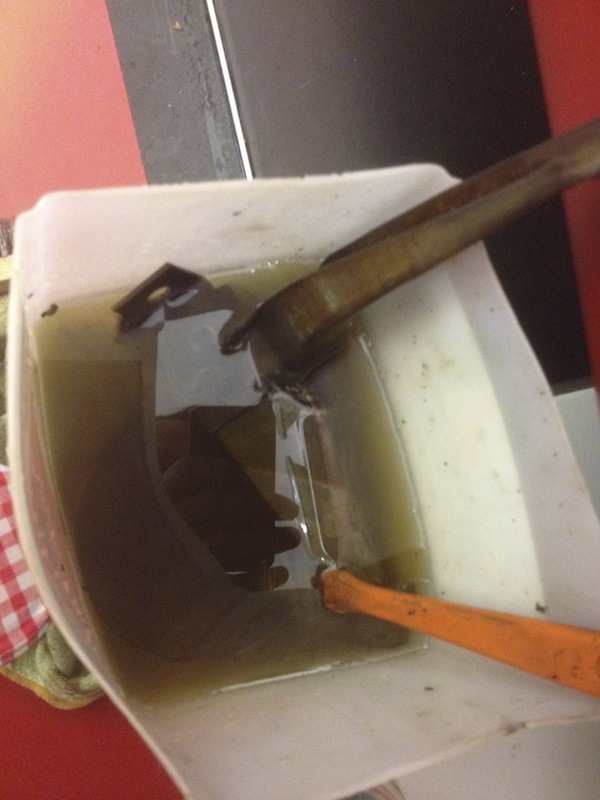 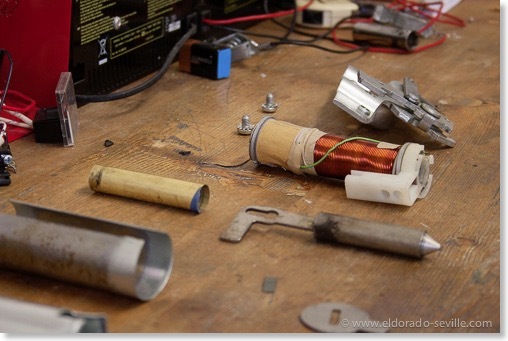 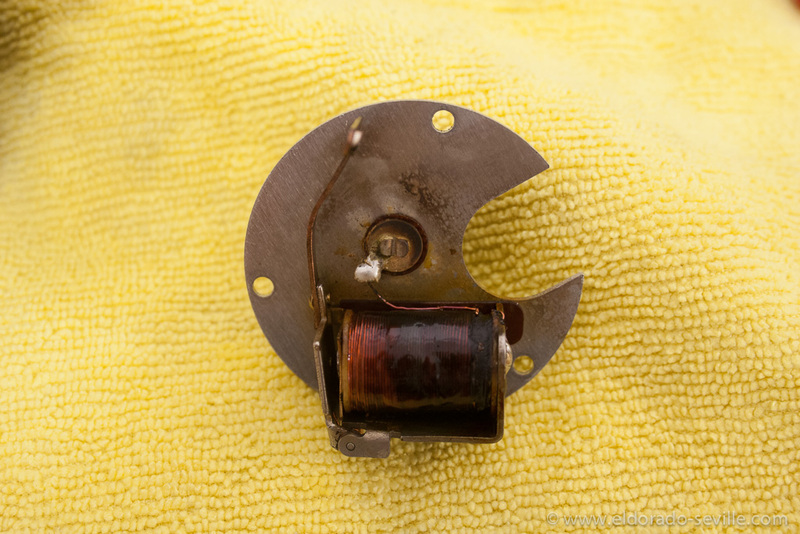 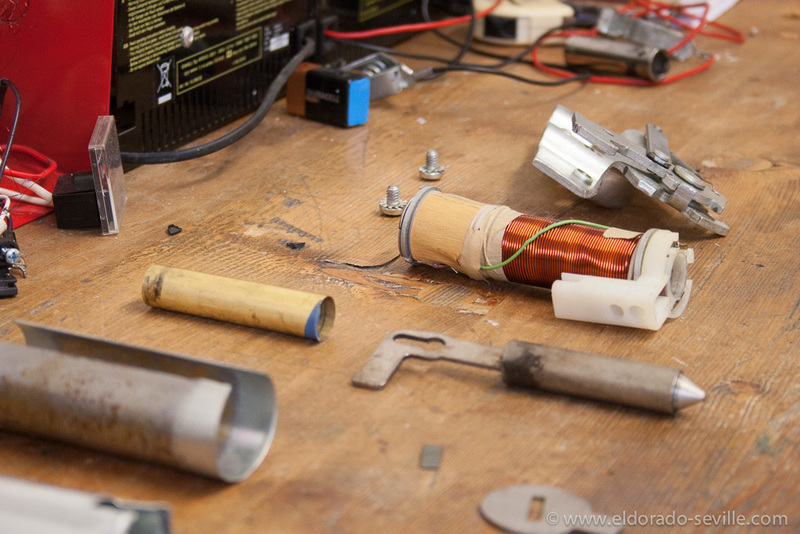 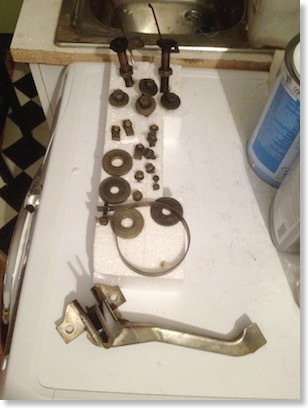 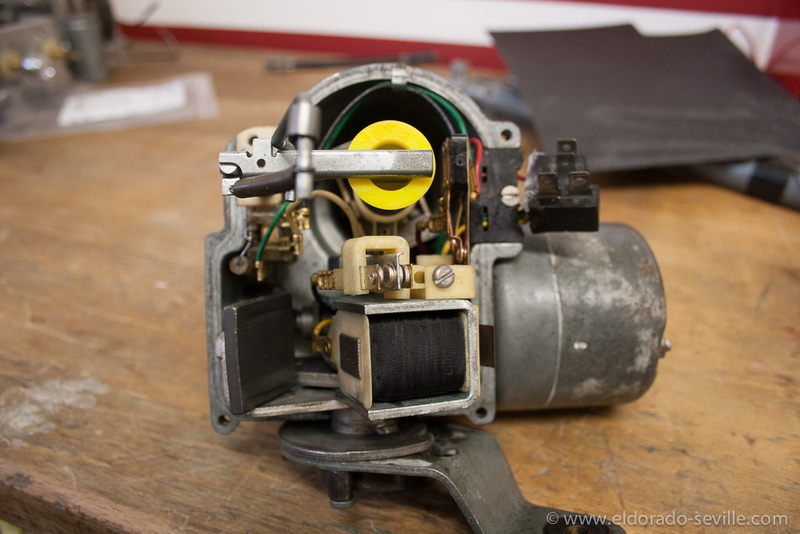 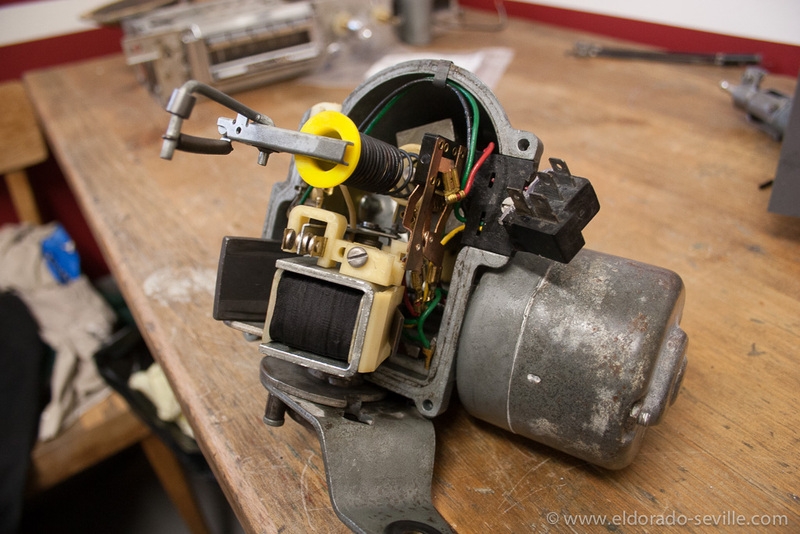 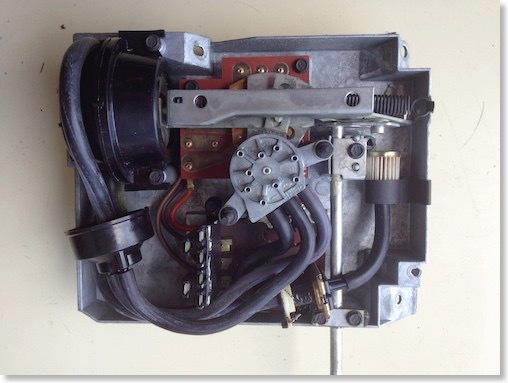 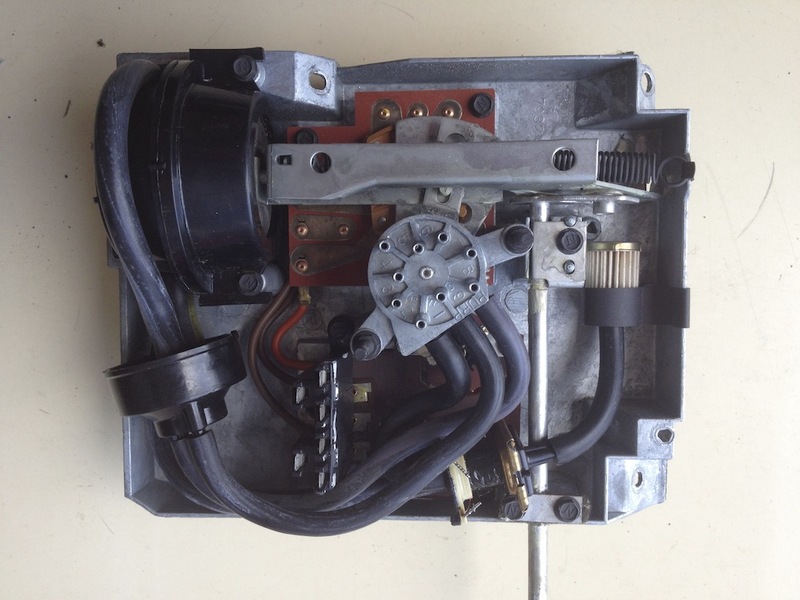 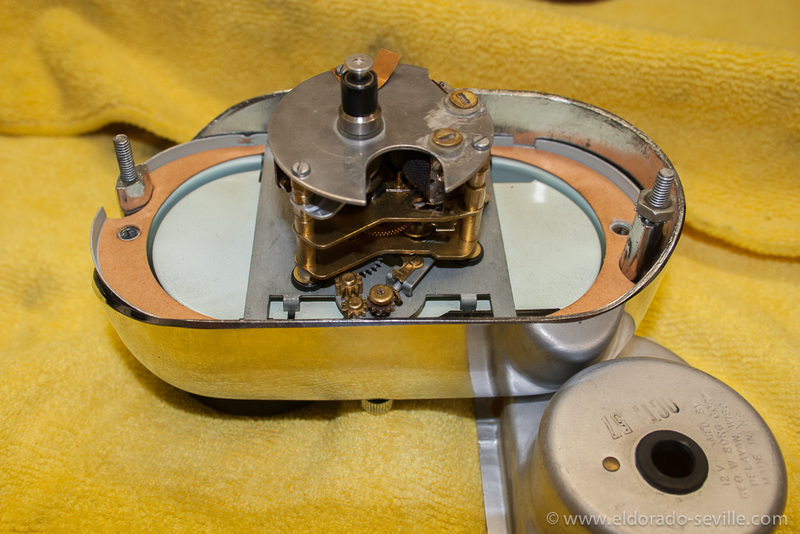 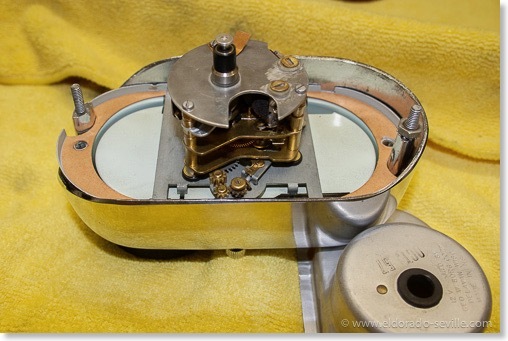 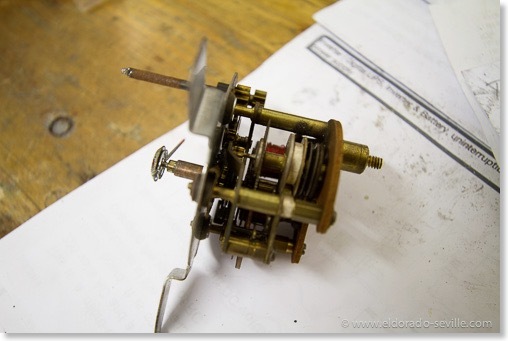 The solenoid disassembled - before cleaning - there are two coils inside. 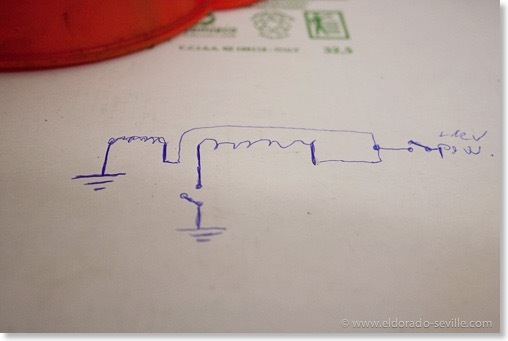 A quick drawing of how the system works. 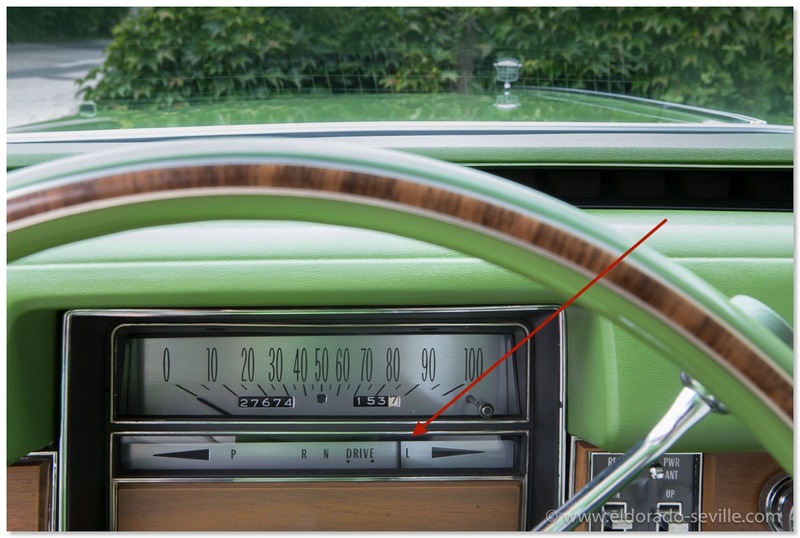 When I got the 74 - the transmission shift indicator was stuck in the "L" position and did not move at all. 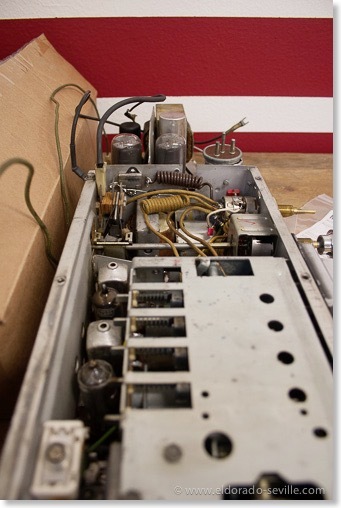 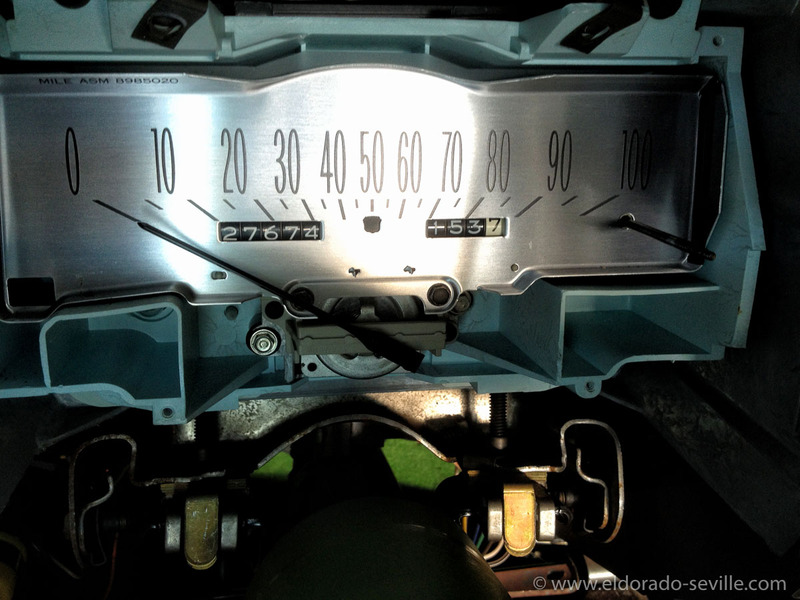 During a visit of my friends Lucky and Steve we took the speedometer apart to get access to the mechanism. 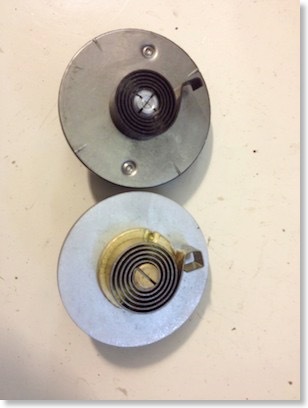 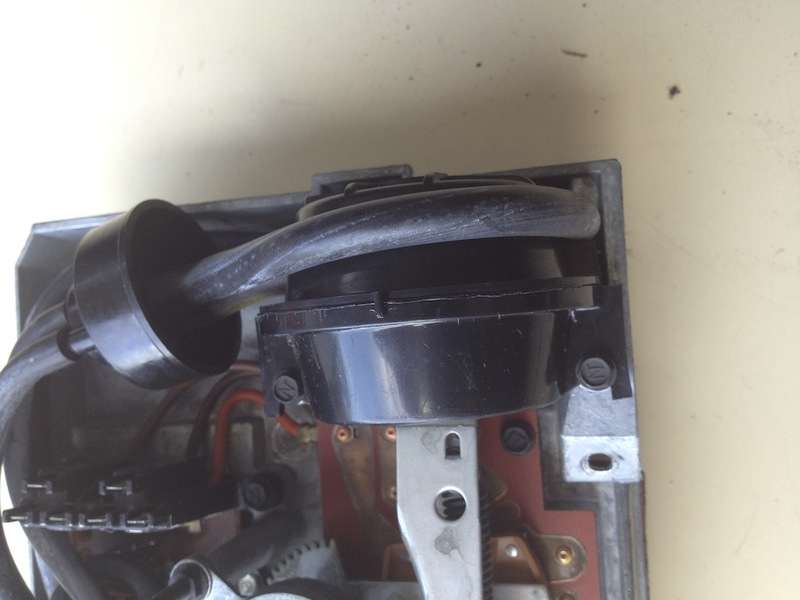 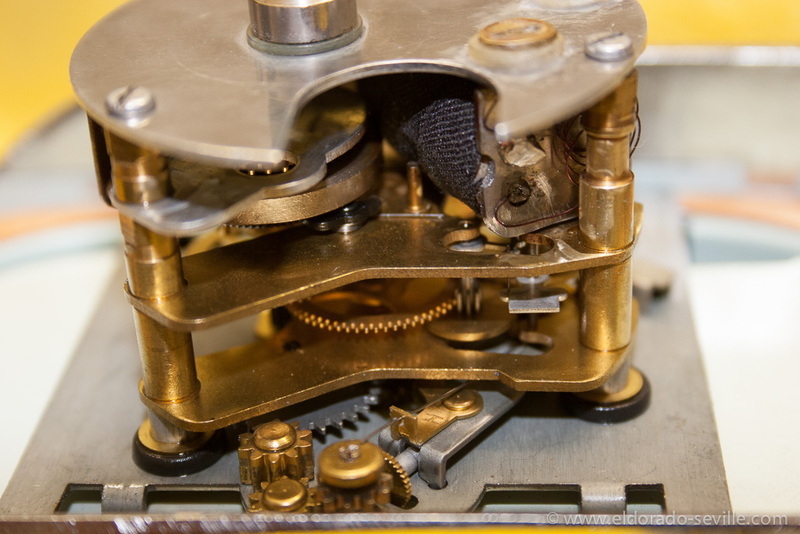 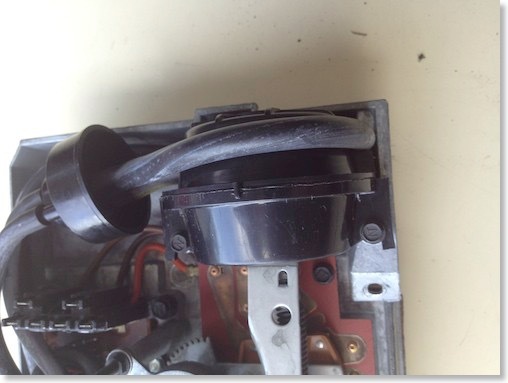 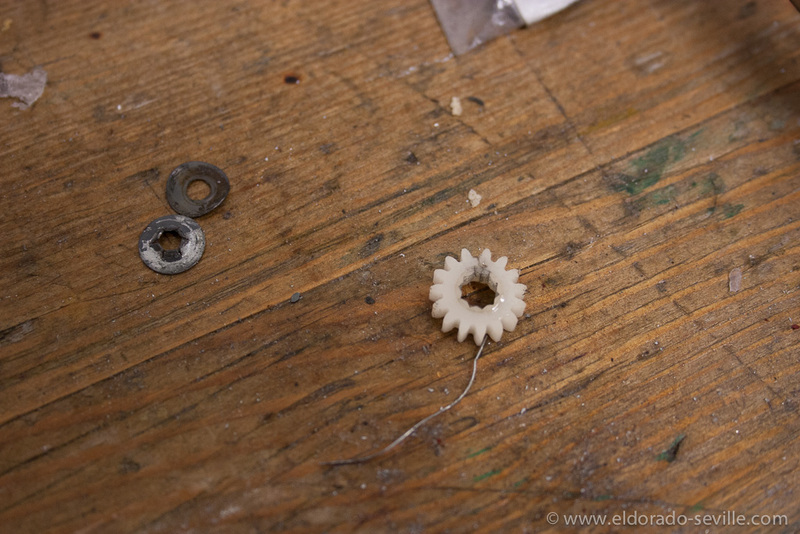 A small plastic part was broken and the spring which is attached to the dial indicator could no longer work. 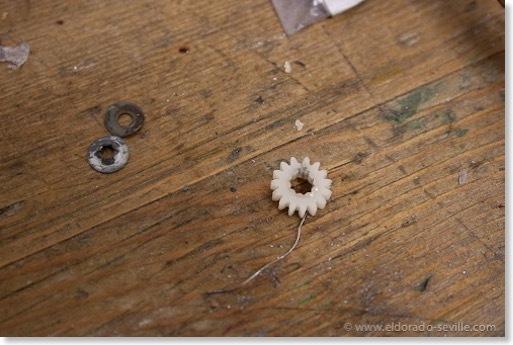 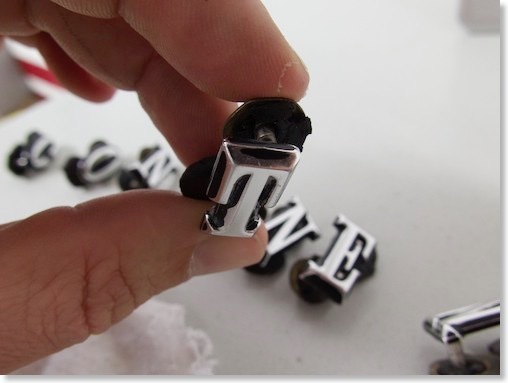 I could glue it back together with a special plastic glue and put the spring back in place. 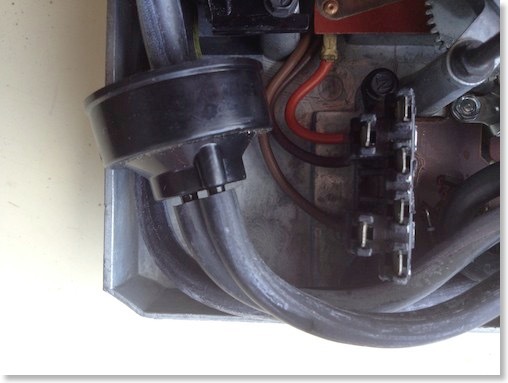 Its now working again as it should. 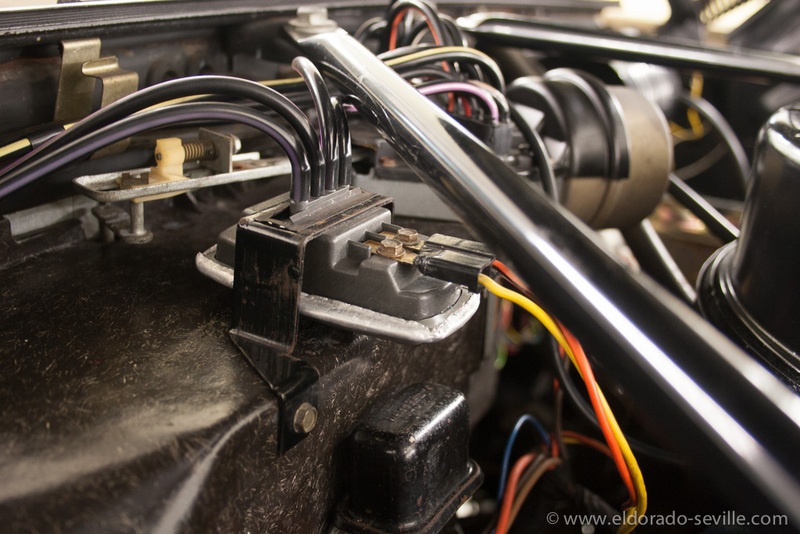 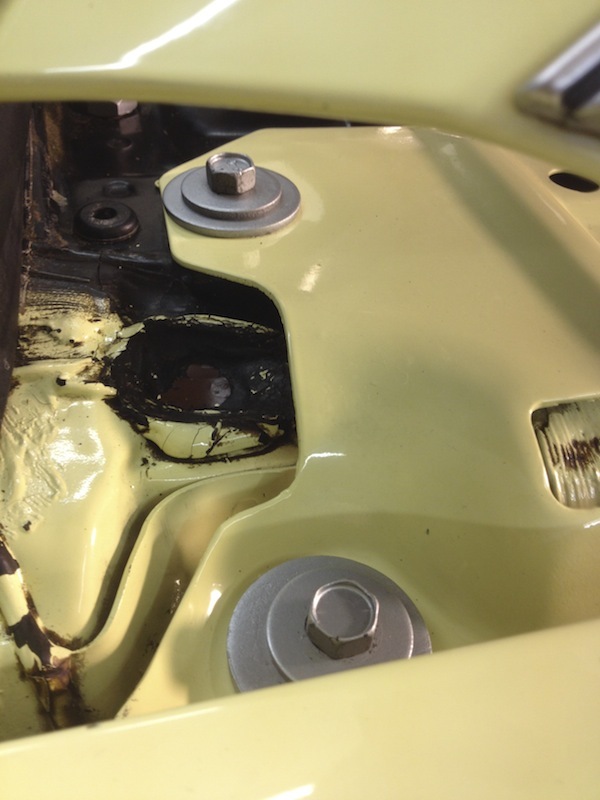 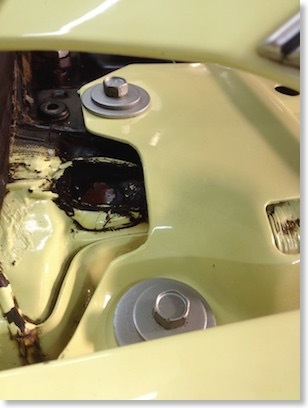 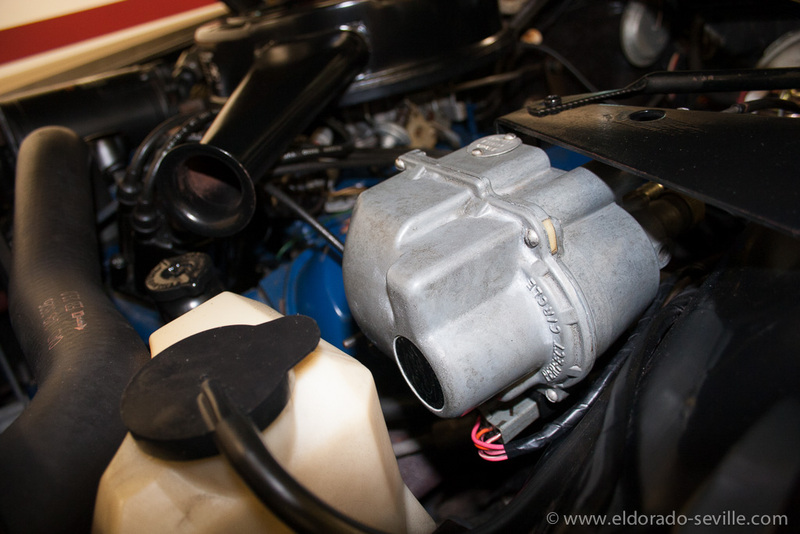 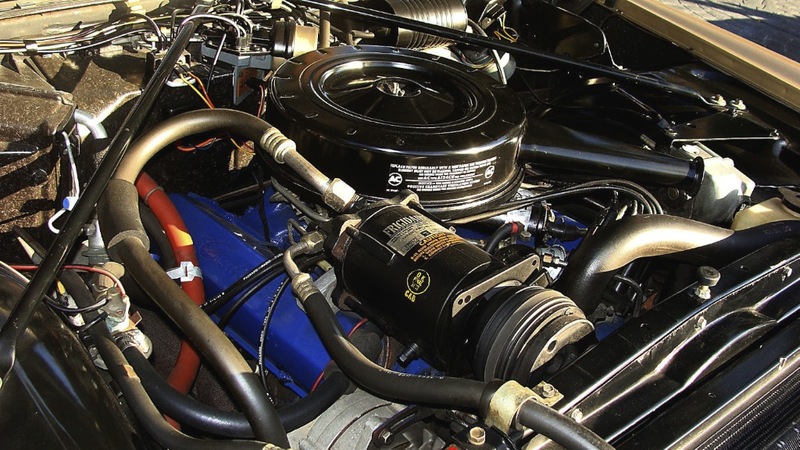 The 1966 is a fantastic car - but as most low mileage cars, it sometimes needs some work to fix some minor problems which were caused by not using the car for a longer period of time. 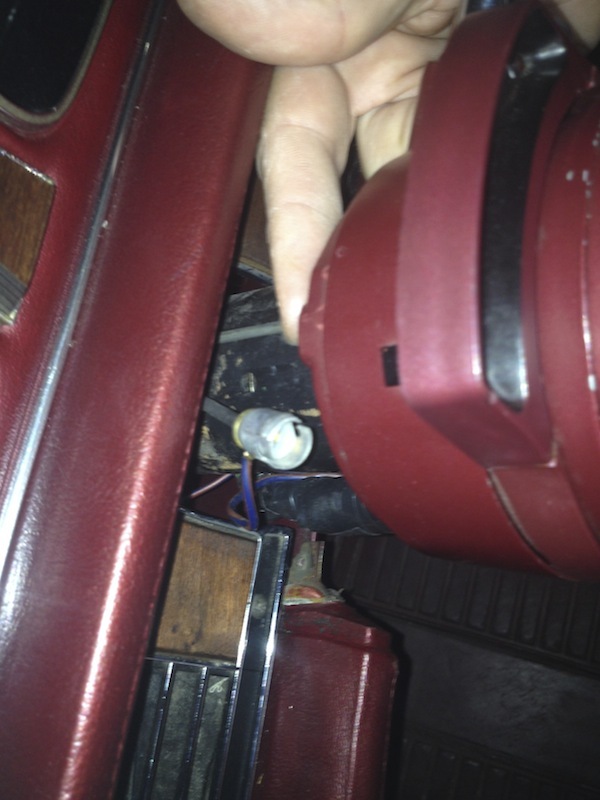 One of the few problems this cars had were some weird issues with the turn signal lights. 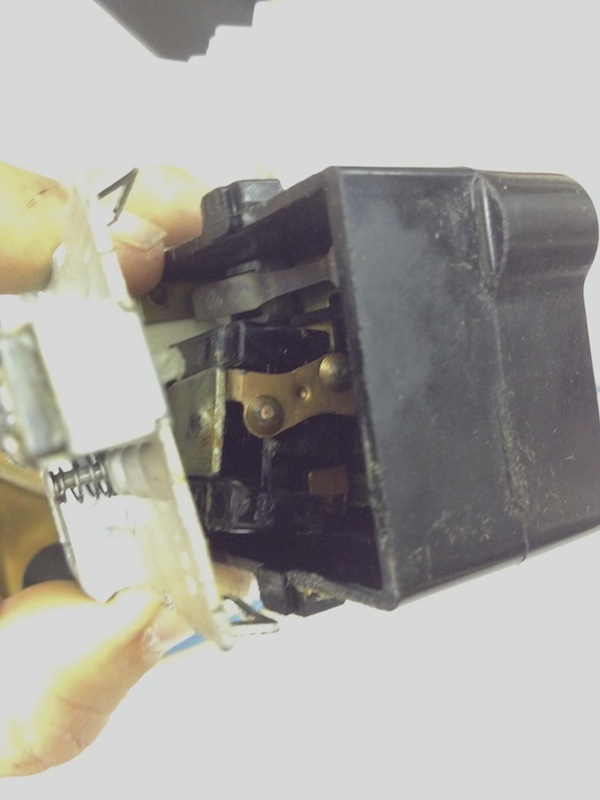 This light switch is made of "unobtainium", so I was pretty scared that it could be broken. 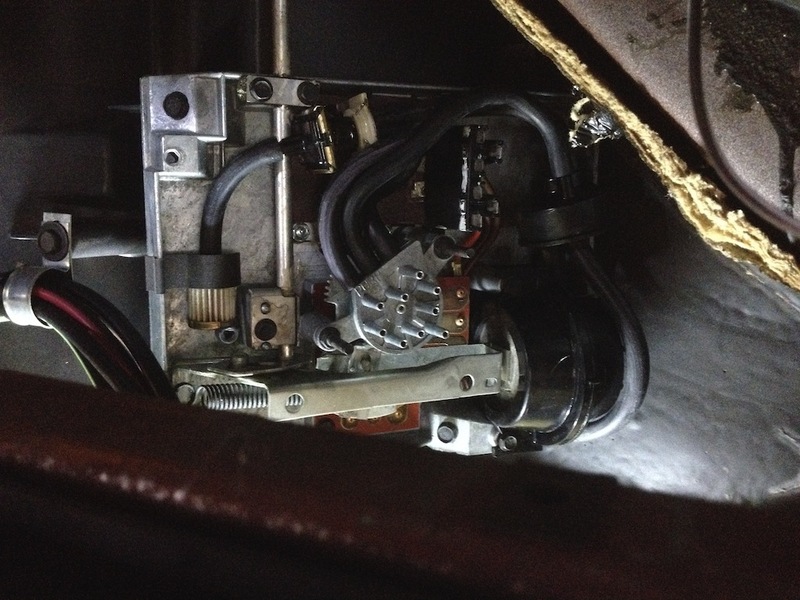 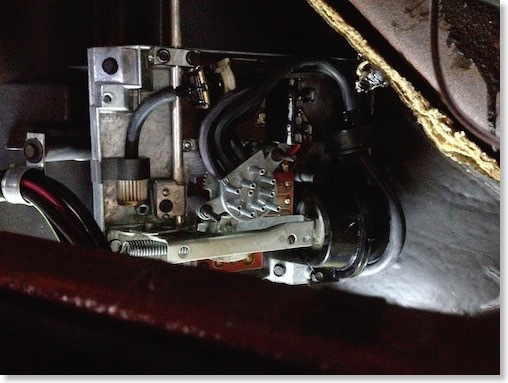 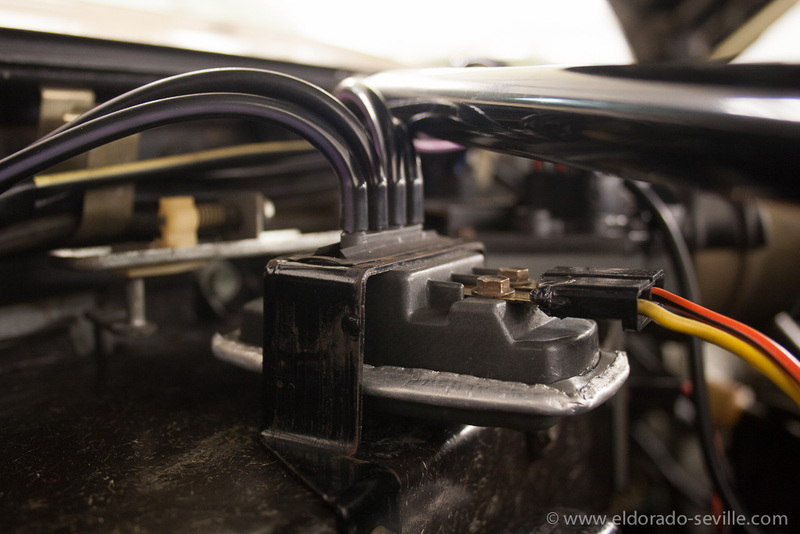 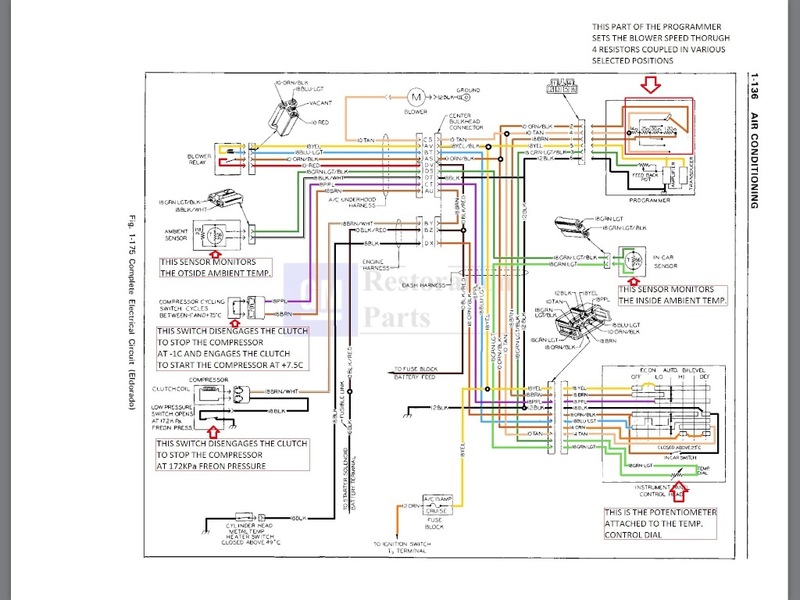 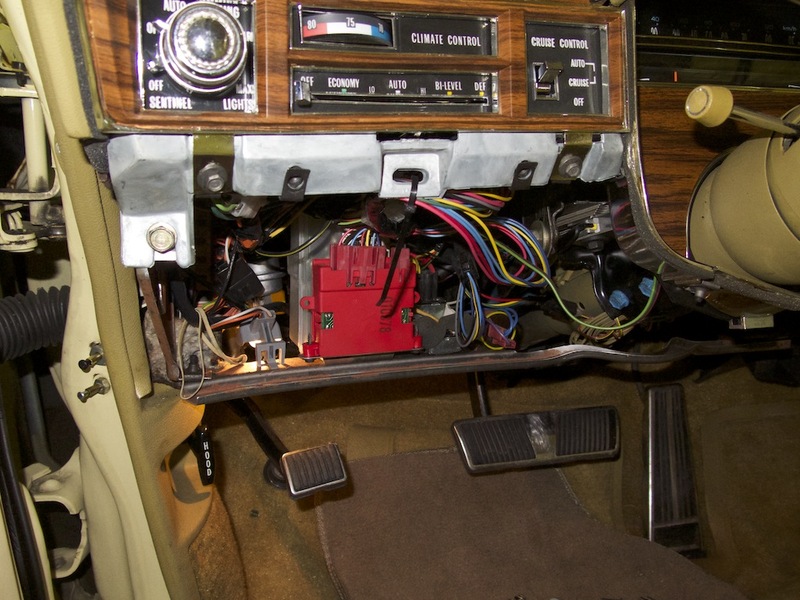 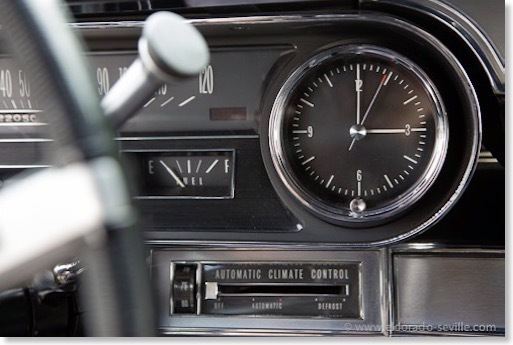 The switch is located underneath the dash and is screwed onto the steering column and is controlled and actuated by a steel cable that is coming from the turn signal lever. 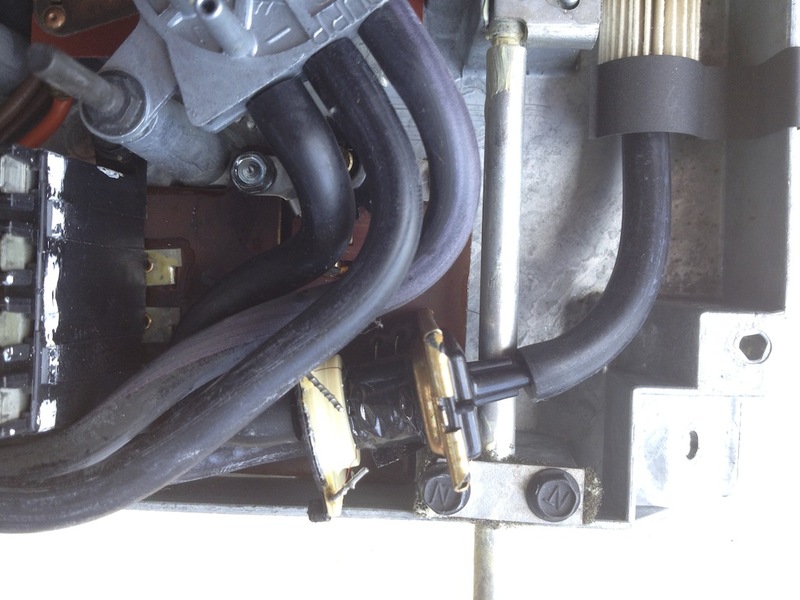 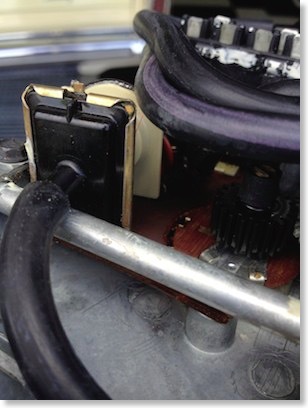 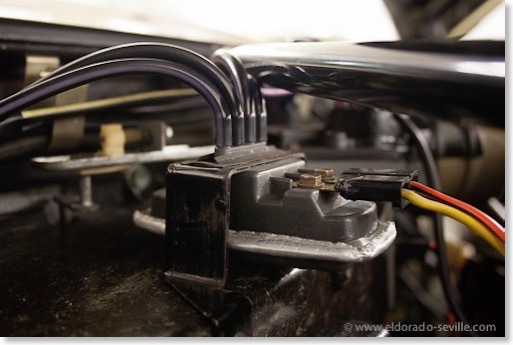 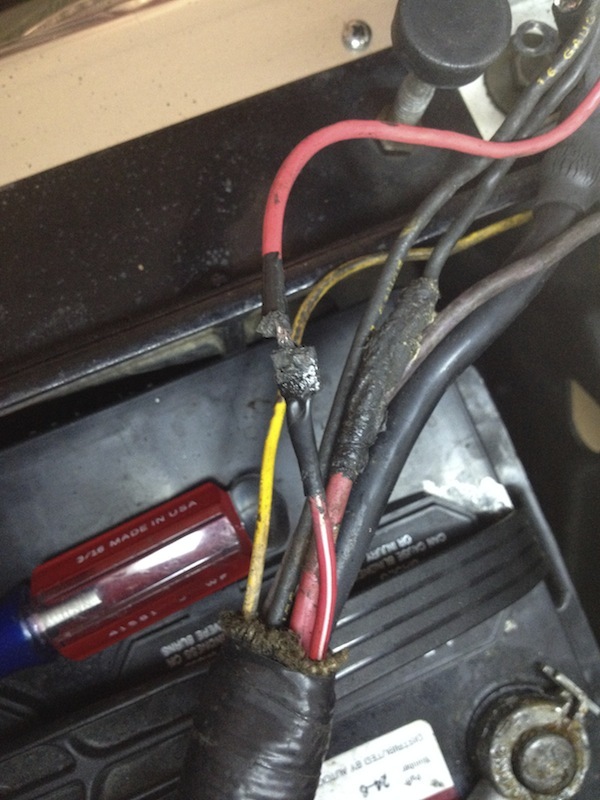 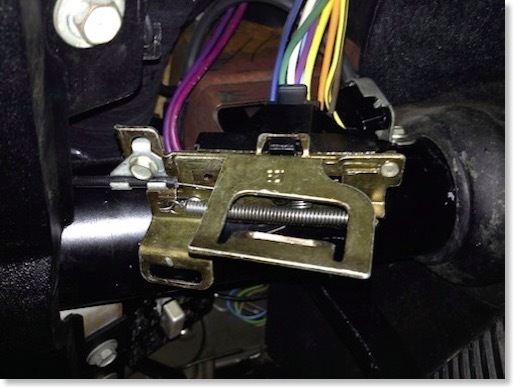 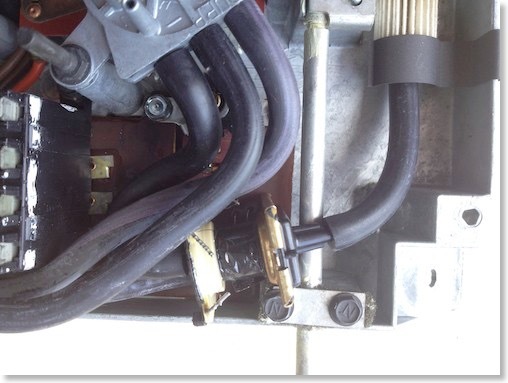 On this car the cable was out of alignment and did not engage the switch correctly on the right side position and this intermediate position of the switch caused the various problems. 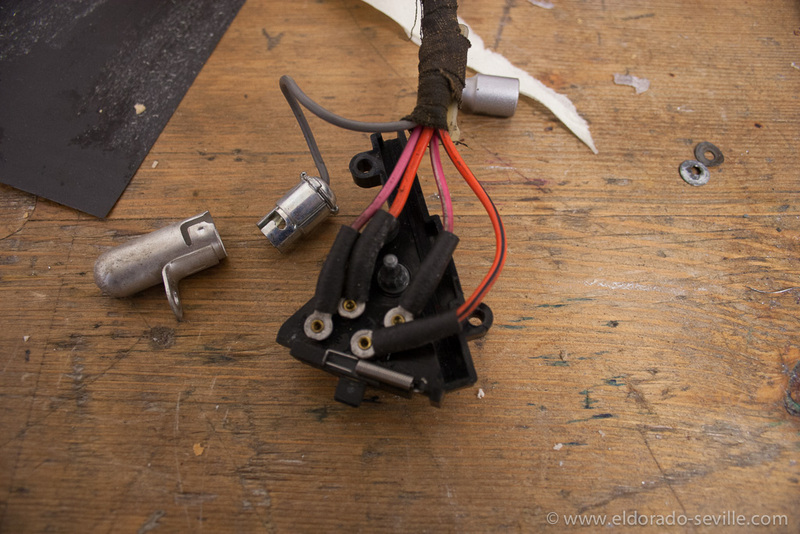 It took me quite a while to get the adjustment of the cable right again, as you carefully have to shorten or lengthen it with a nose-plier to get the right length. 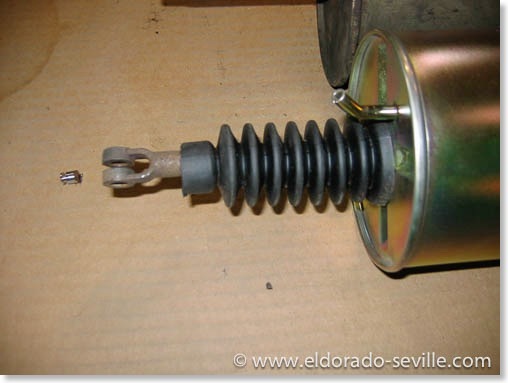 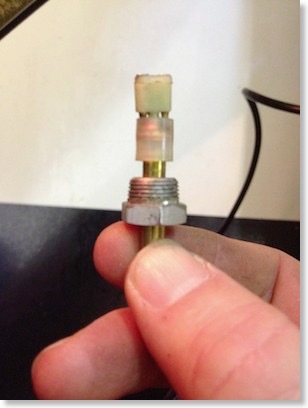 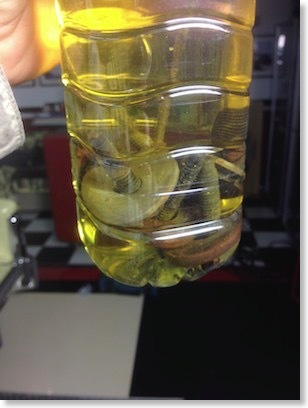 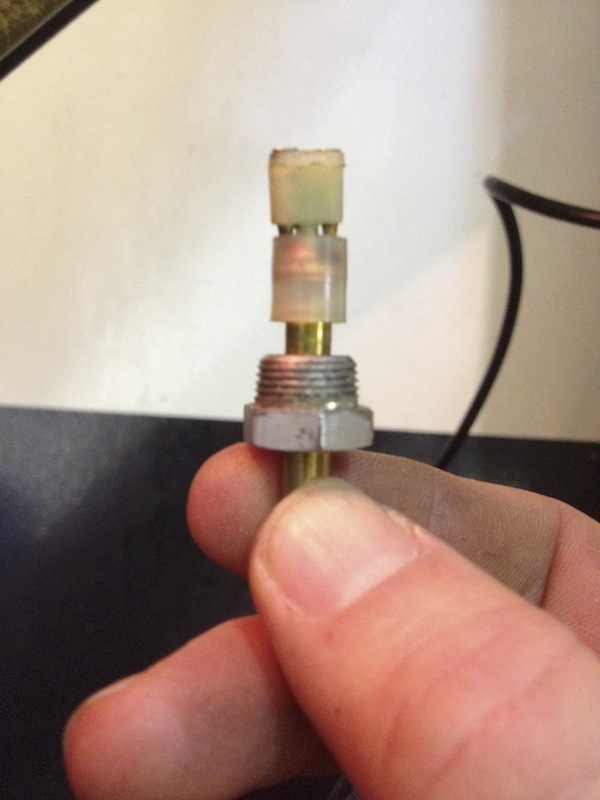 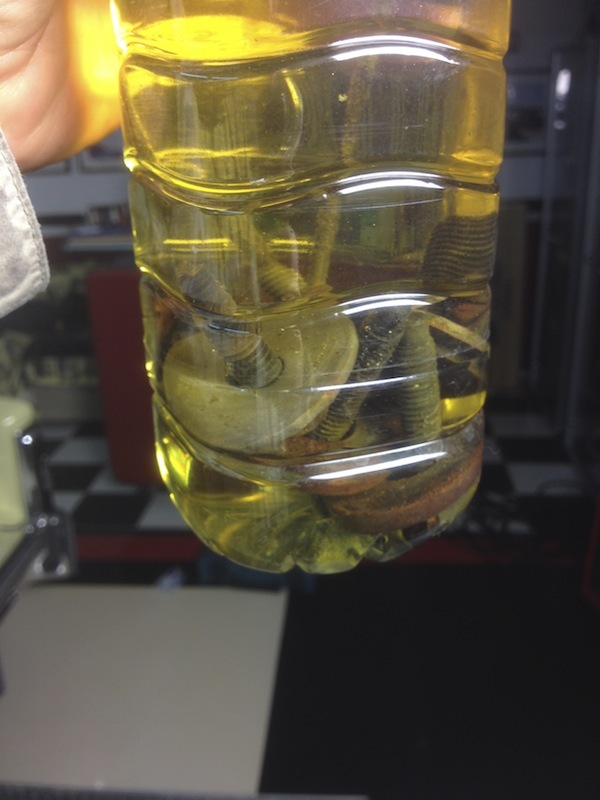 I also adjusted the spring you can see on the picture below. 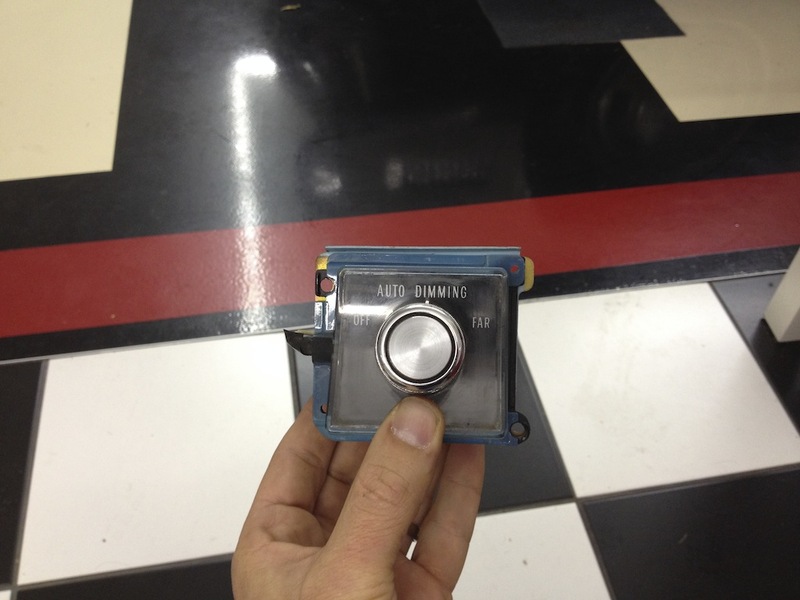 This makes the switch more snappy. 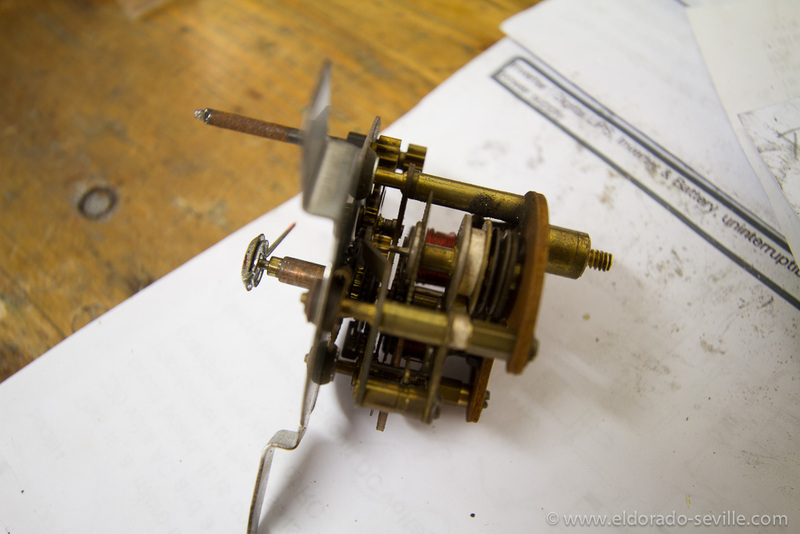 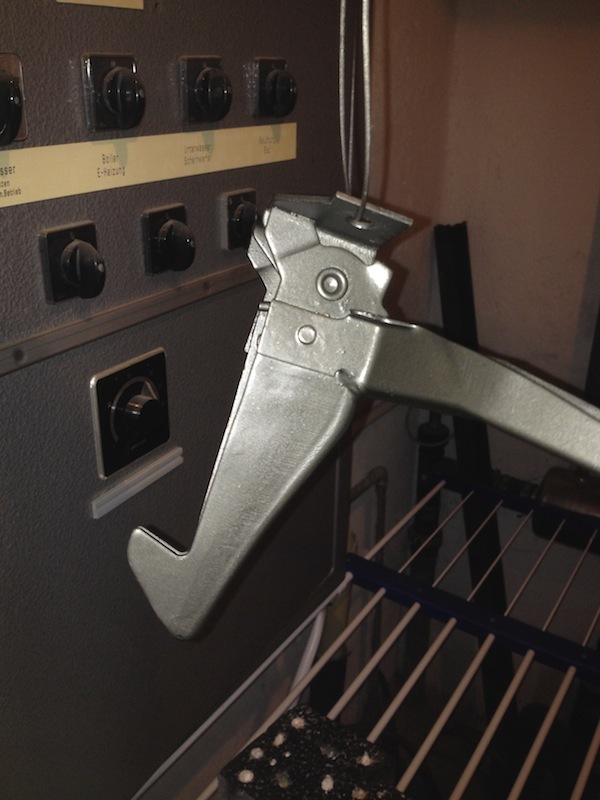 It now works perfectly and the lever moves much nicer! 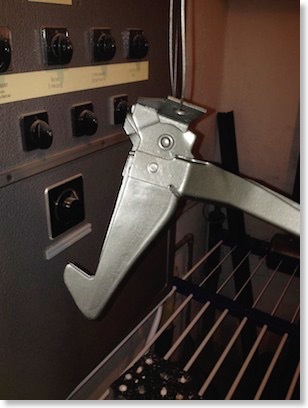 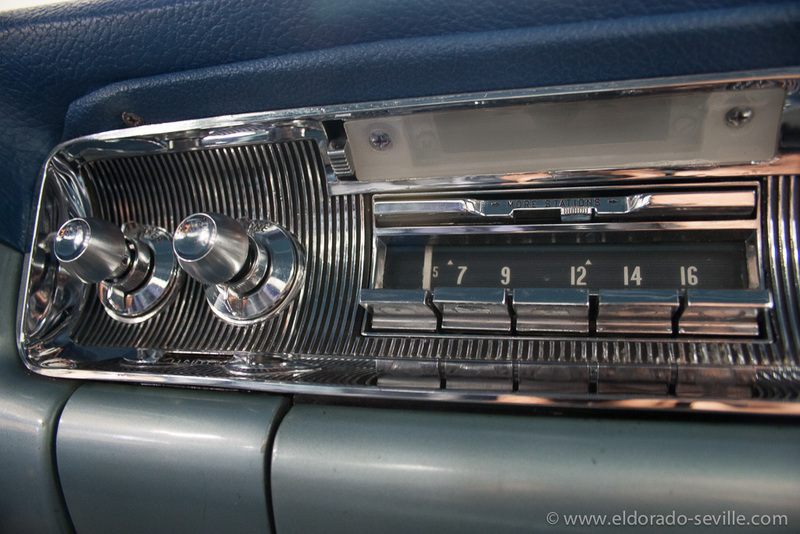 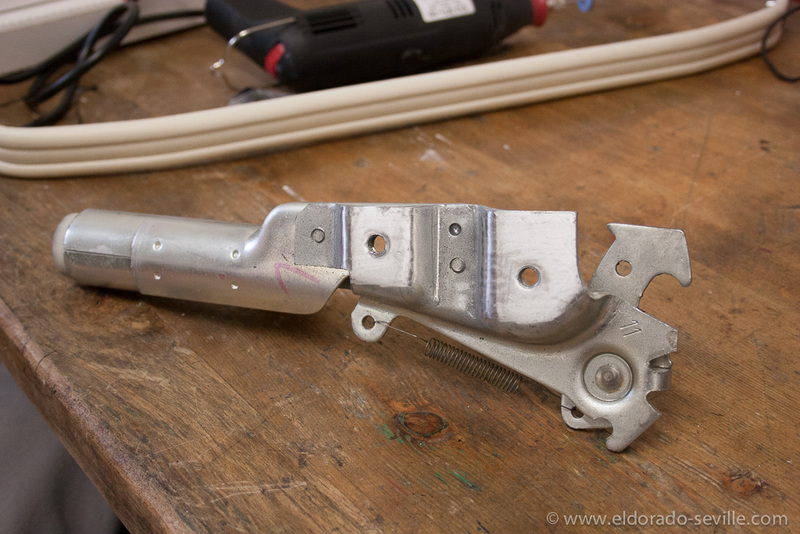 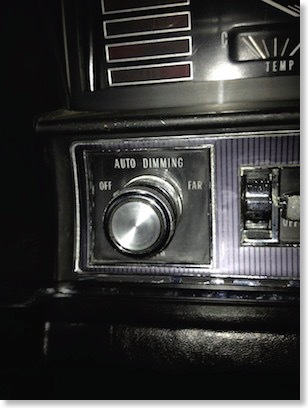 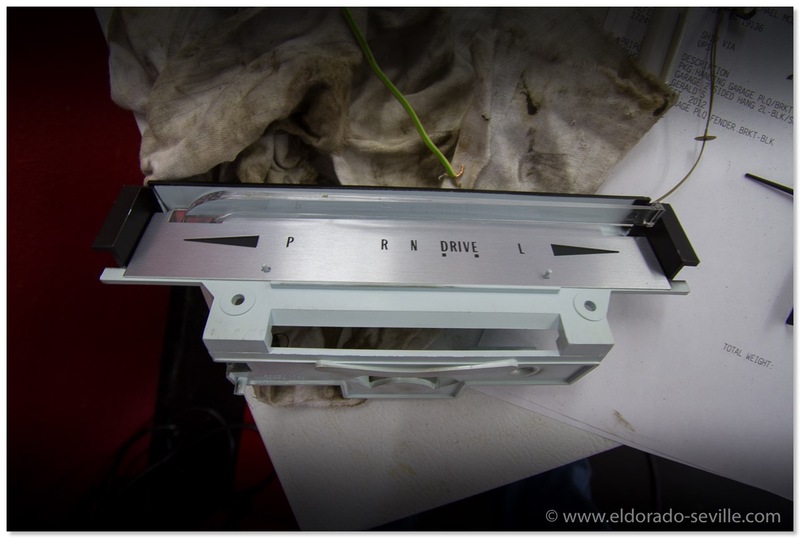 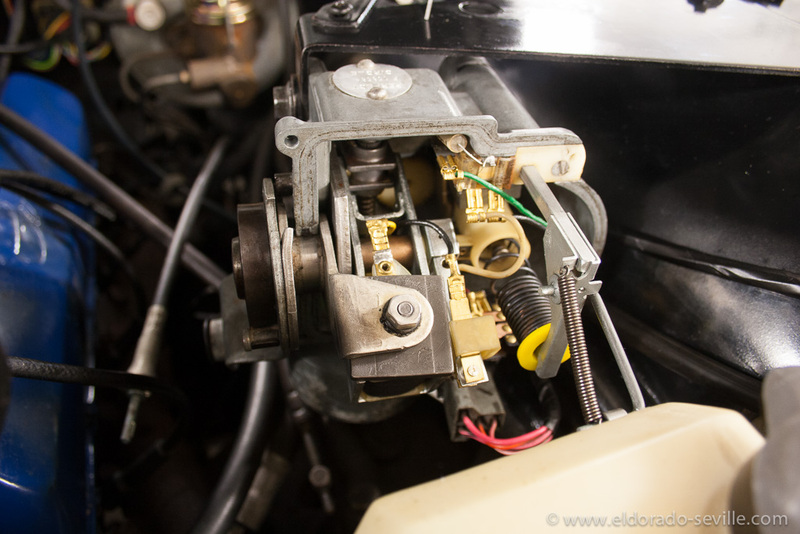 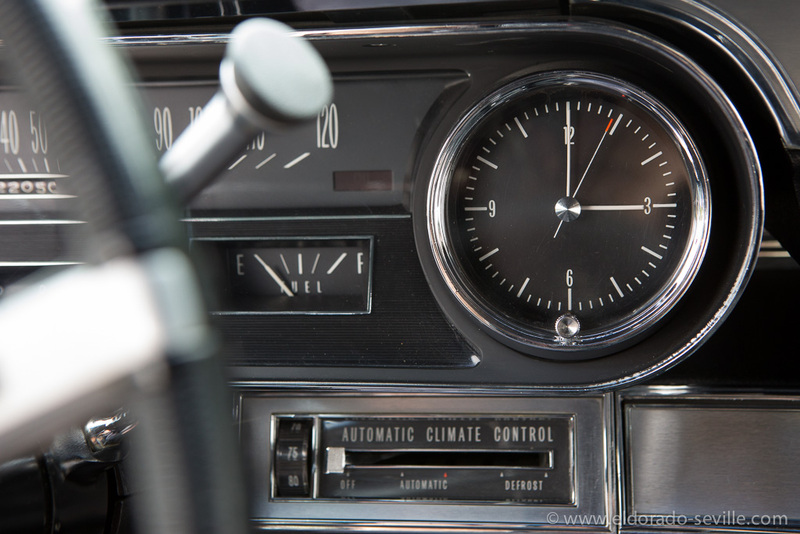 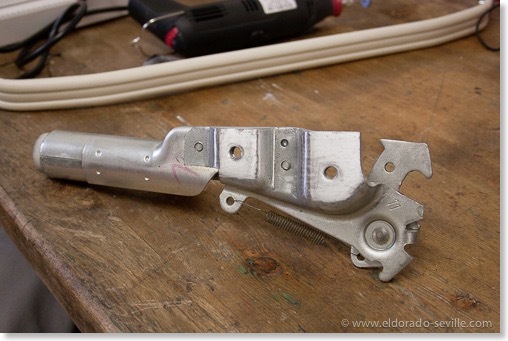 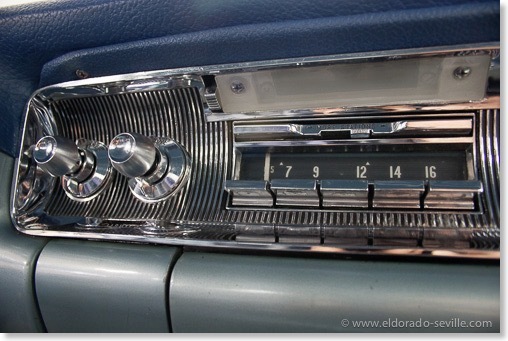 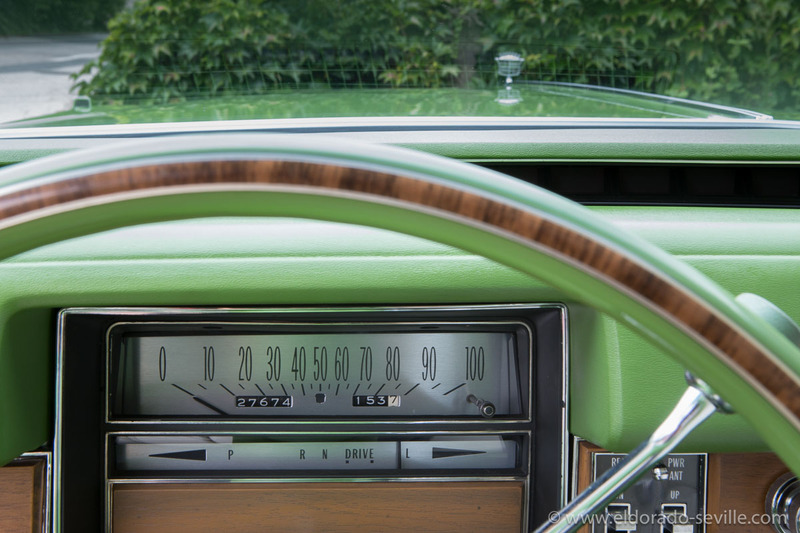 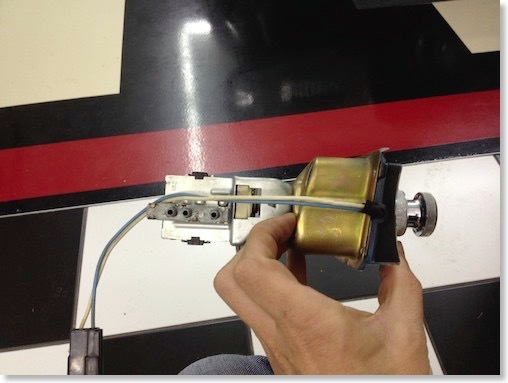 the 1966 Cadillac turn signal switch as seen from underneath the dash - already removed from the steering column. 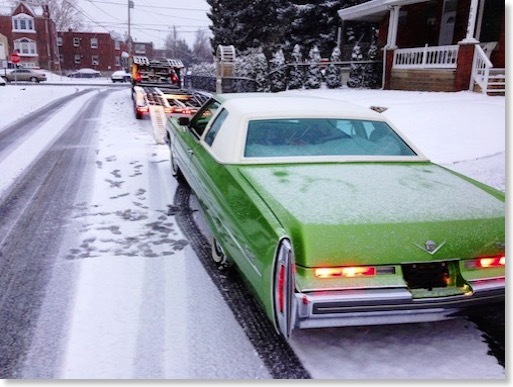 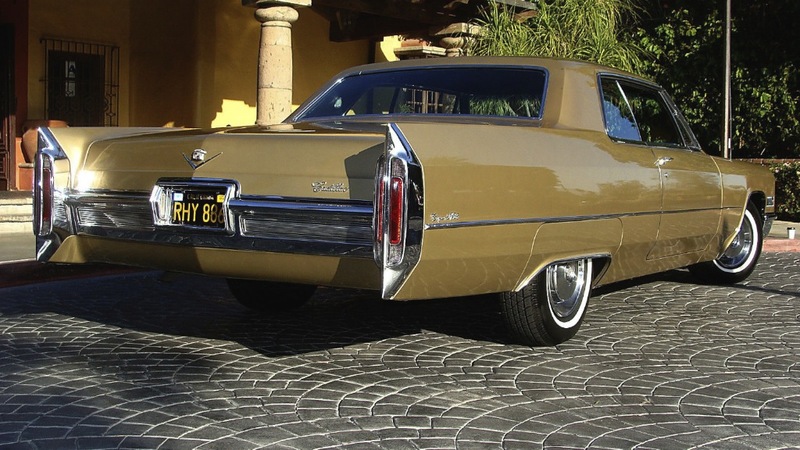 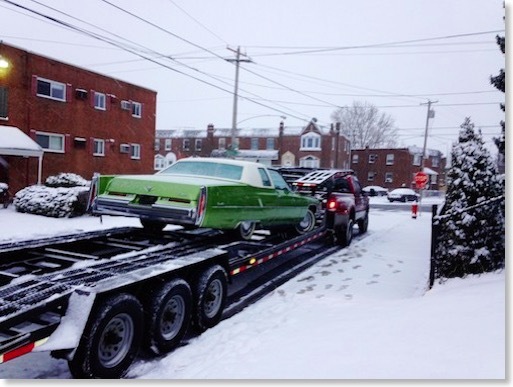 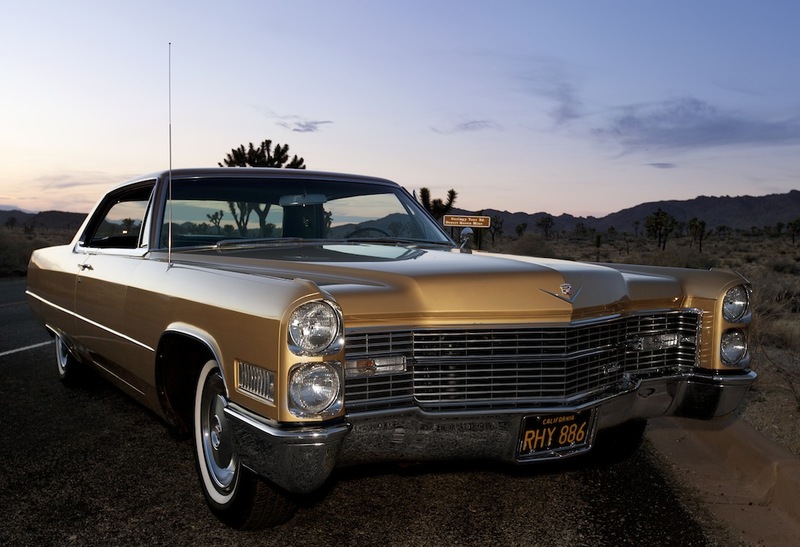 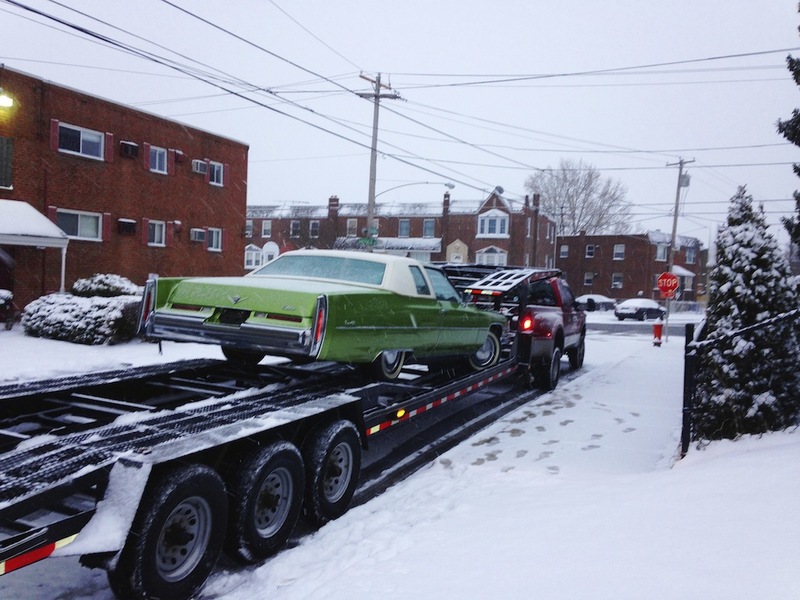 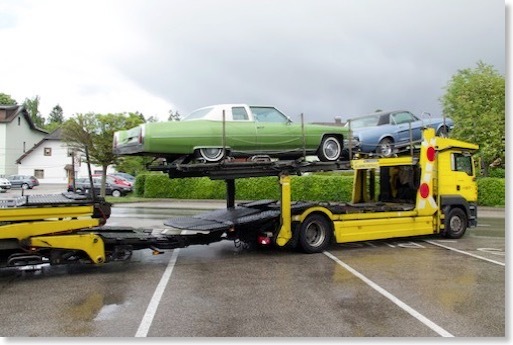 Today was the day the 1966 Cadillac Coupe deVille finally arrived! 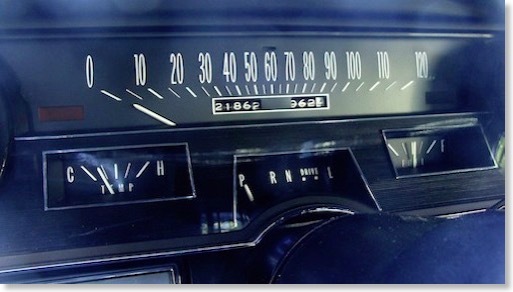 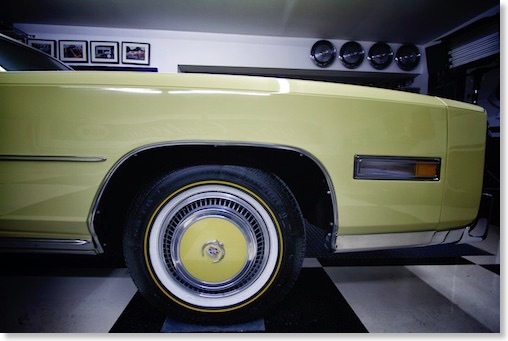 It's a completely original super low mileage car in pristine condition. 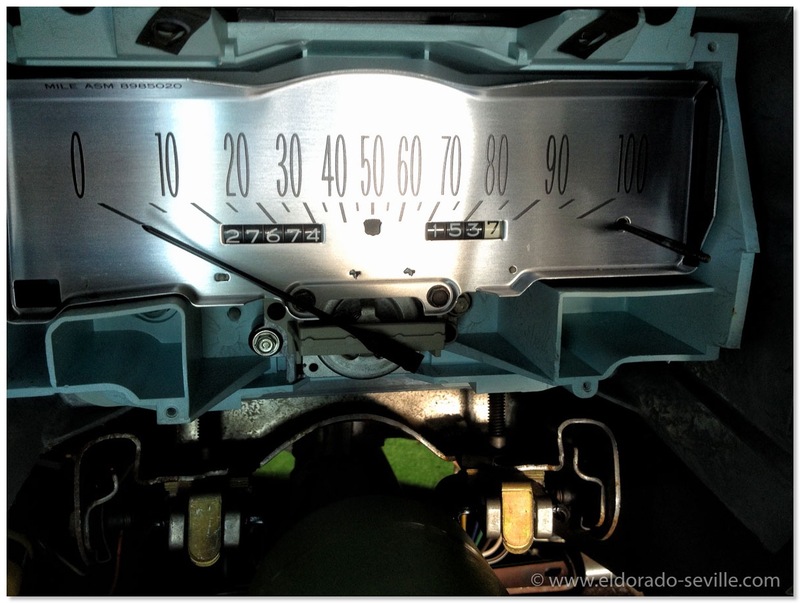 With only 22k miles on the clock and all the mechanical parts in exceptionally good condition, the car absolutely drives like a new car. 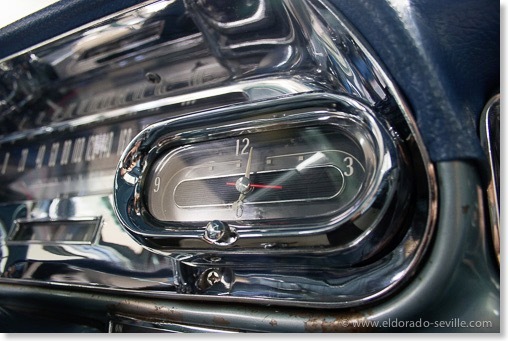 Wow - talk about a time-capsule! 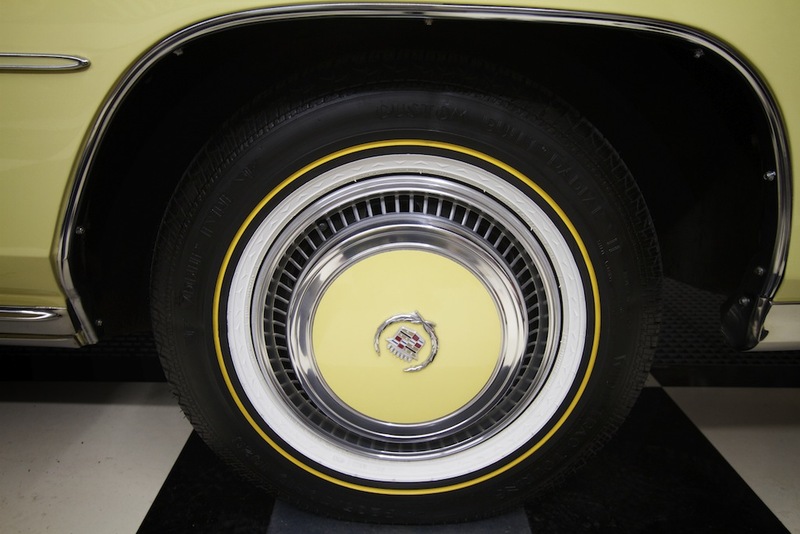 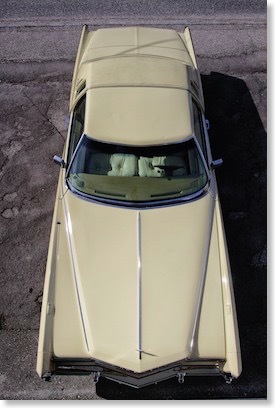 You will very rarely see a car from the 60s in such original low mileage condition. 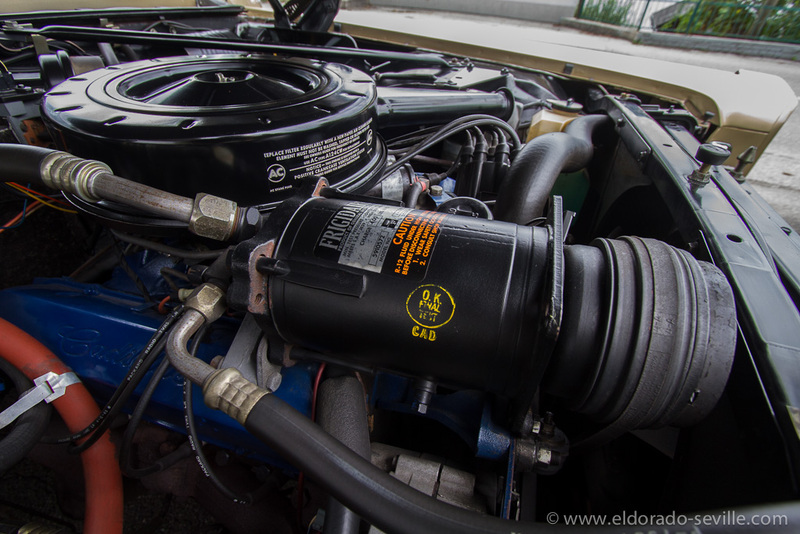 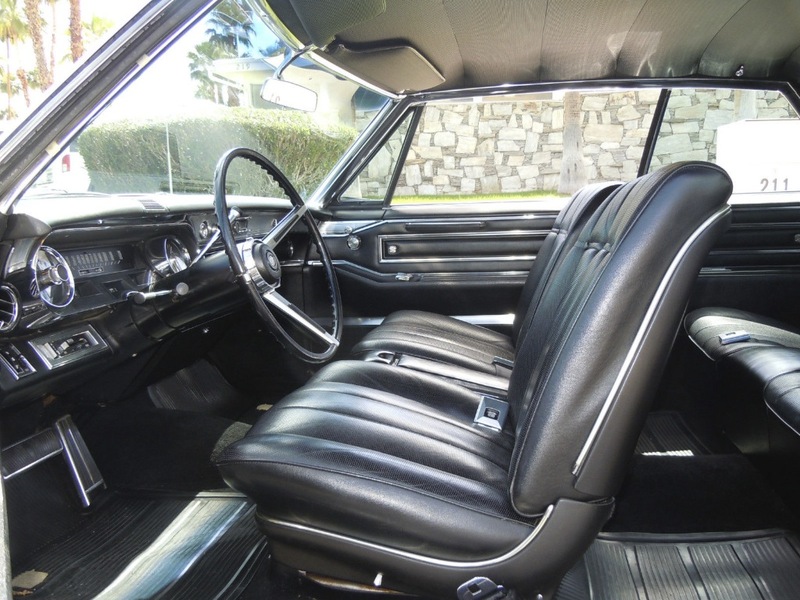 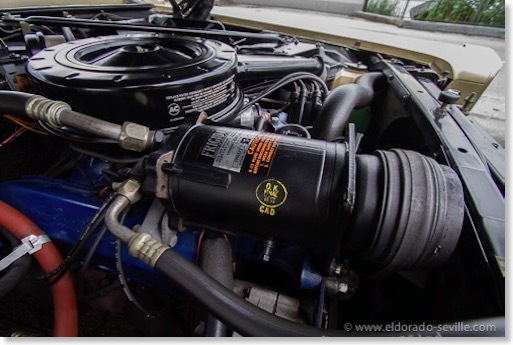 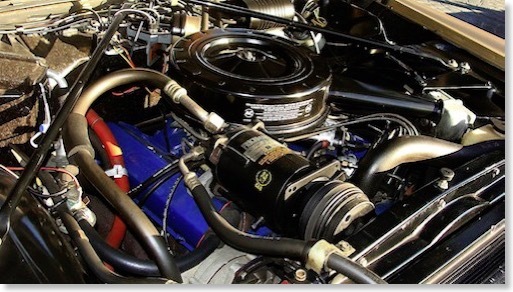 What makes this car so special is of course its originality and awesome condition with the low mileage, but it also is a very loaded car with most of the options that were available back in 1966. 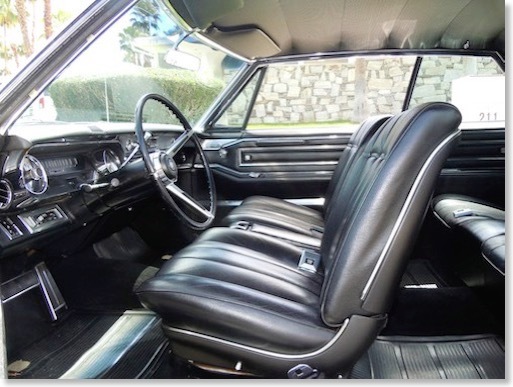 One of the coolest option are the power - bucket seats in full black leather with center console. 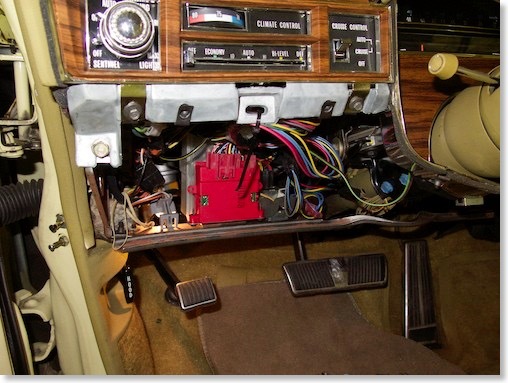 Also AC, Twilight Sentinel, Automatic dimming, AM-FM radio, Cruise Control, Tilt and Telescope steering - everything is there! 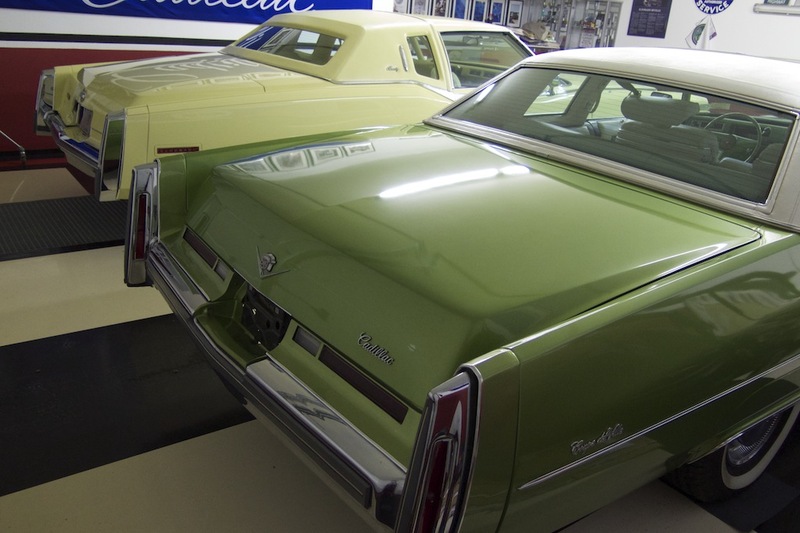 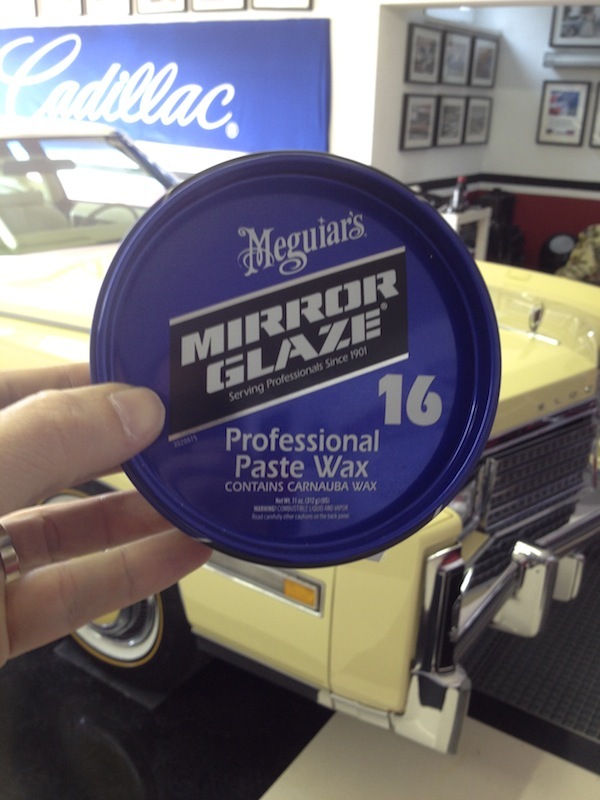 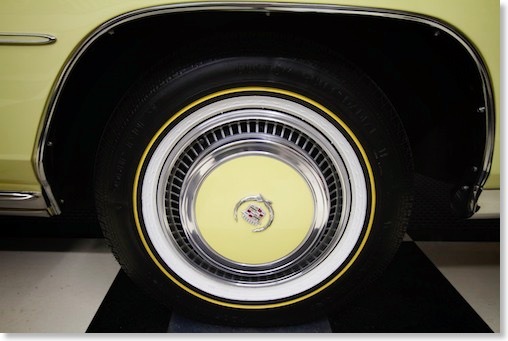 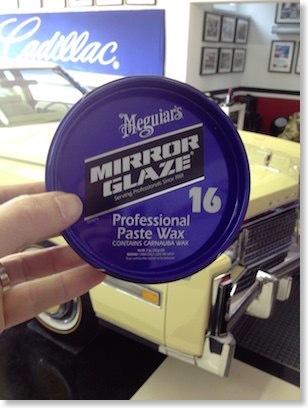 What also makes this car so rare is that it is a slick top - most Coupes were ordered with vinyl tops in 1966. 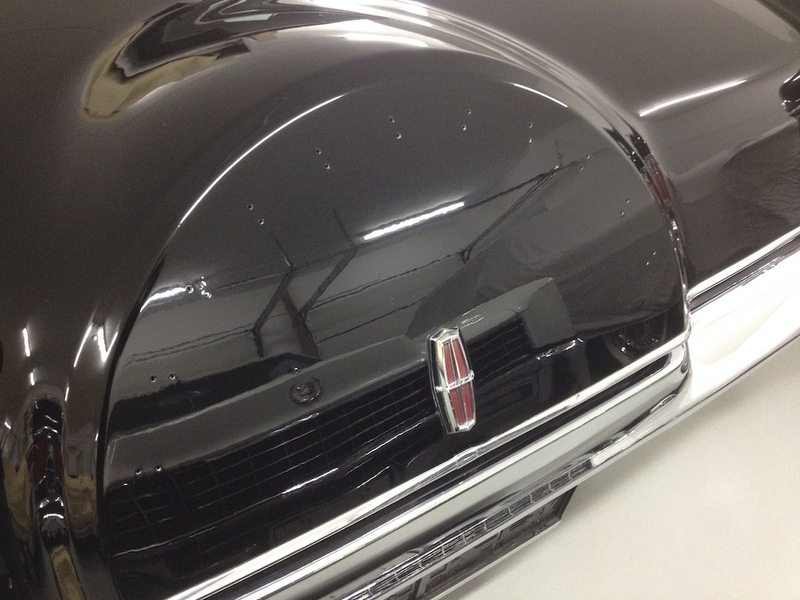 In my personal opinion it looks so much better and more elegant without the vinyl roof! 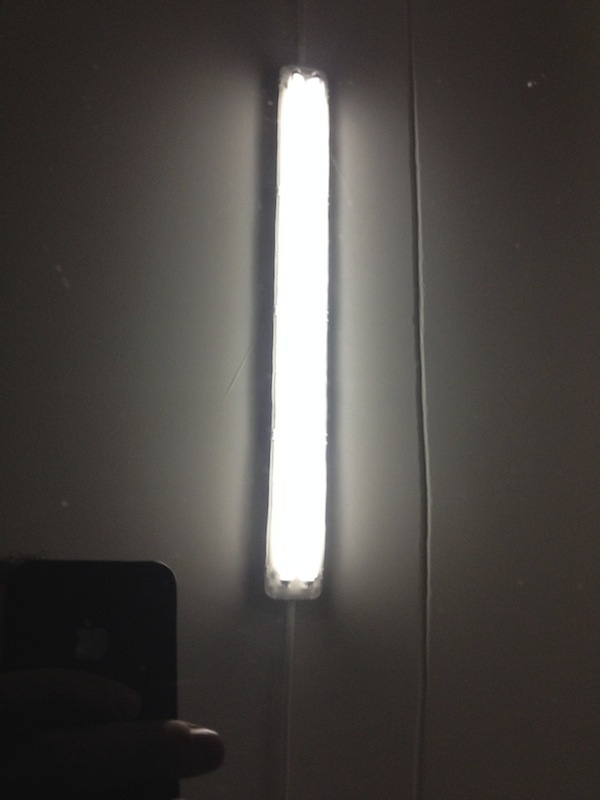 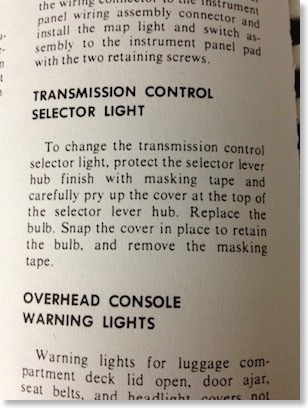 I thought that changing a simple light bulb would not be a big problem but a pretty self explaining thing. 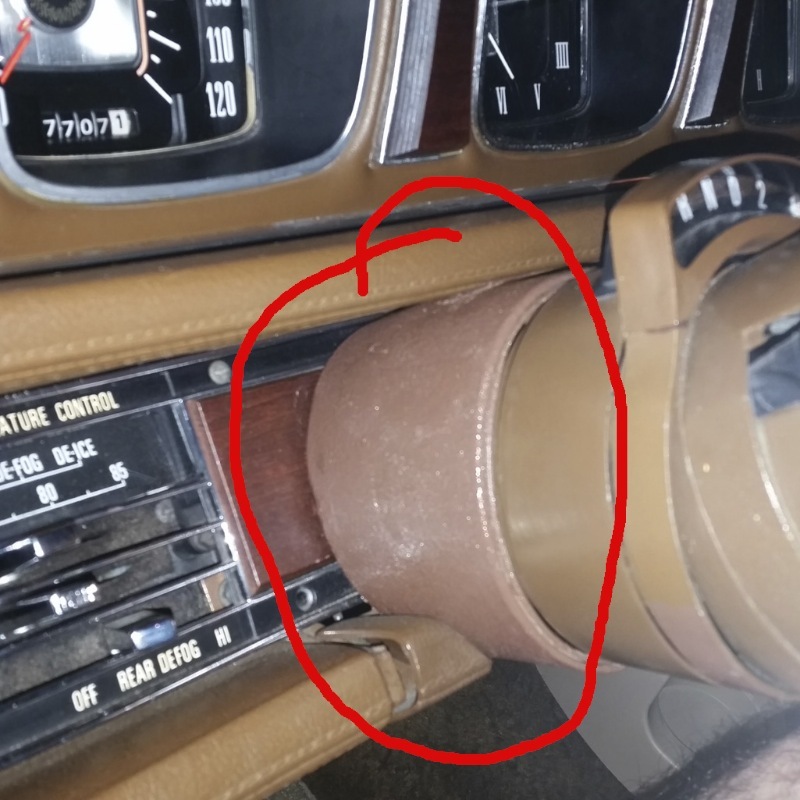 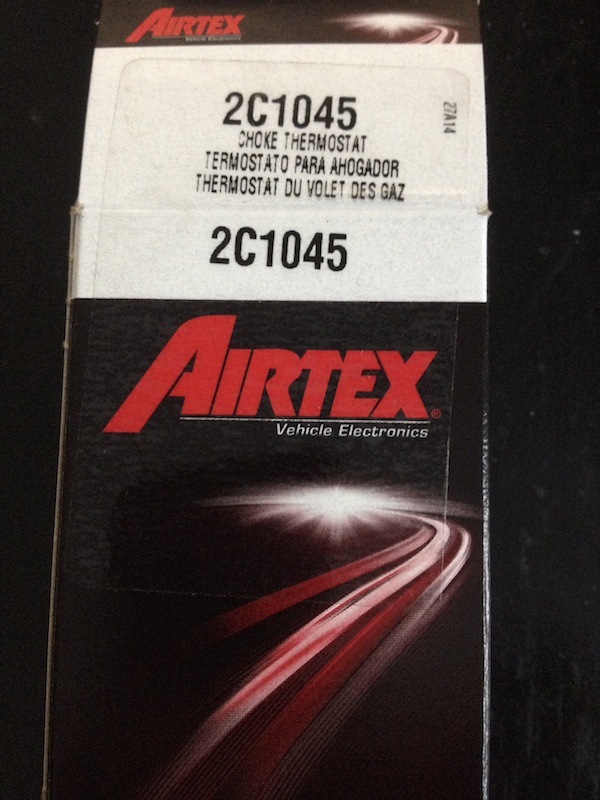 The transmission indicator bulb in my Mark III did no longer work. 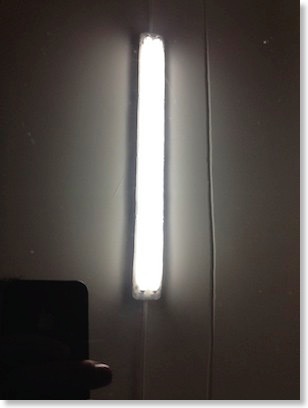 So I thought I could change it quickly and order a bulb. 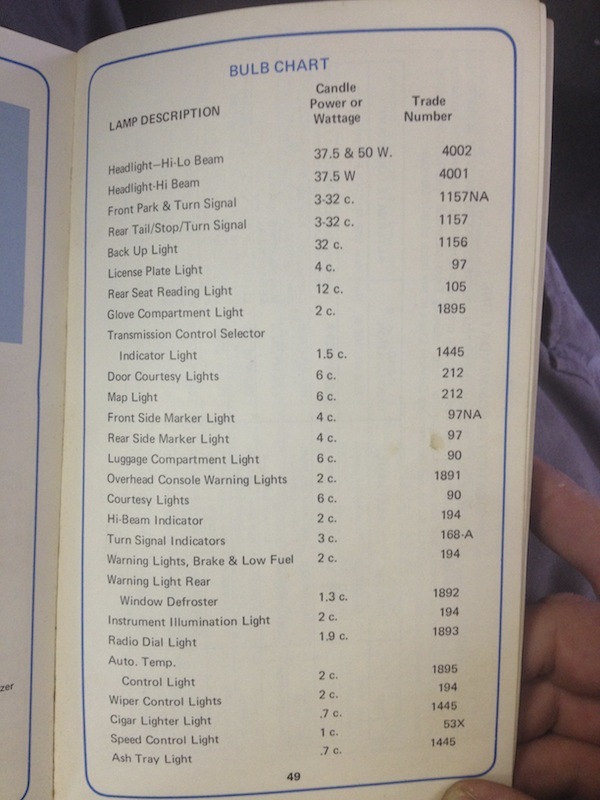 (the one I got from rockauto.com does not fit btw..) Its bulb #1445 you need - thats the correct one as you can see in the owner manual. 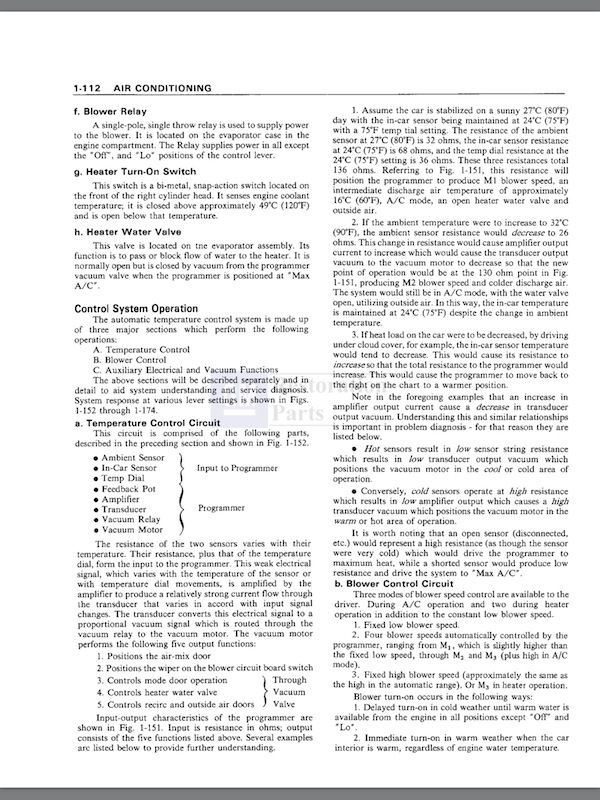 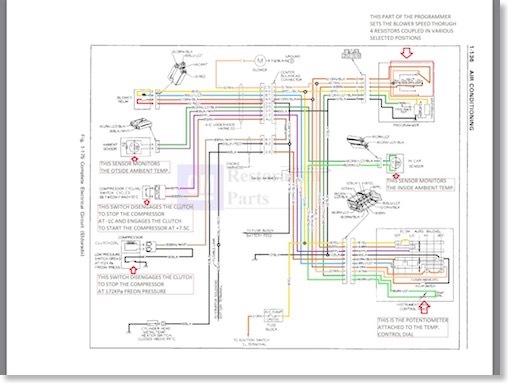 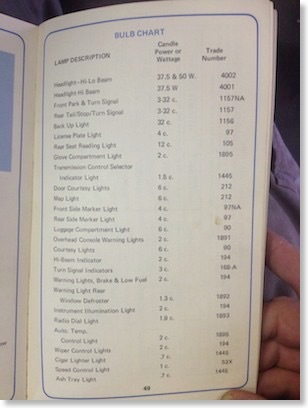 The owners manual lists all the bulbs you need. 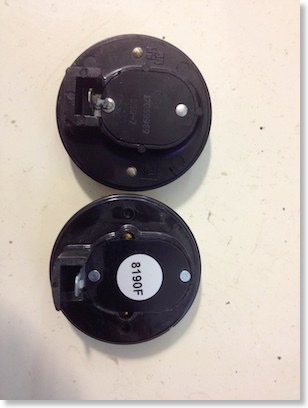 One should order them by part number. 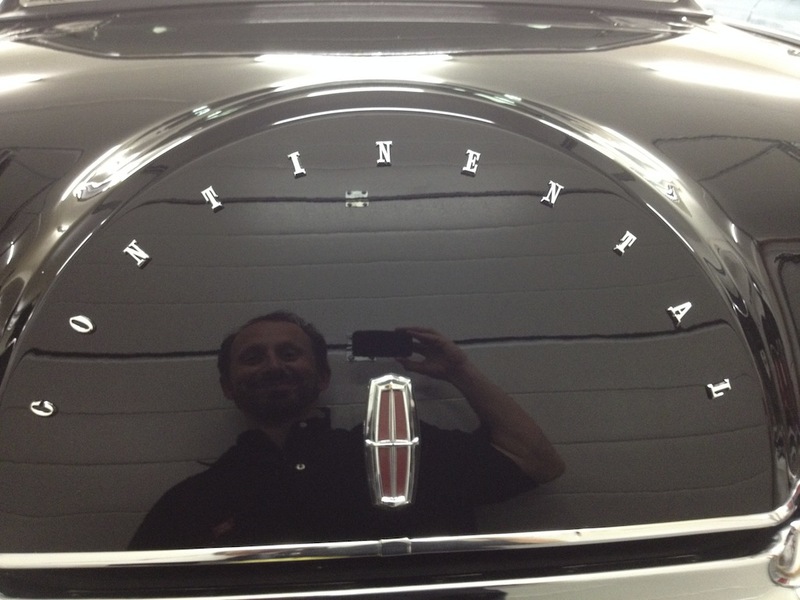 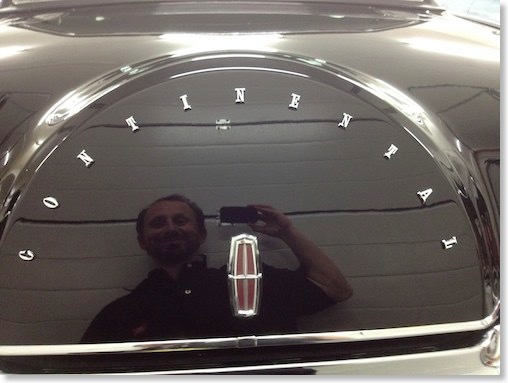 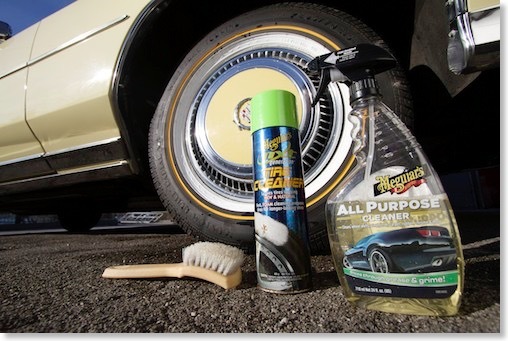 I had no idea where to start so I contacted the excellent Lincolnforum where I got some very helpful tips. 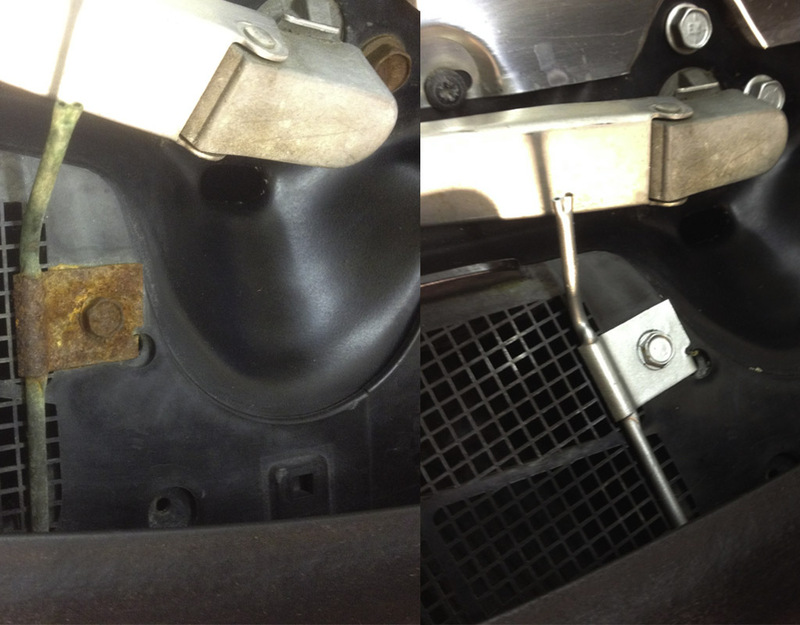 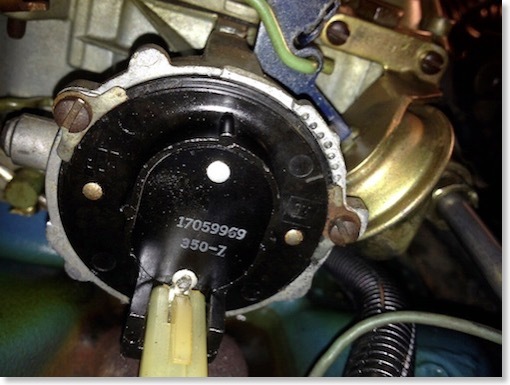 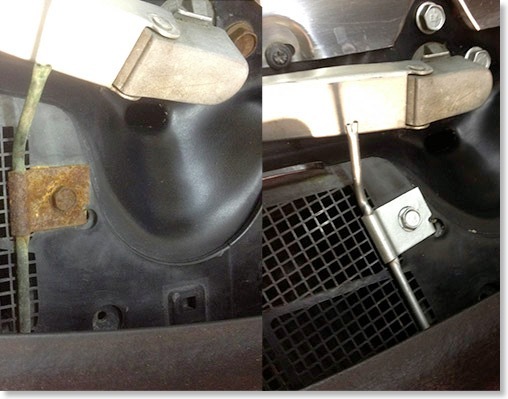 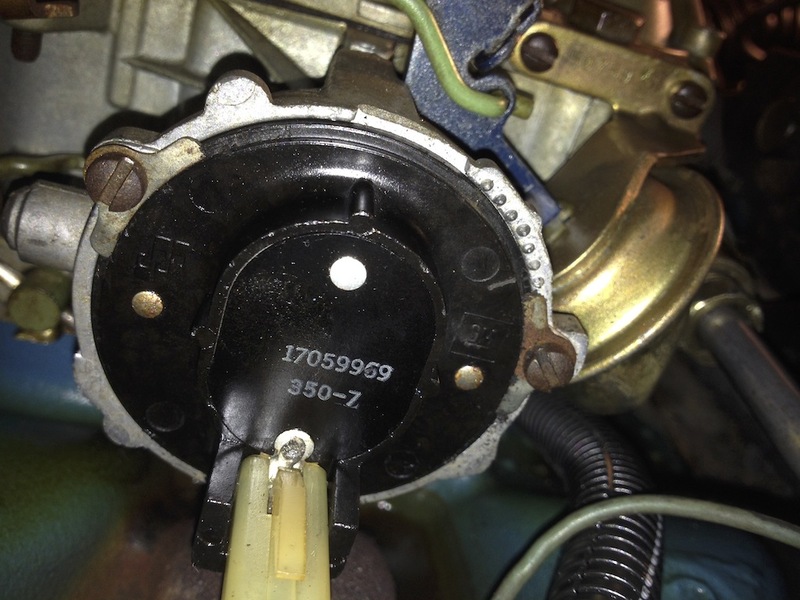 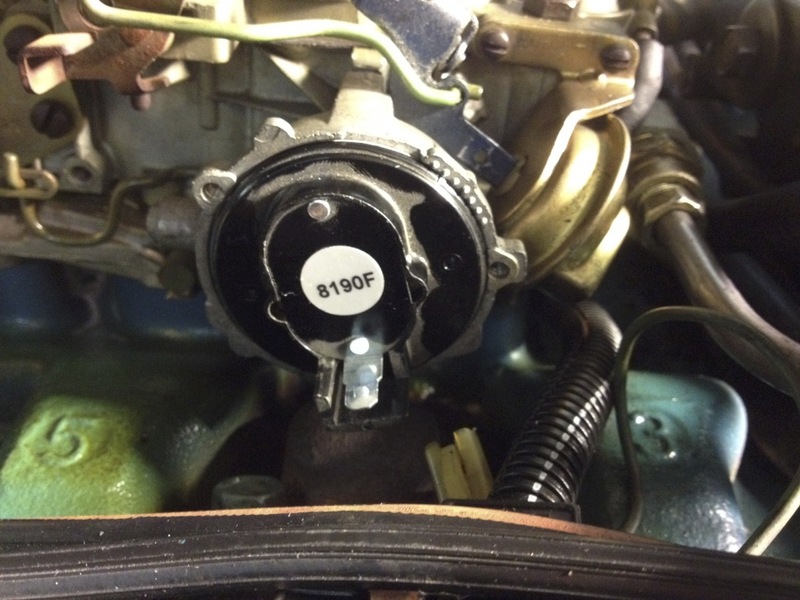 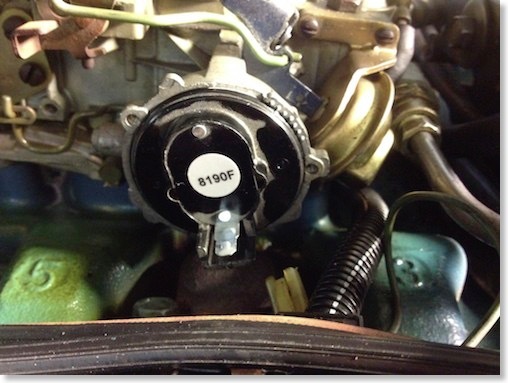 2sasilverbullet sent me the following two pictures below to show what covers have to get removed to be able to access the indicator bulb. 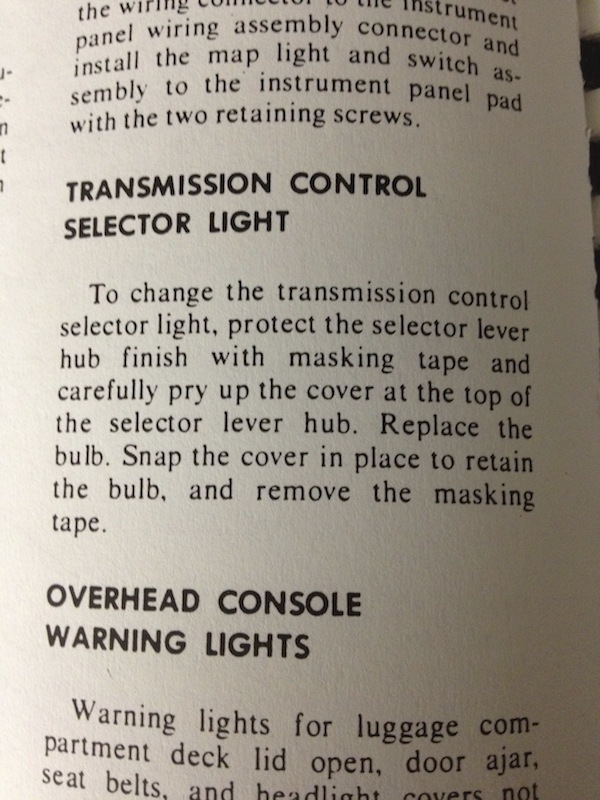 You have to carefully remove these covers and you then get access to the bulb. 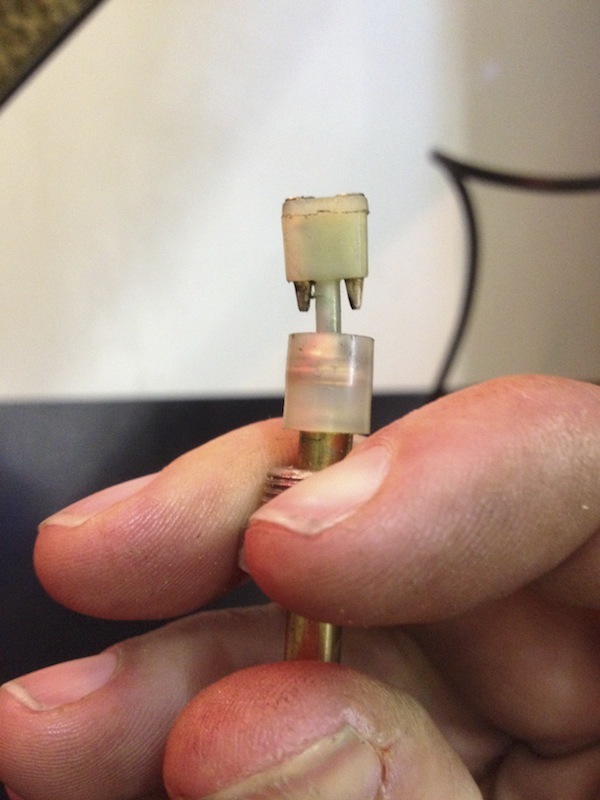 The bulb is then inserted into the hole where you can see the finger. 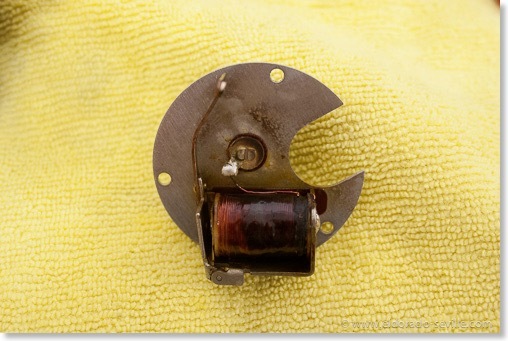 After the bulb is replaced its pretty tricky to put the covers back into place. 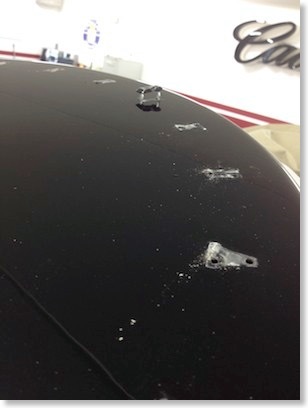 Be very careful to not break the plastic covers! 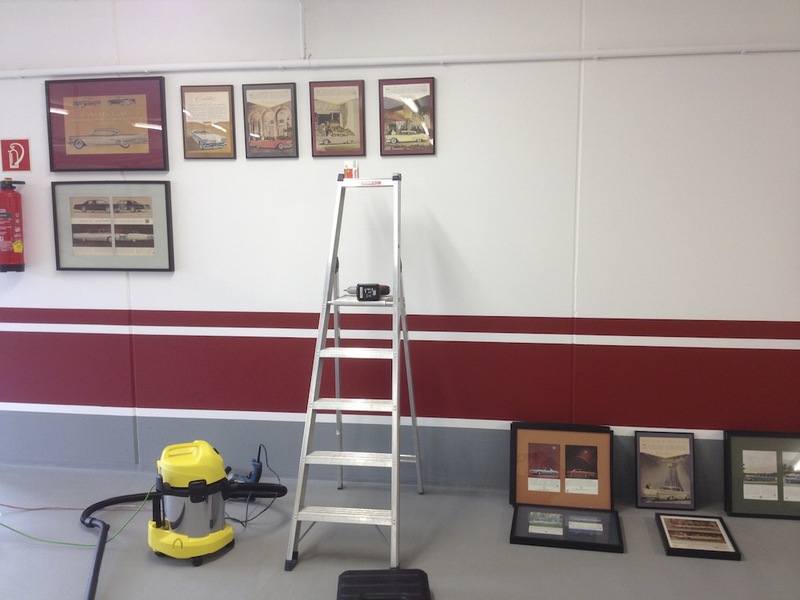 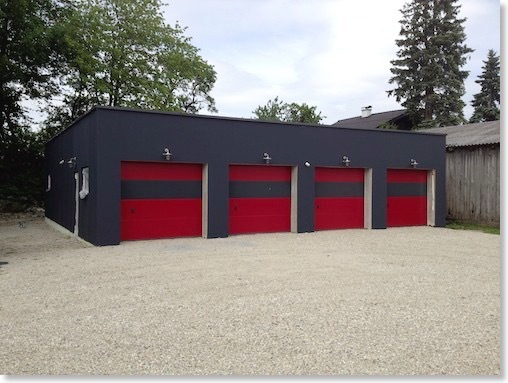 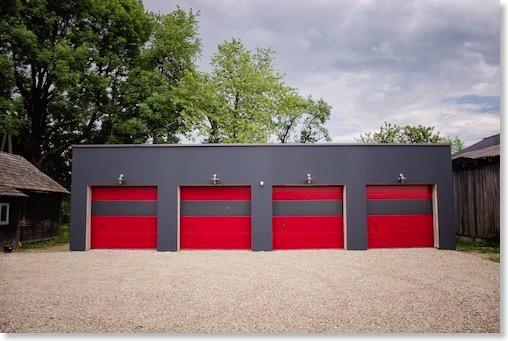 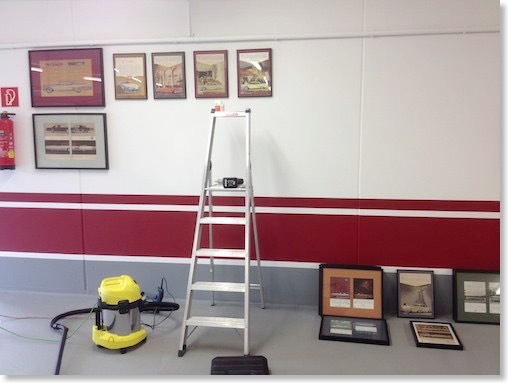 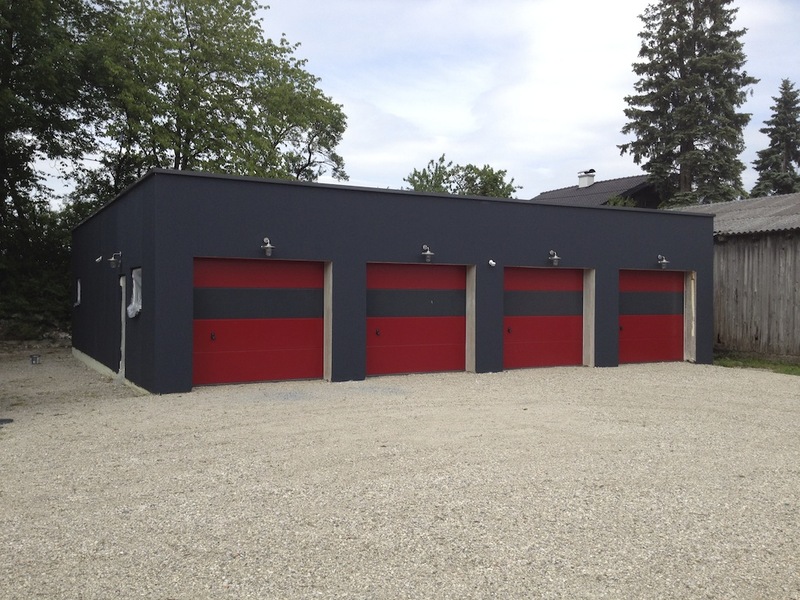 I started painting my Garage. 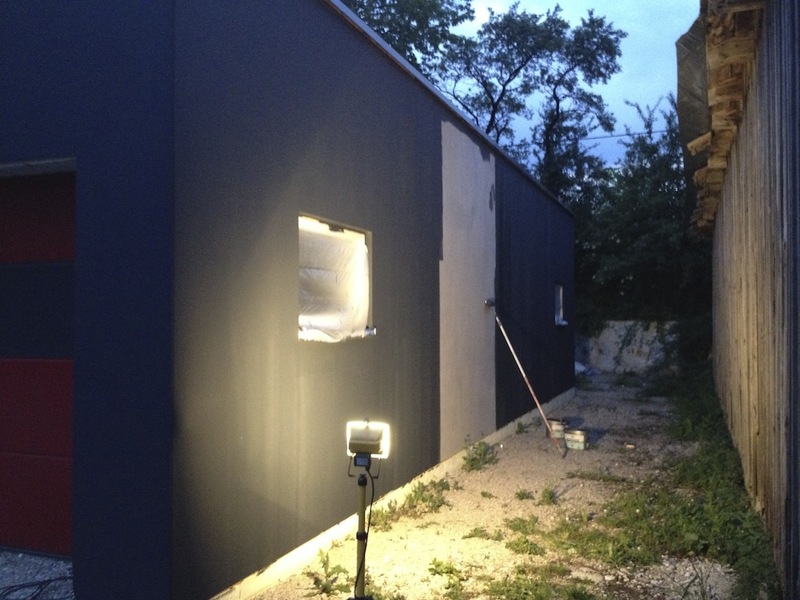 I started painting with the first coat of dark grey. 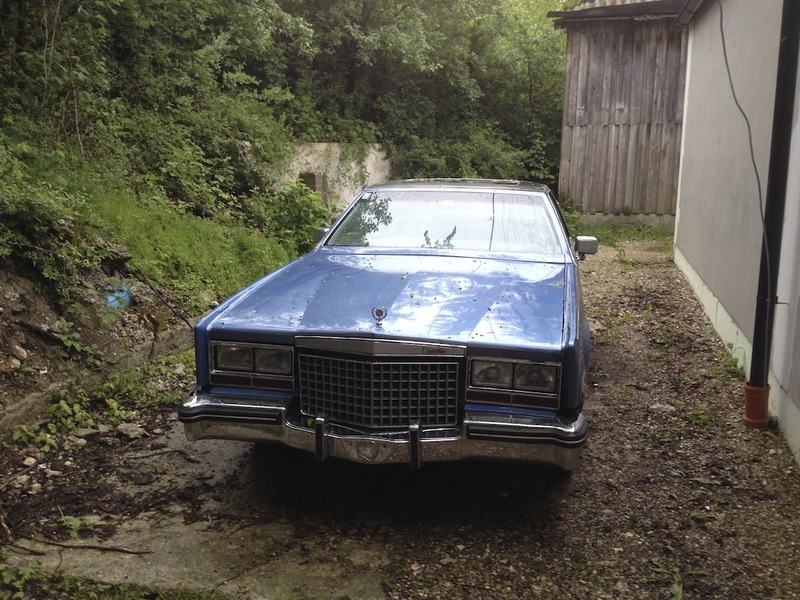 My friends and I bought a 1980 Biarritz. 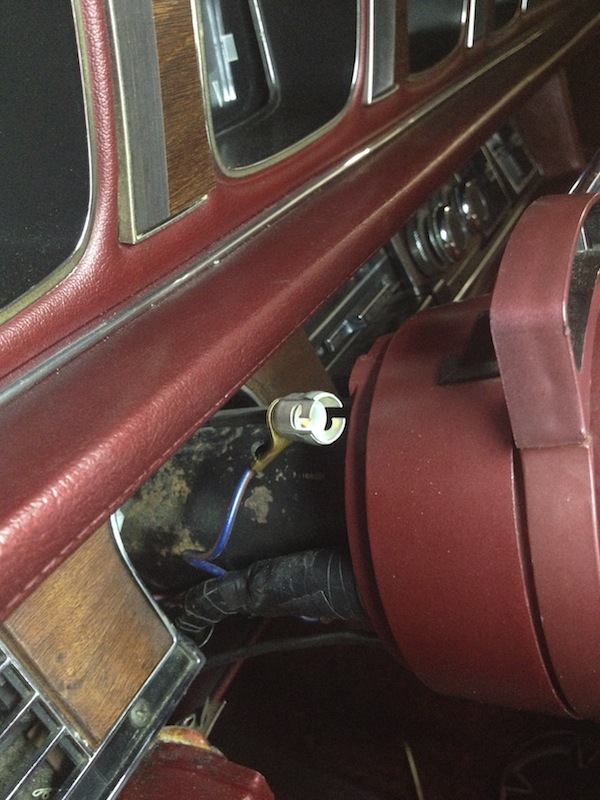 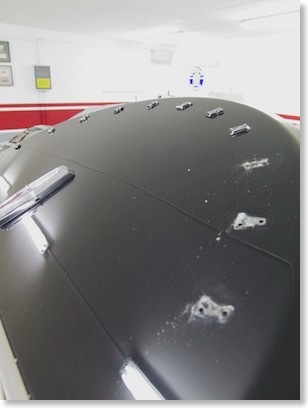 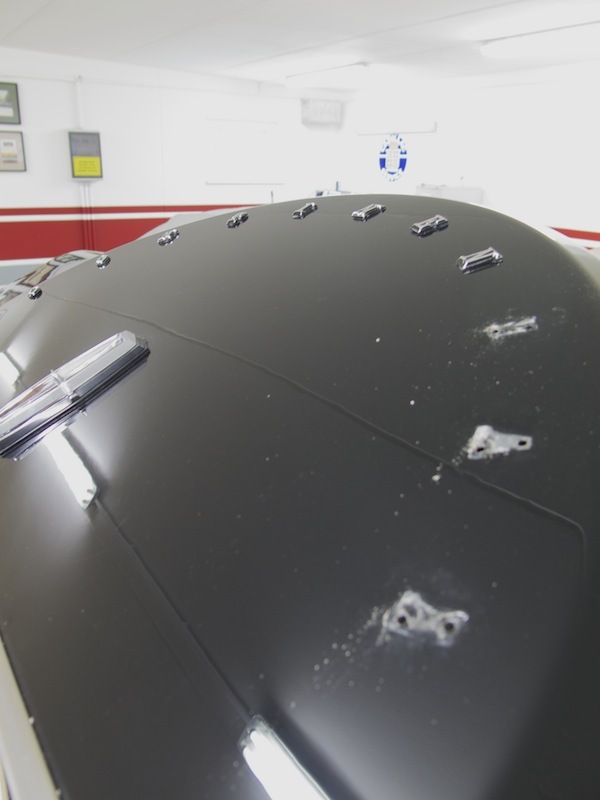 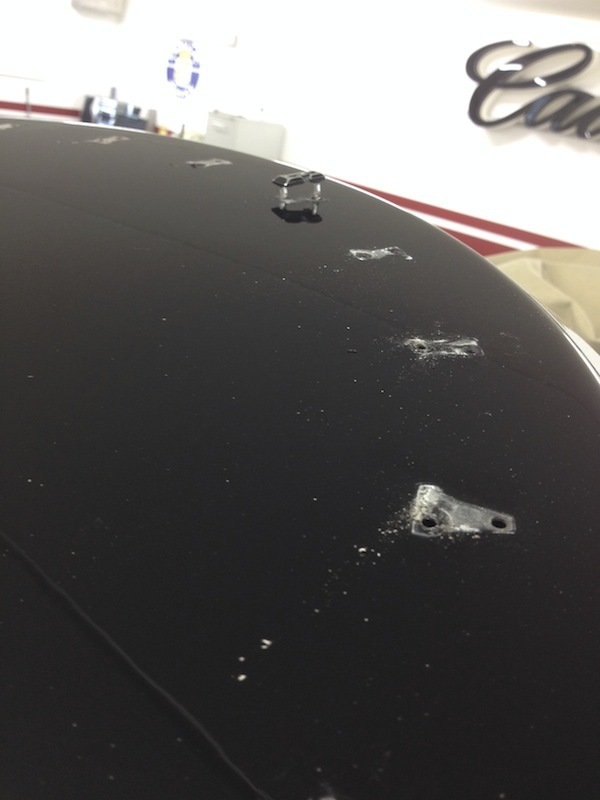 Also the trunk is full of parts for this car - the major issue is rust around the vinyl roof. 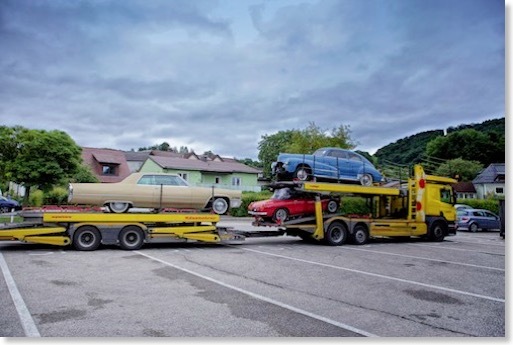 Best thing is that it cost us almost nothing. 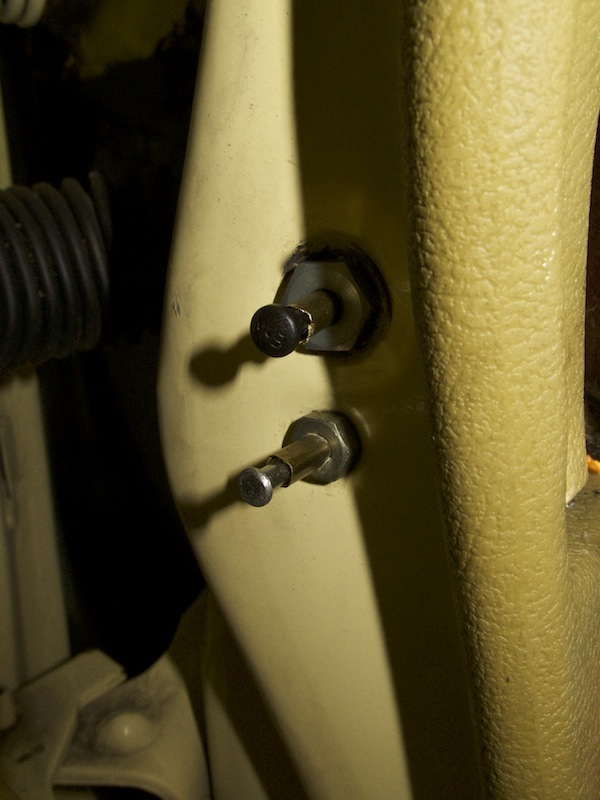 The Biarritz is still drive-able - but the body is very rusty. 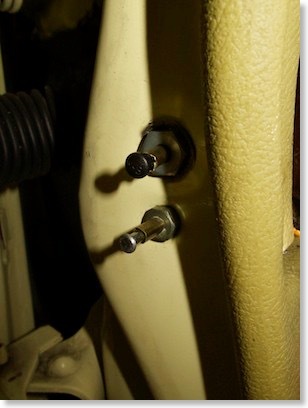 The technical condition its pretty good though. 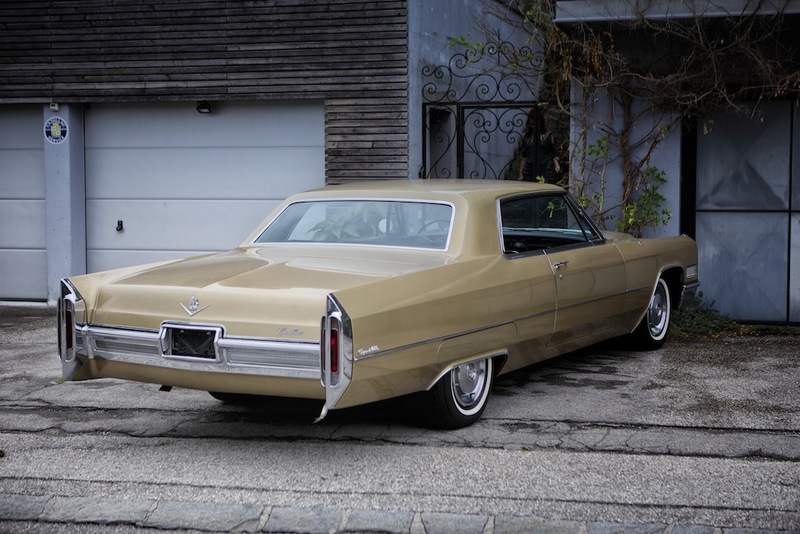 It's resting behind the garage at the moment. 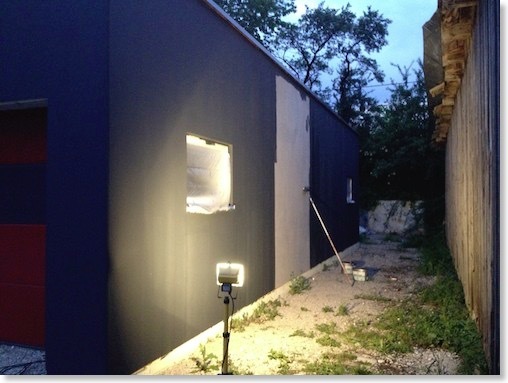 Will try to build a shelter for it. 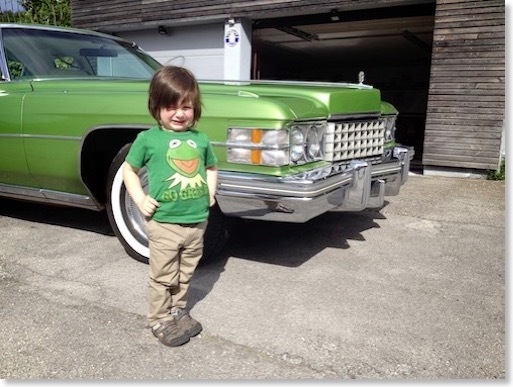 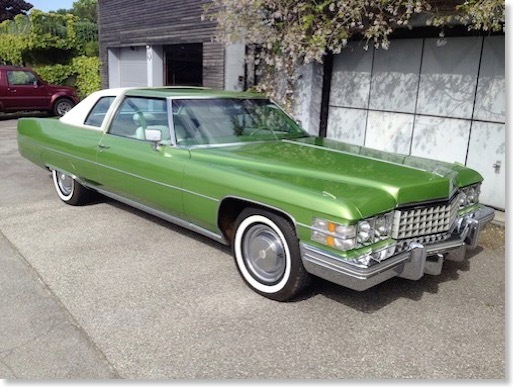 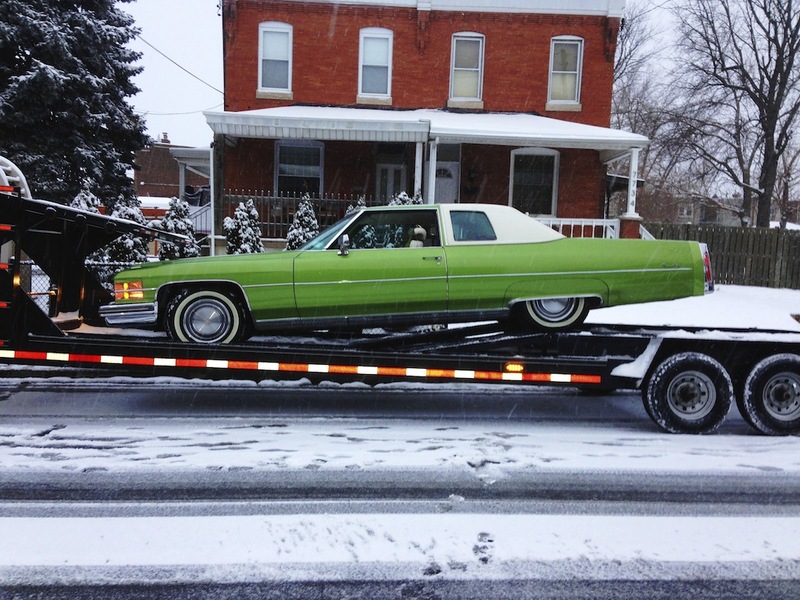 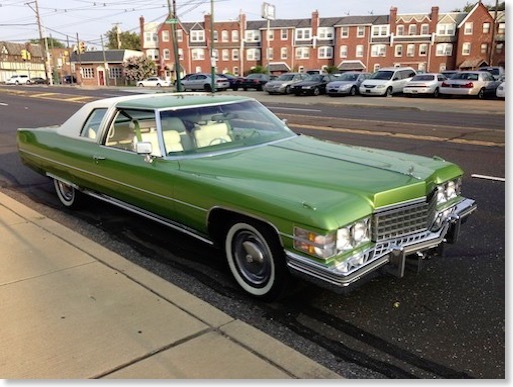 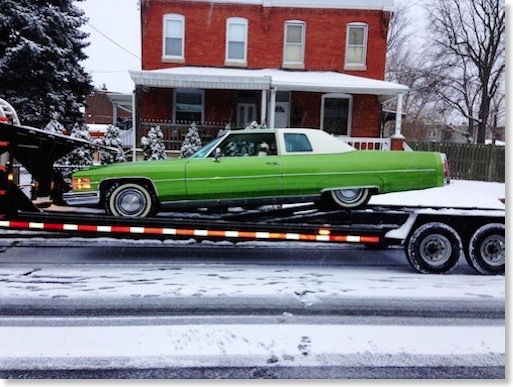 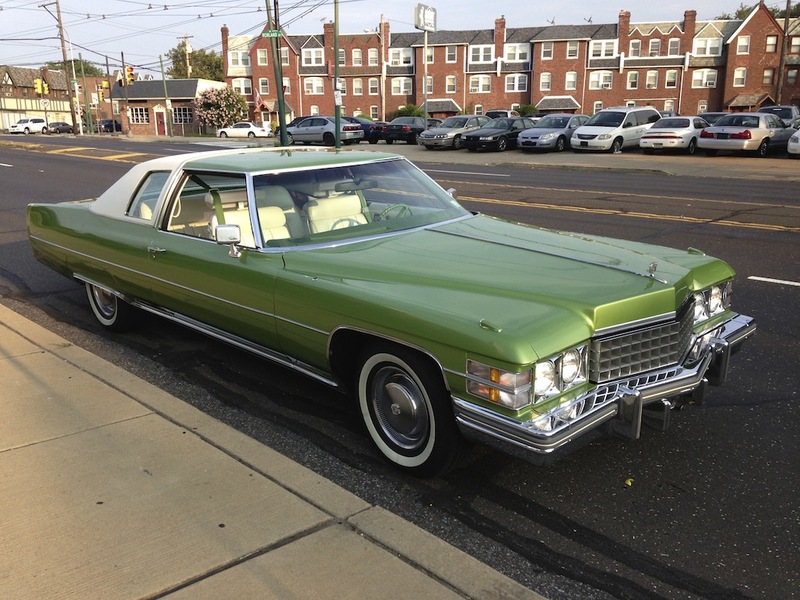 The 1974 Coupe deVille has arrived. 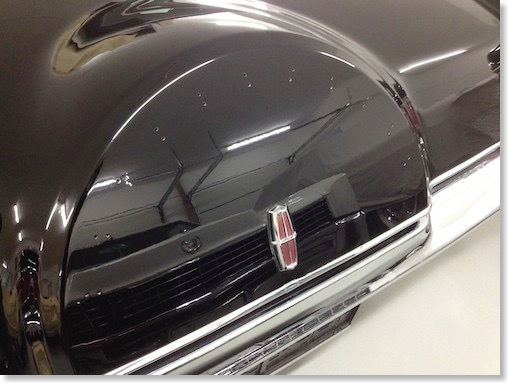 I will polish the paint to perfection soon. Did a little test spot and it came out great. 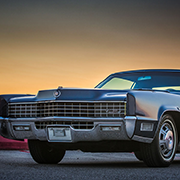 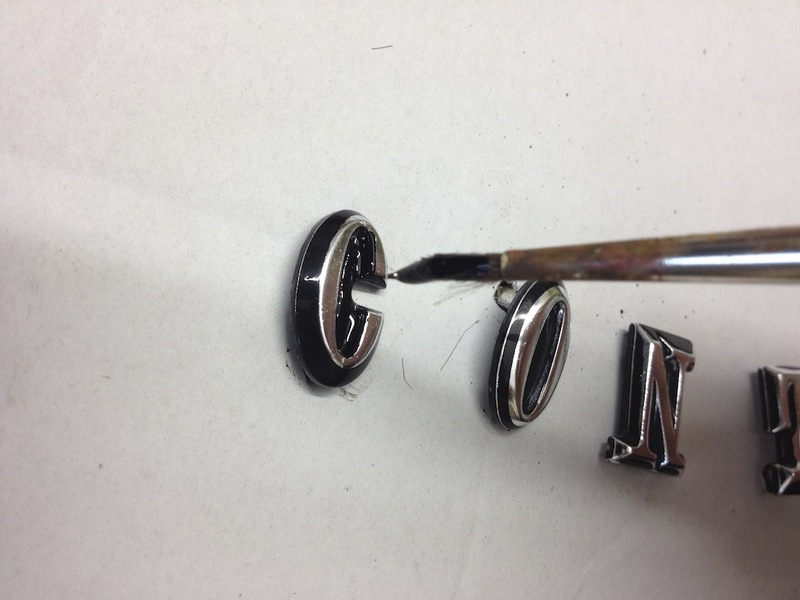 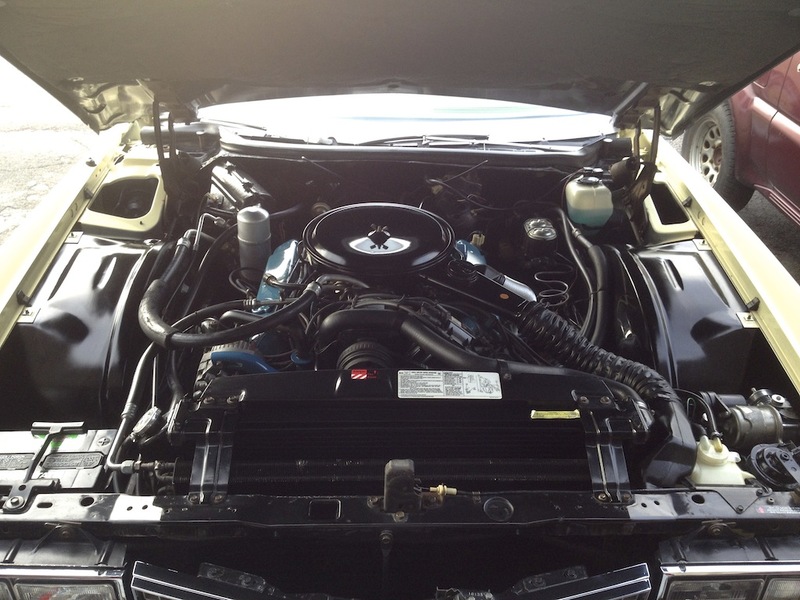 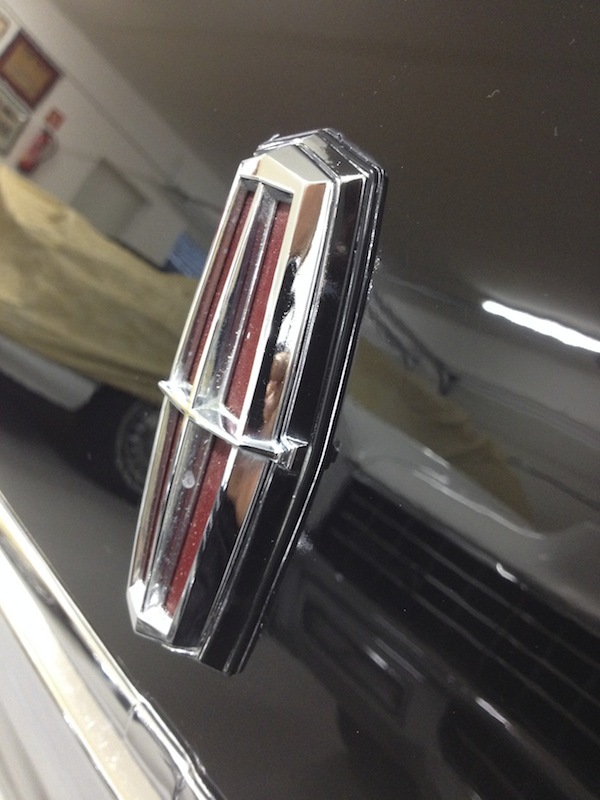 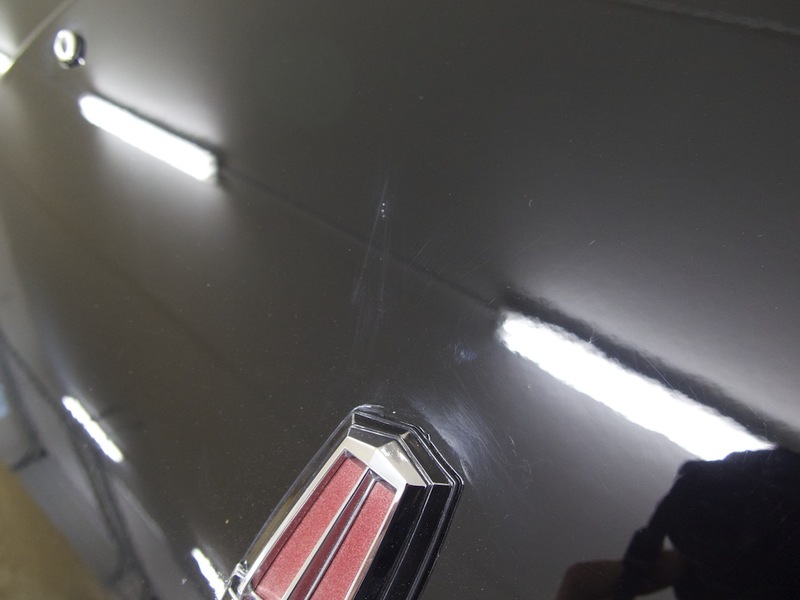 A fantastic 1966 Coupe deVille is coming! 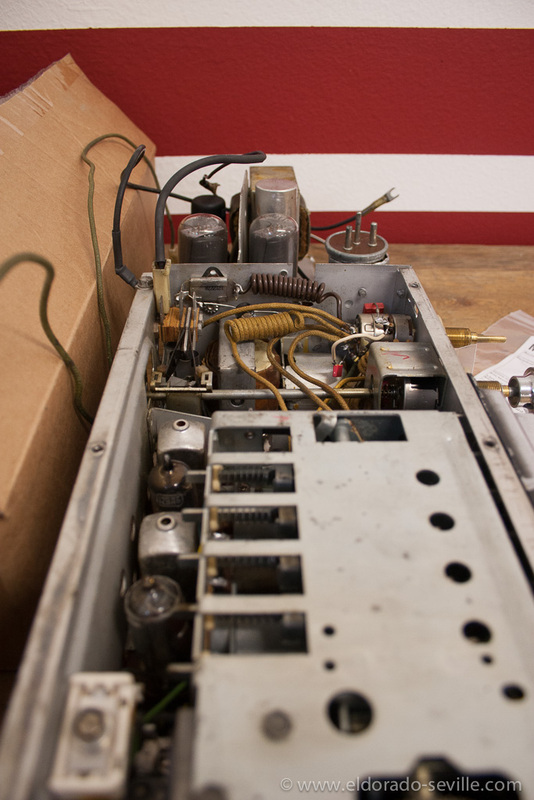 Time capsule! 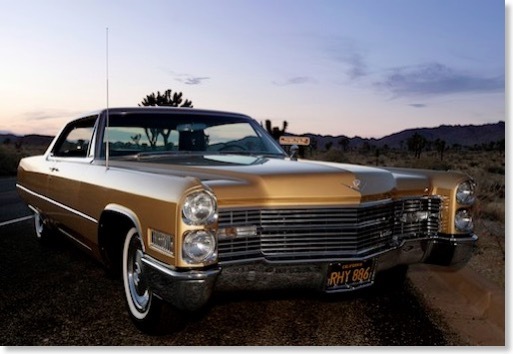 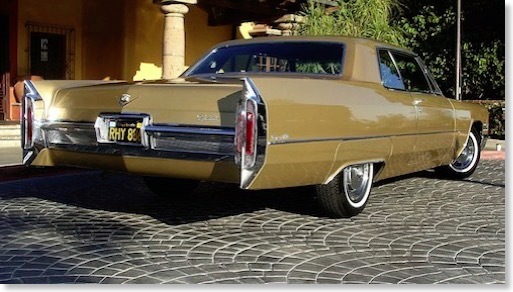 I found a fantastic, low mileage all original 1966 Cadillac Coupe deVille in Los Angeles through Facebook. This 21k miles, very well optioned car will be on its way to Austria hopefully very soon. 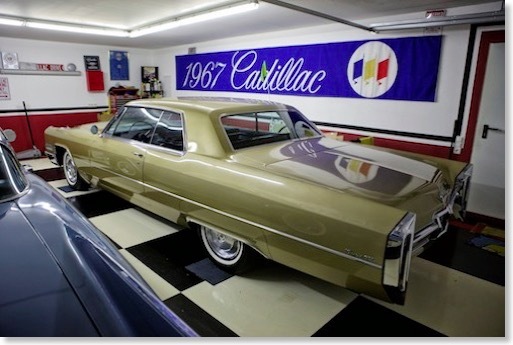 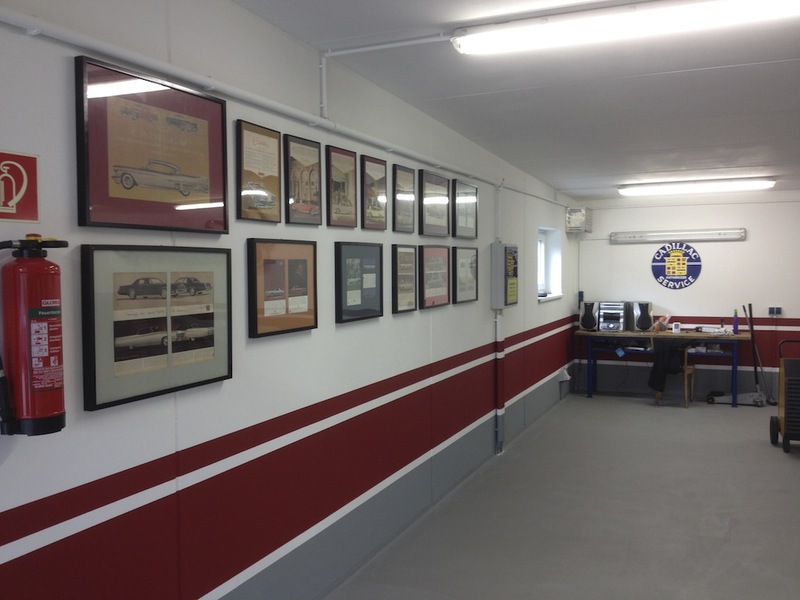 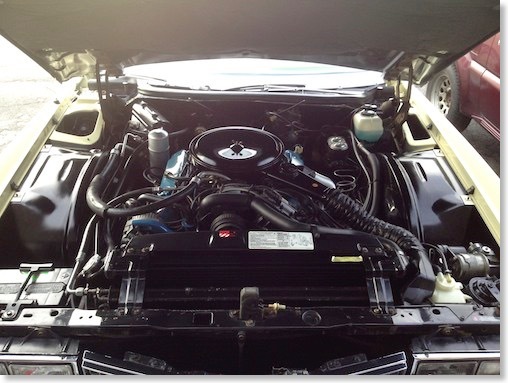 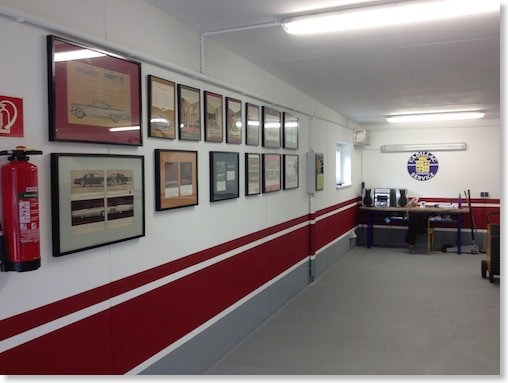 The car is all original - including original paint and is in very good mechanical condition as well. 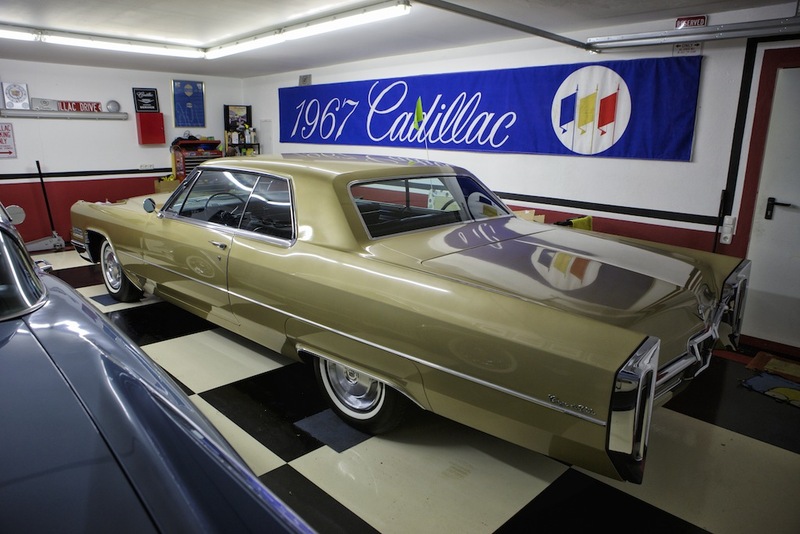 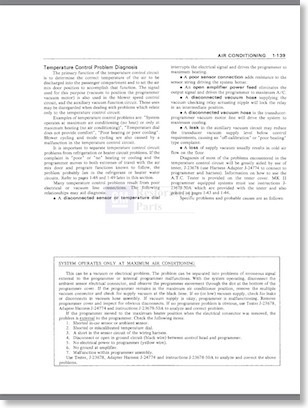 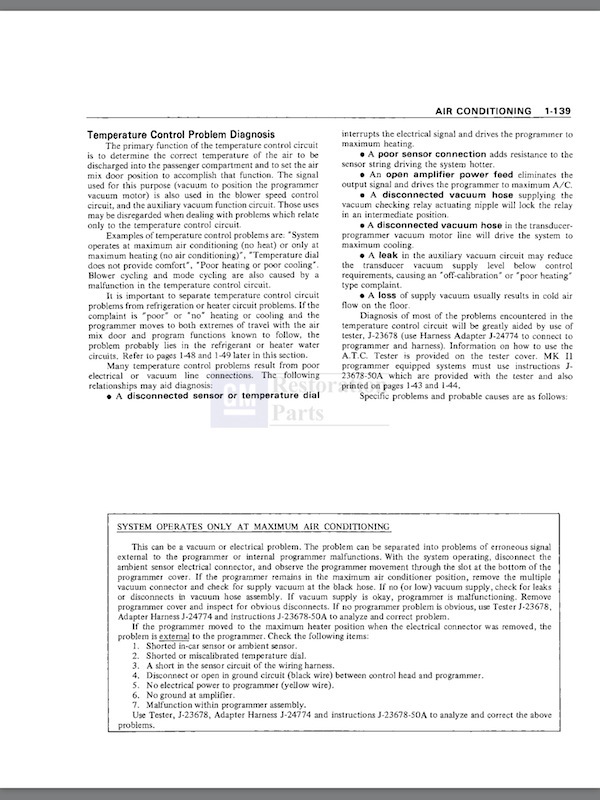 It has most of the available options that were offered in 1966. 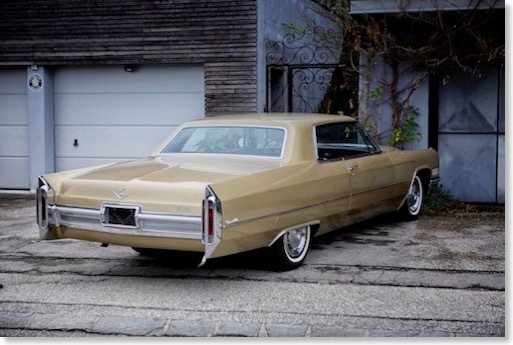 Its very rare to find a Coupe deVille without a vinyl top. It also has the ultra rare and very expensive bucket leather seats with center console. 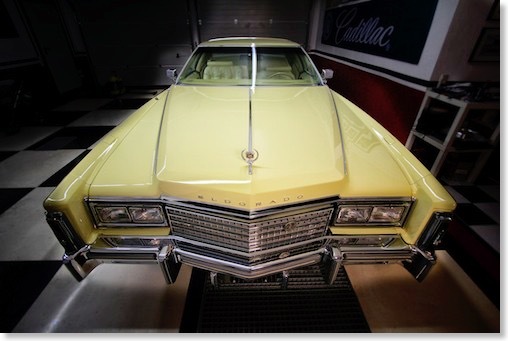 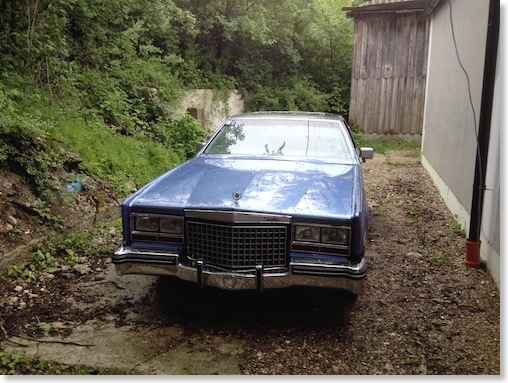 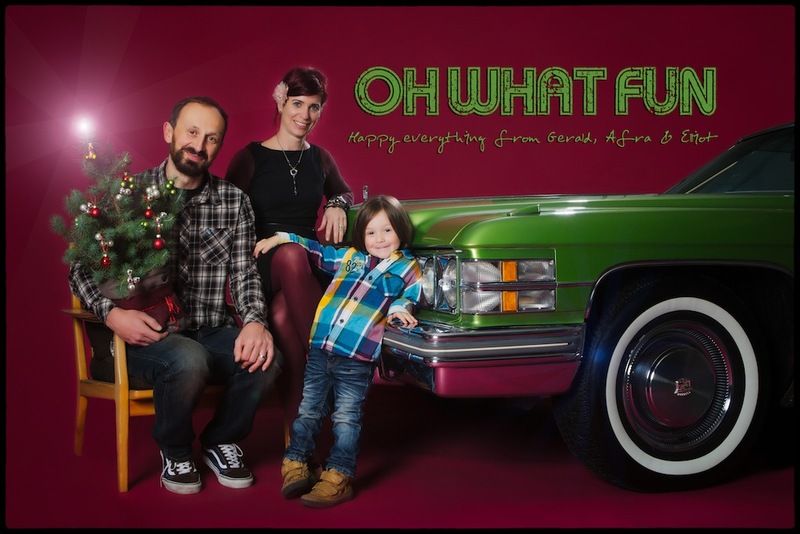 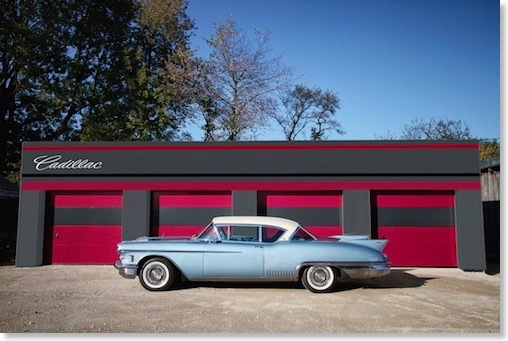 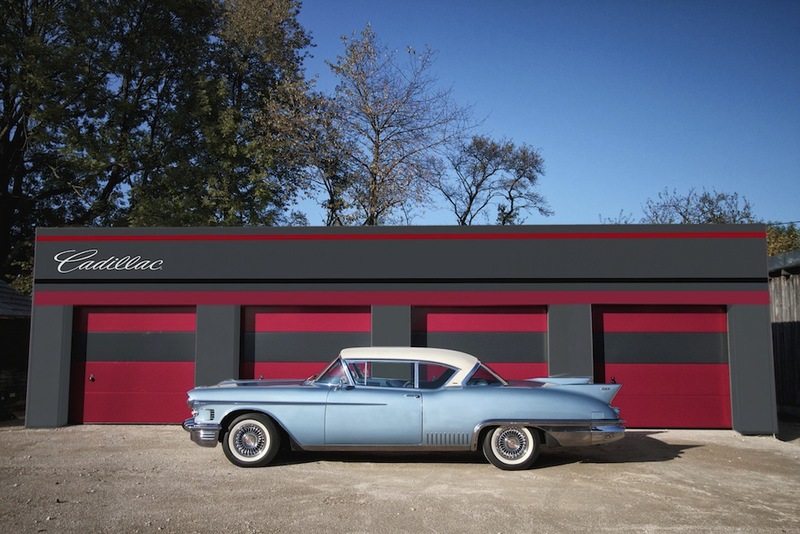 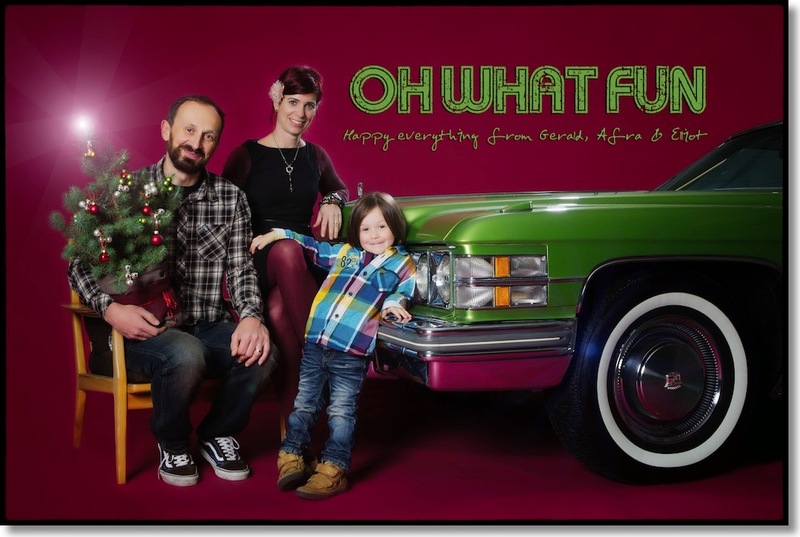 The car comes from a Cadillac Collector and was pampered its entire life. 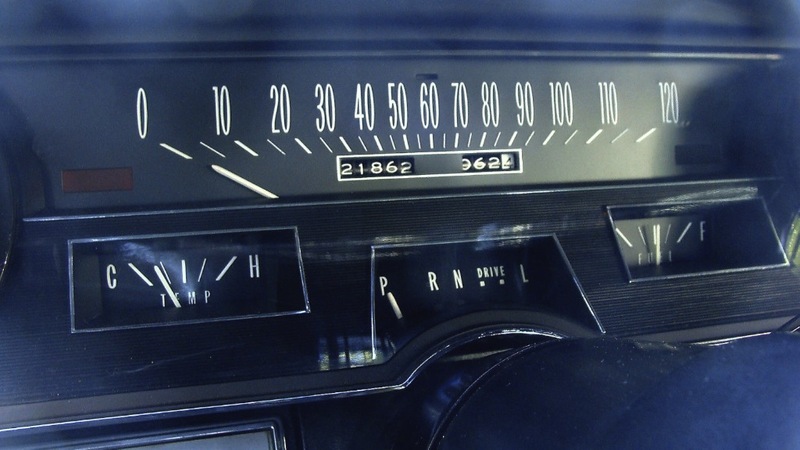 The mileage is fully documented and accurate. 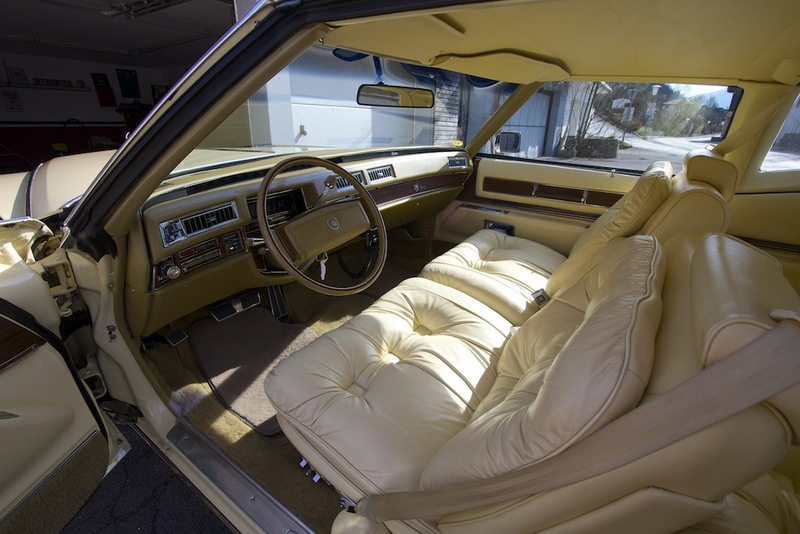 I´m a big fan of the “Antique gold metallic" paint and the black leather interior is absolutely stunning. 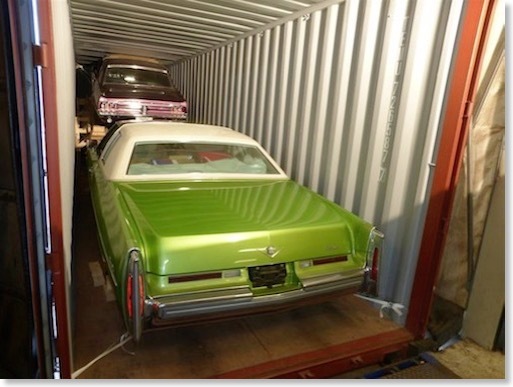 Can´t wait to see the car in real life in about 10 - 12 weeks after it has crossed the Atlantic. 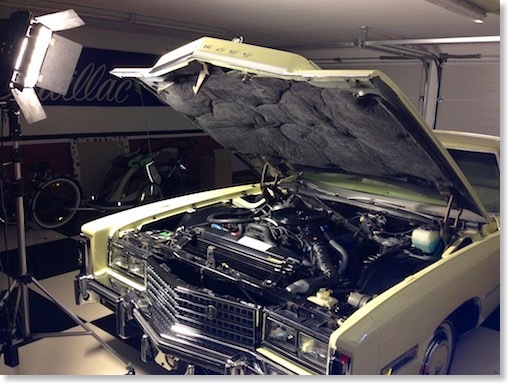 More details and pictures will follow once the car is in my garage. 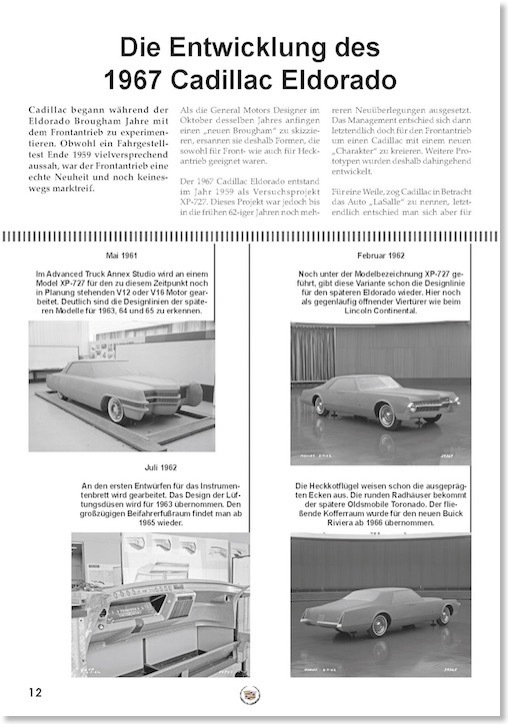 My 1967 Eldorado Article in the German Cadillac Club Magazine. 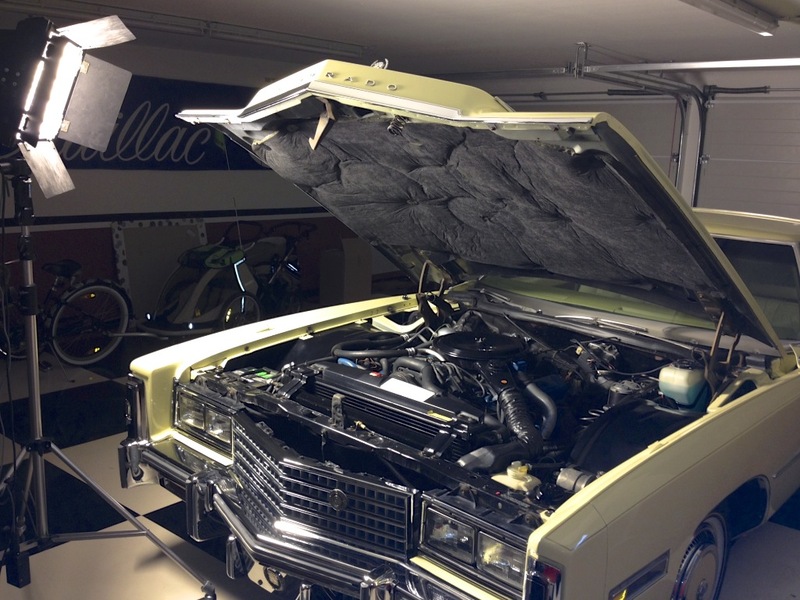 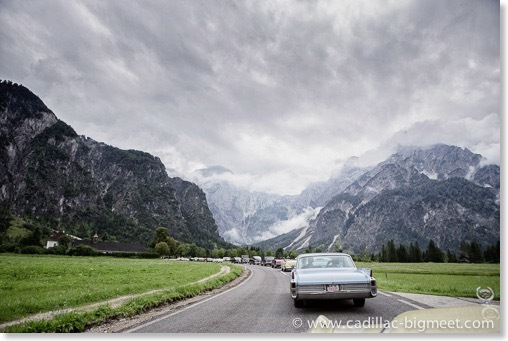 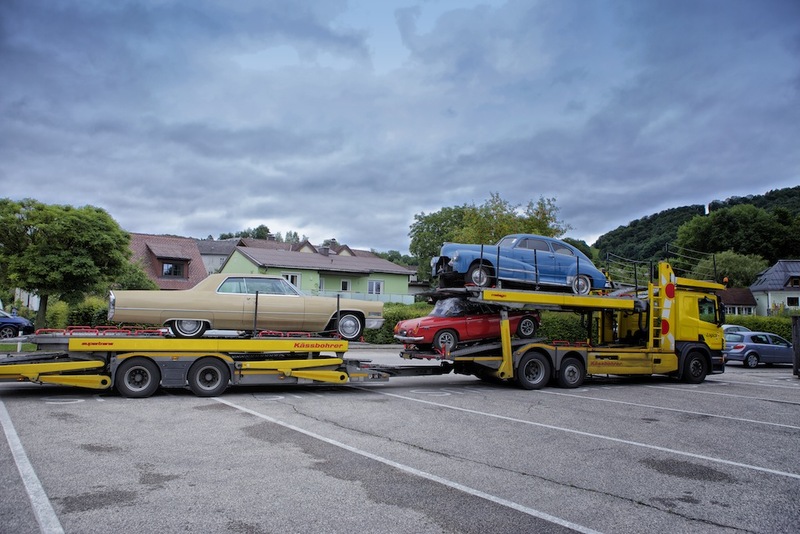 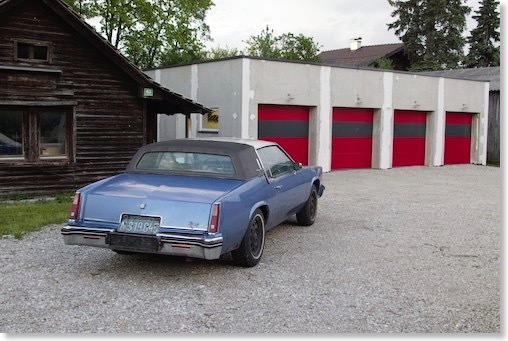 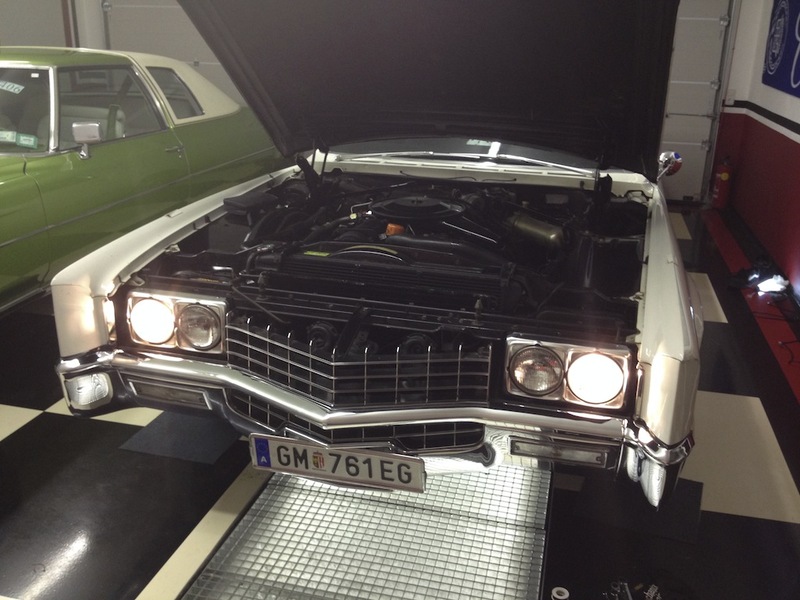 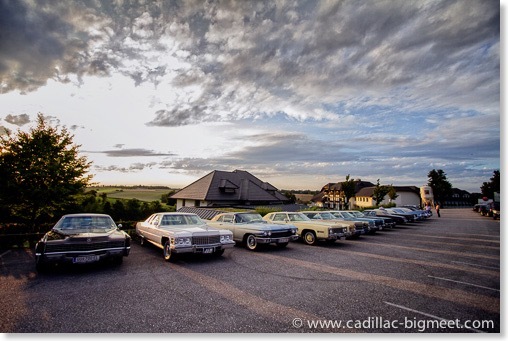 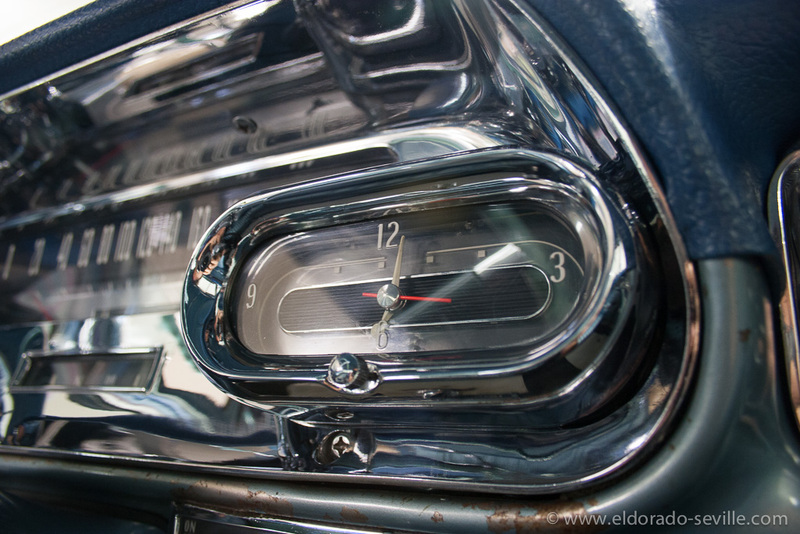 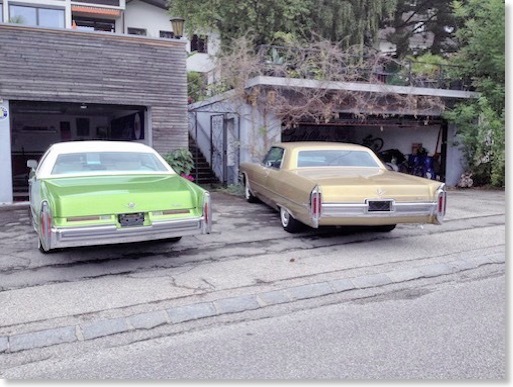 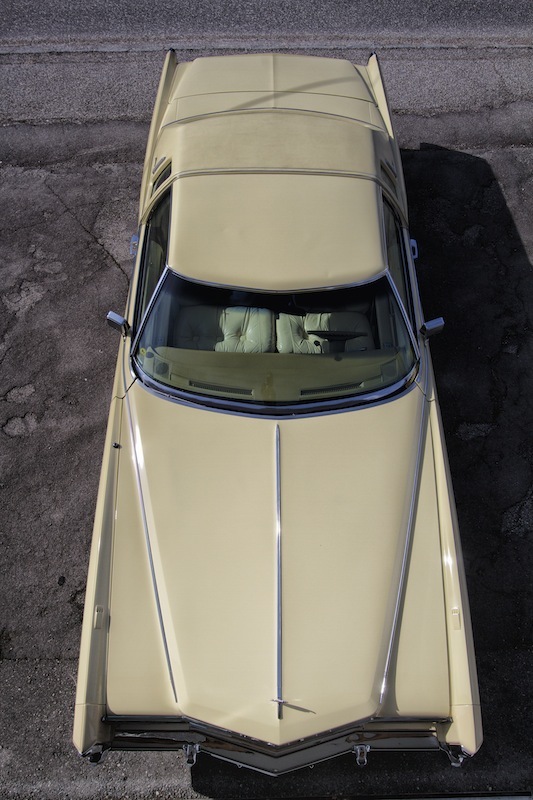 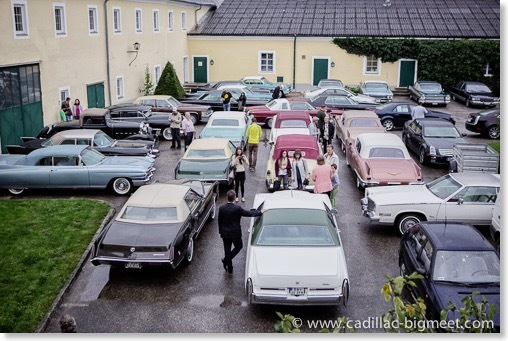 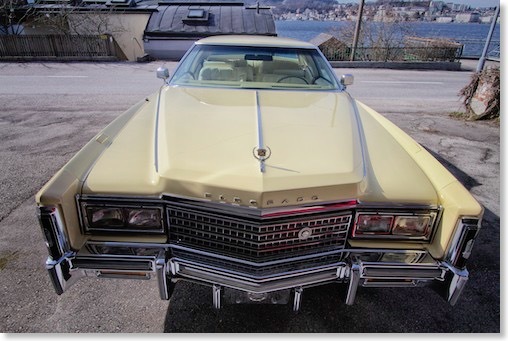 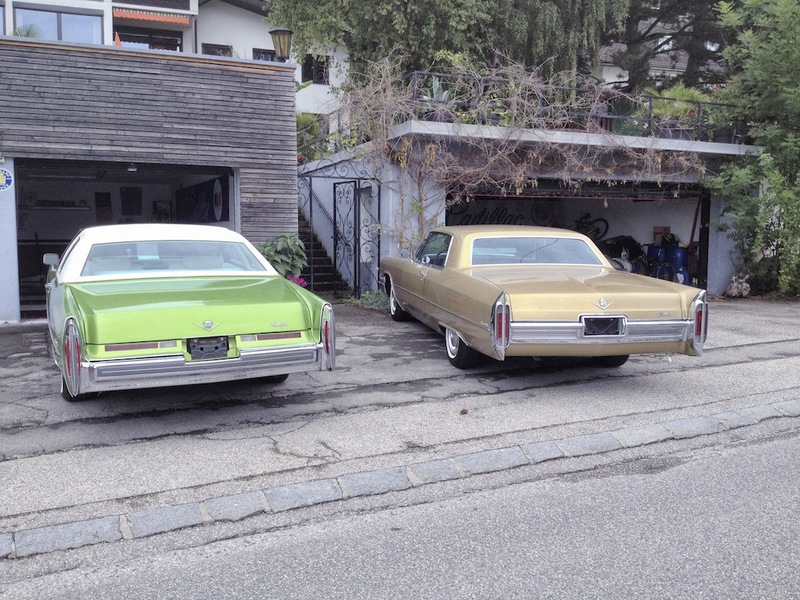 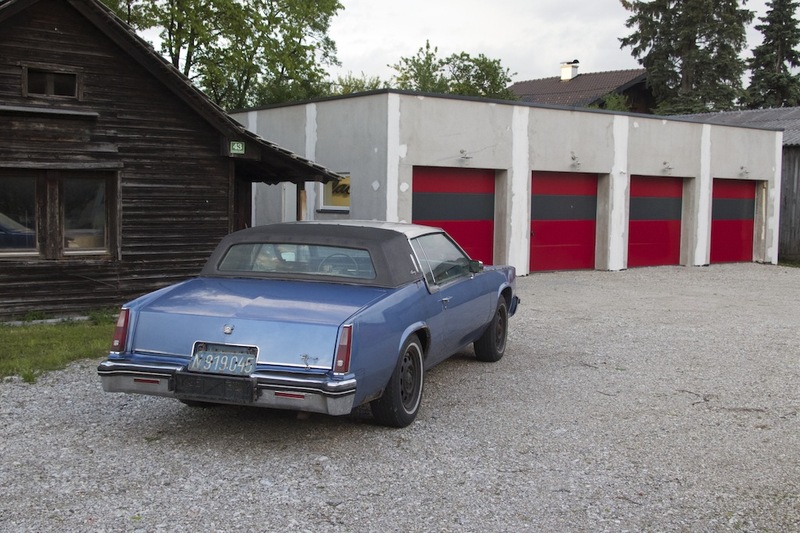 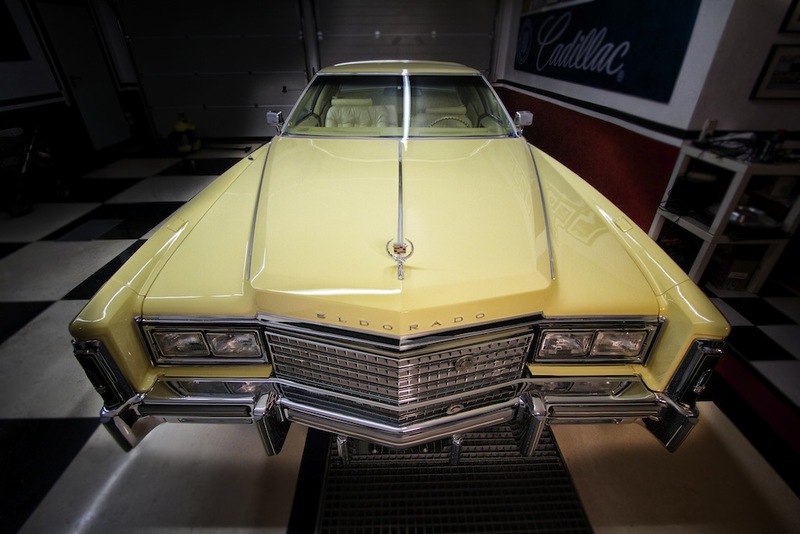 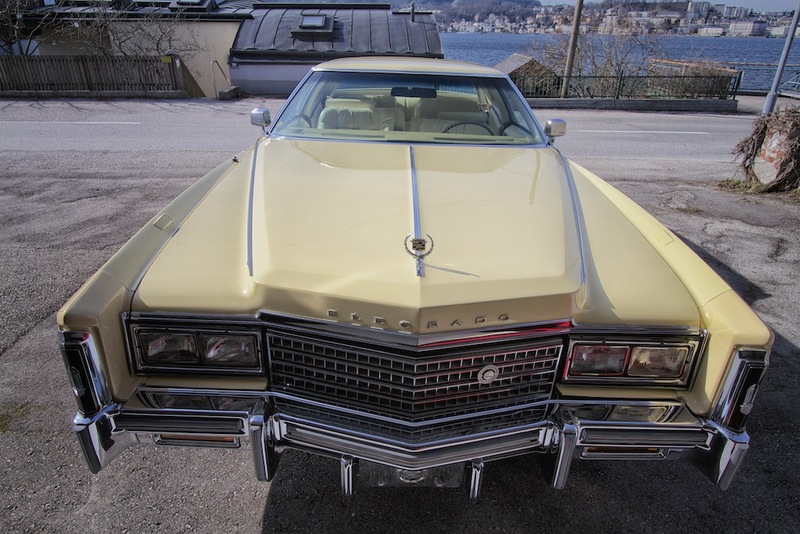 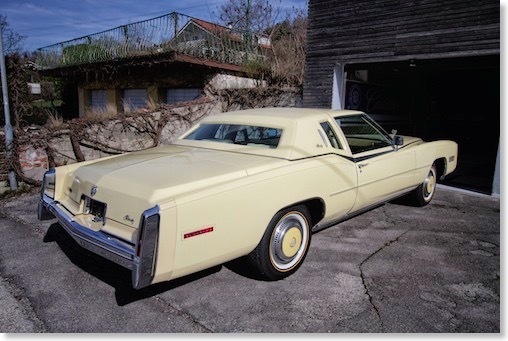 The Classic Cadillac Club of Germany asked me if they could use the history of the 1967 Eldorado which I wrote for my website as an article for their club magazine "Der Standard" along with a couple of images I took of my 67 Eldorado. 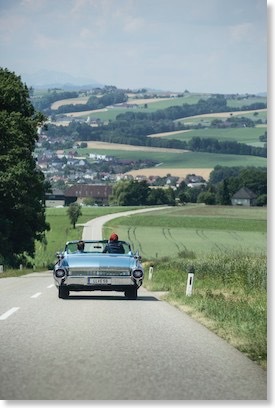 I felt honored and Christian Doerk made a nice 9 page article for the magazine out of my pictures and my text. 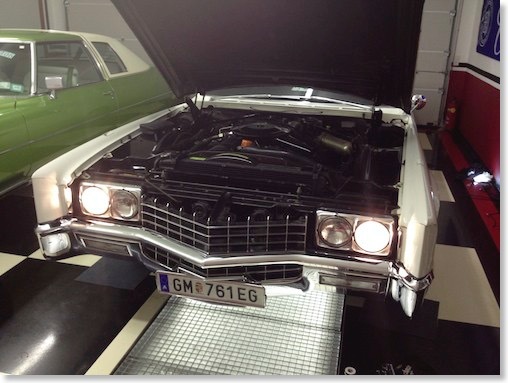 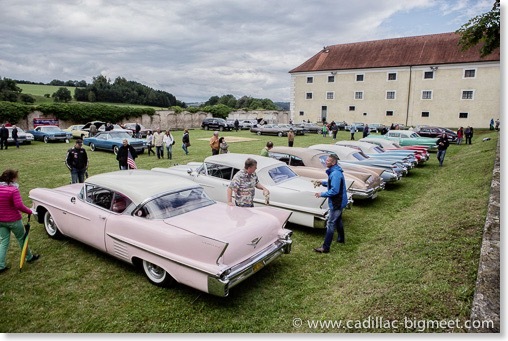 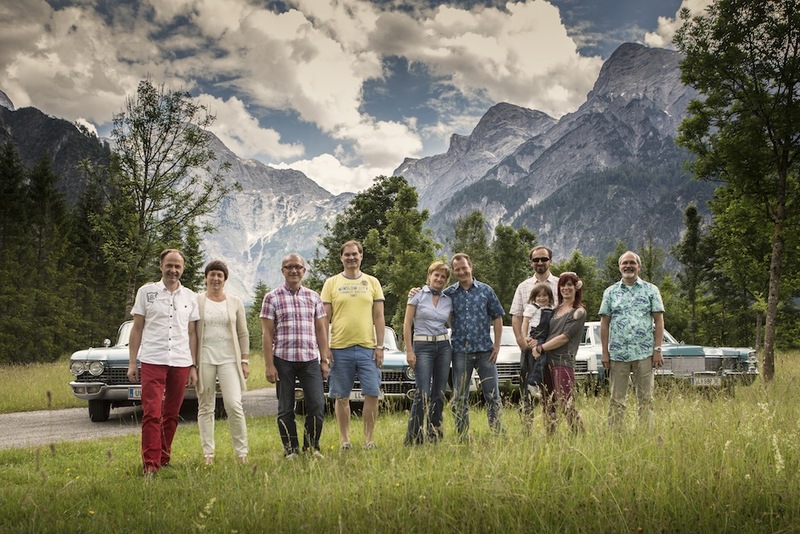 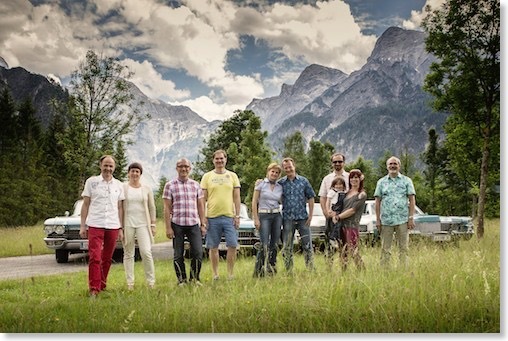 The Cadillac Club of Finland will also feature this article in one of their next club magazines. 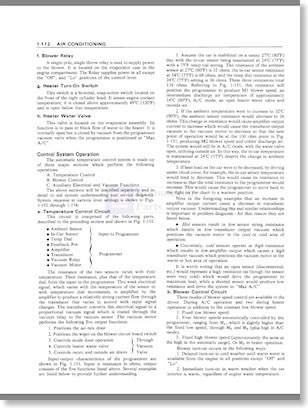 The first page of the article © "Der Standard"